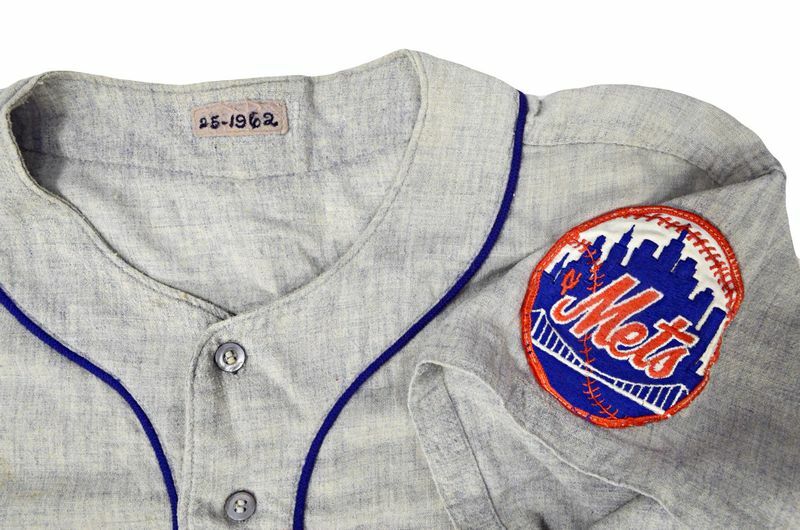 Having lost both NL teams to the west coast in 1958, New York returns to the NL in 1962. 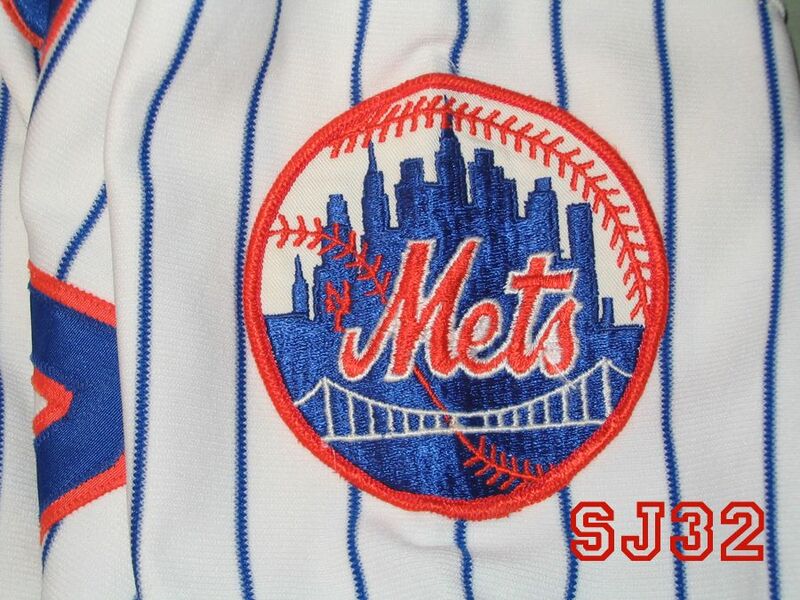 Somehow the scheme of Dodger blue and Giants orange along with the Giants logo works perfectly for the Mets. 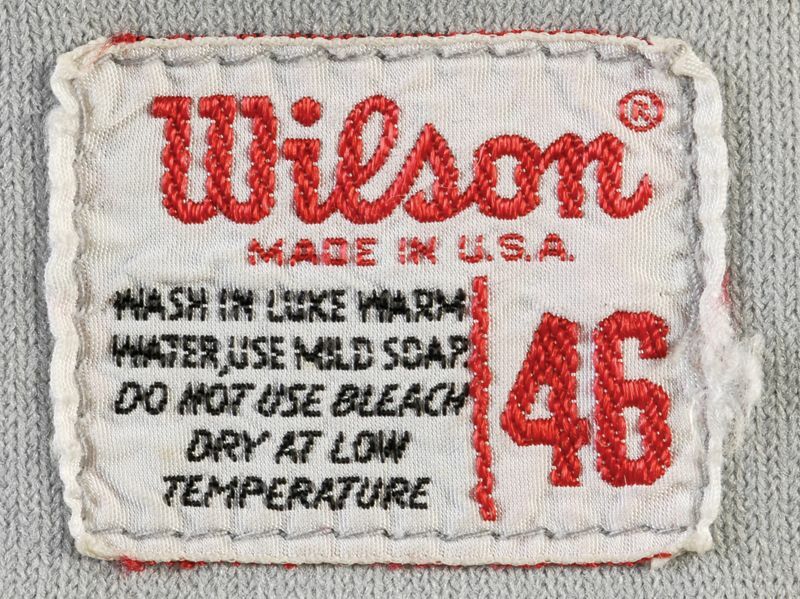 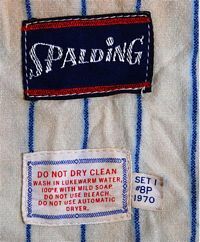 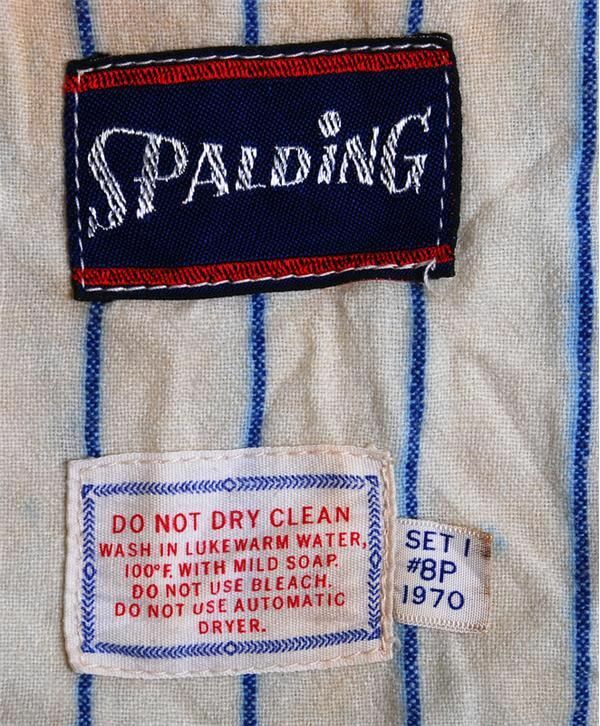 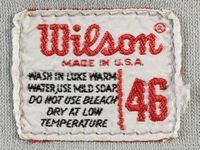 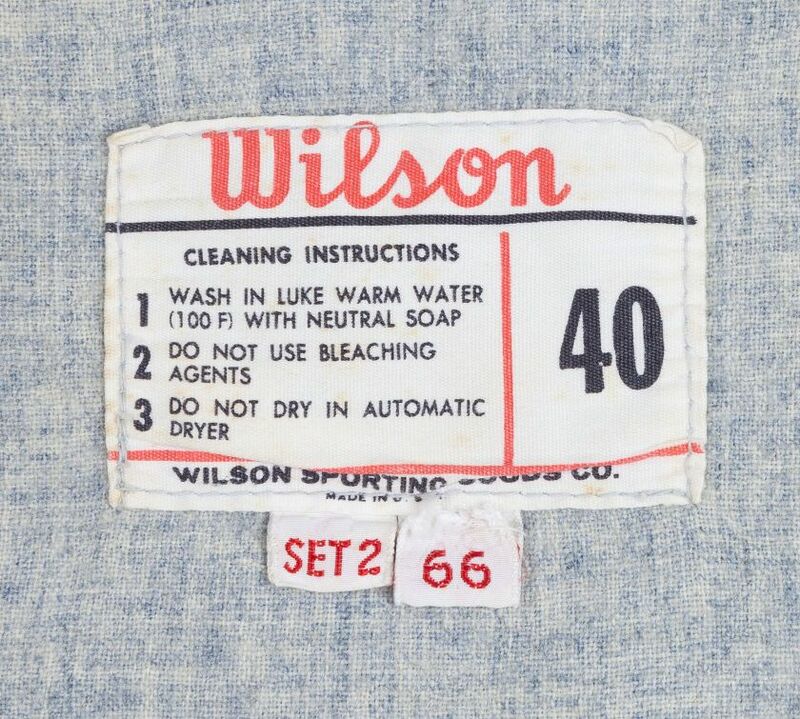 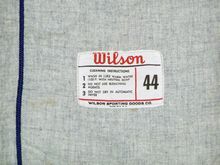 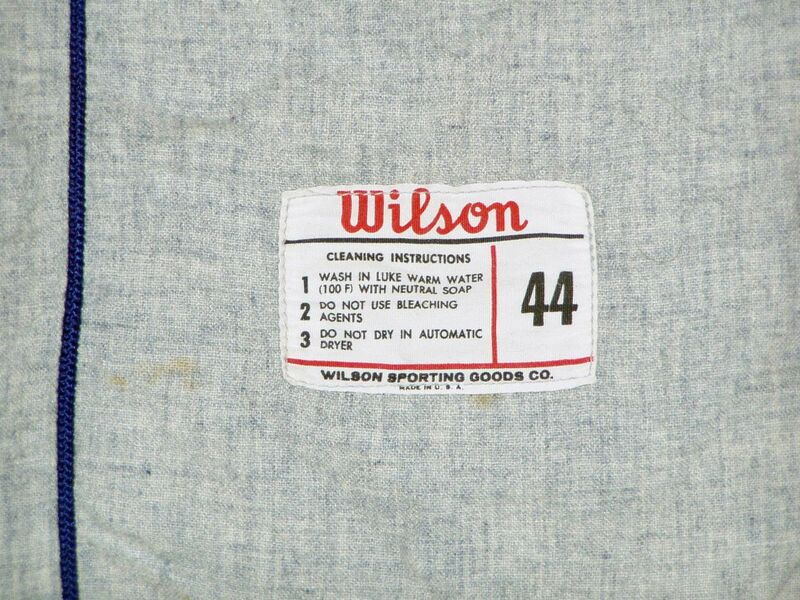 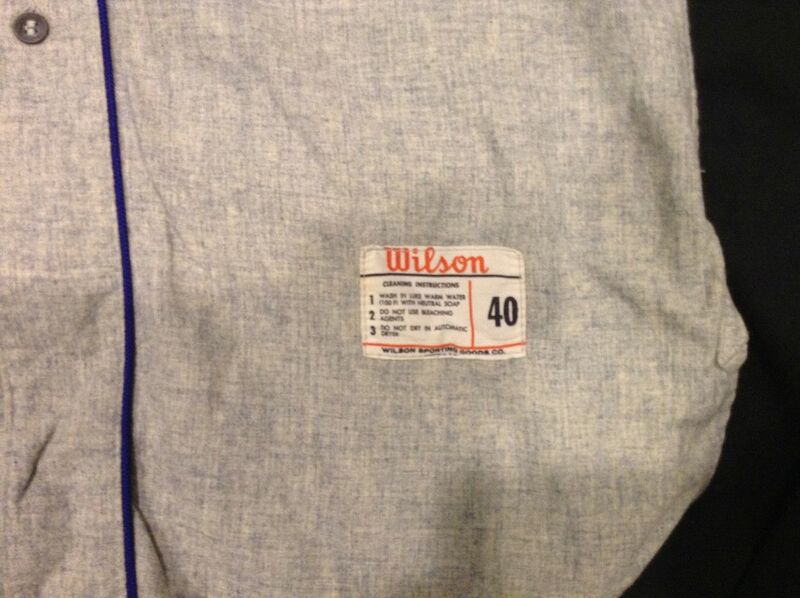 Wilson and Spalding jerseys have different number fonts. 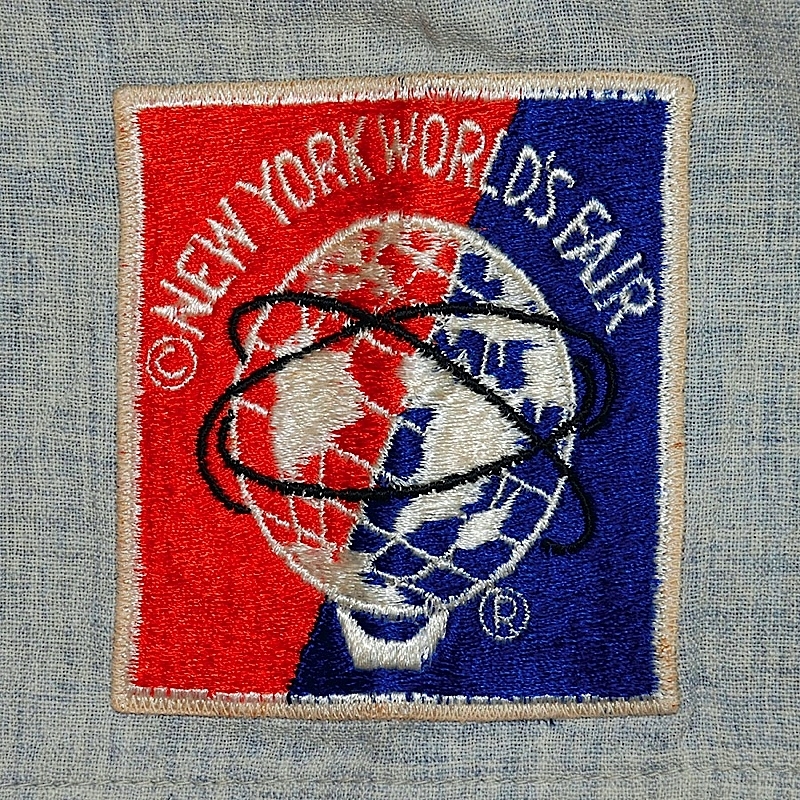 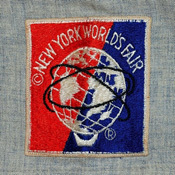 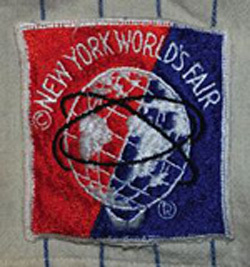 World's Fair patch was worn in 1964 and 1965. 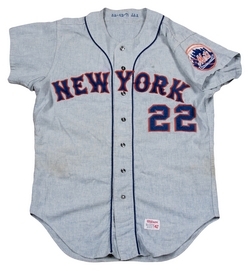 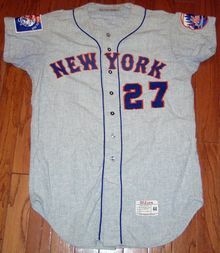 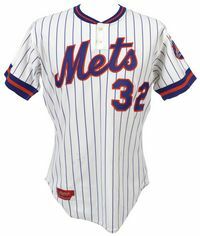 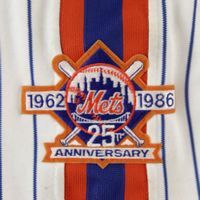 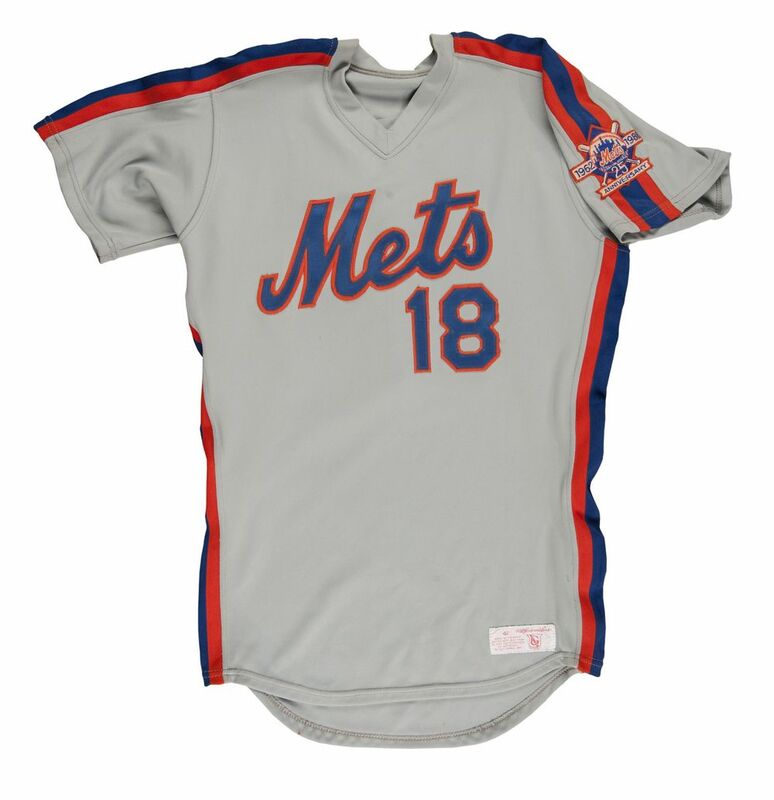 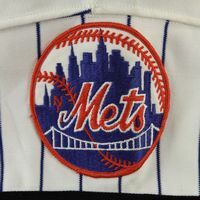 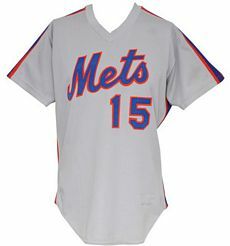 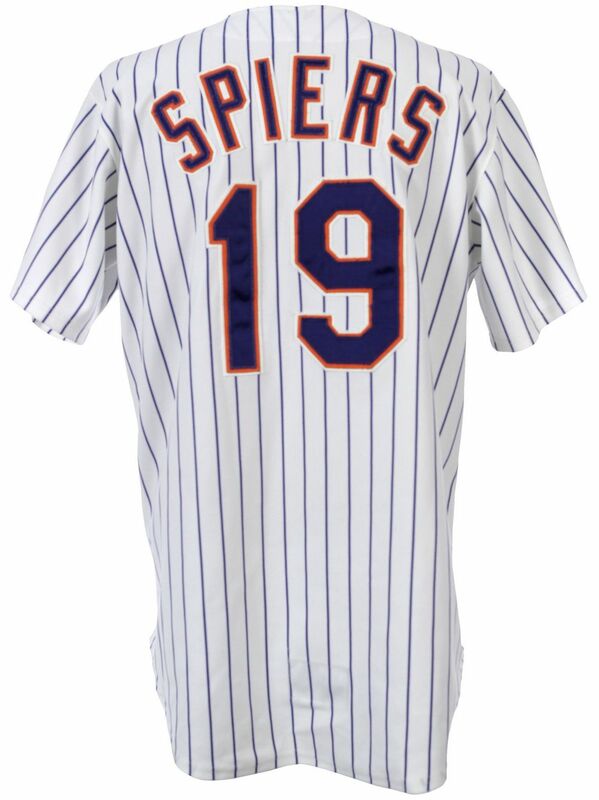 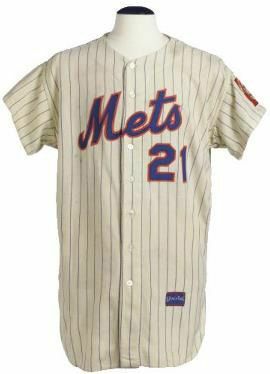 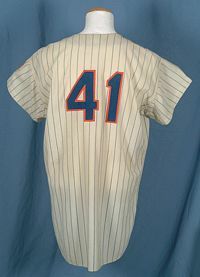 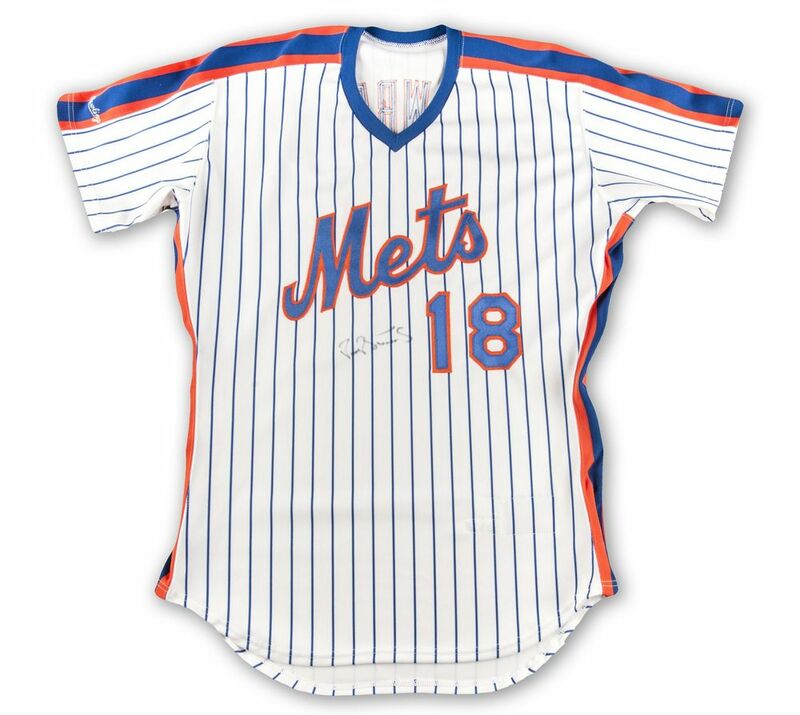 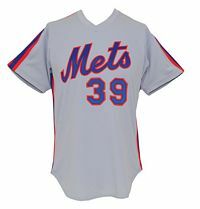 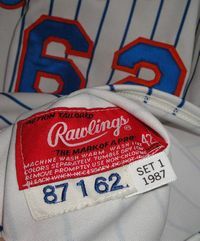 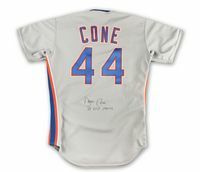 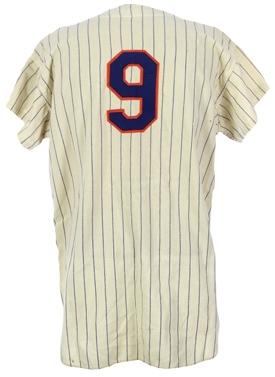 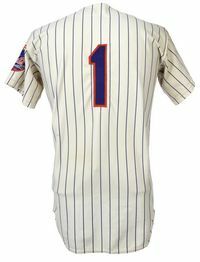 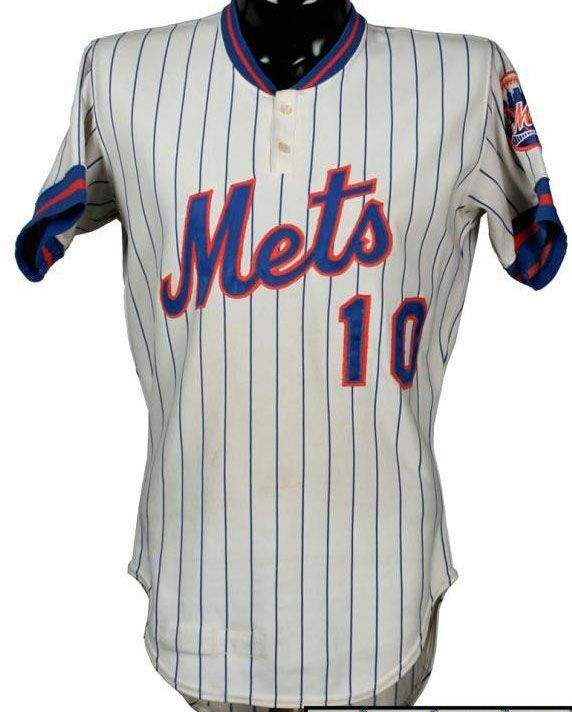 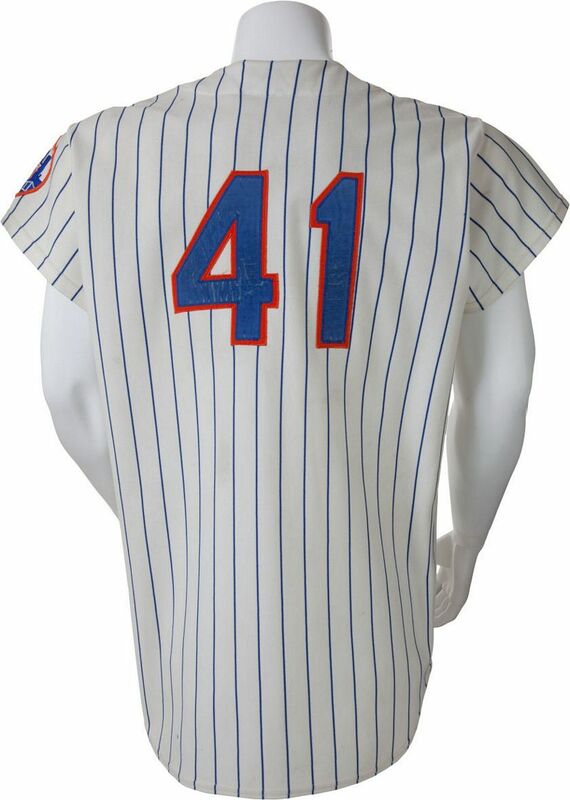 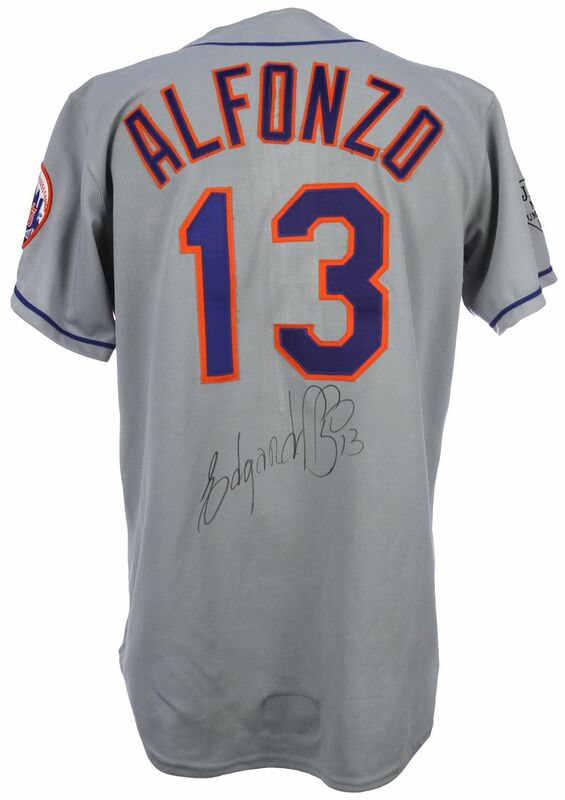 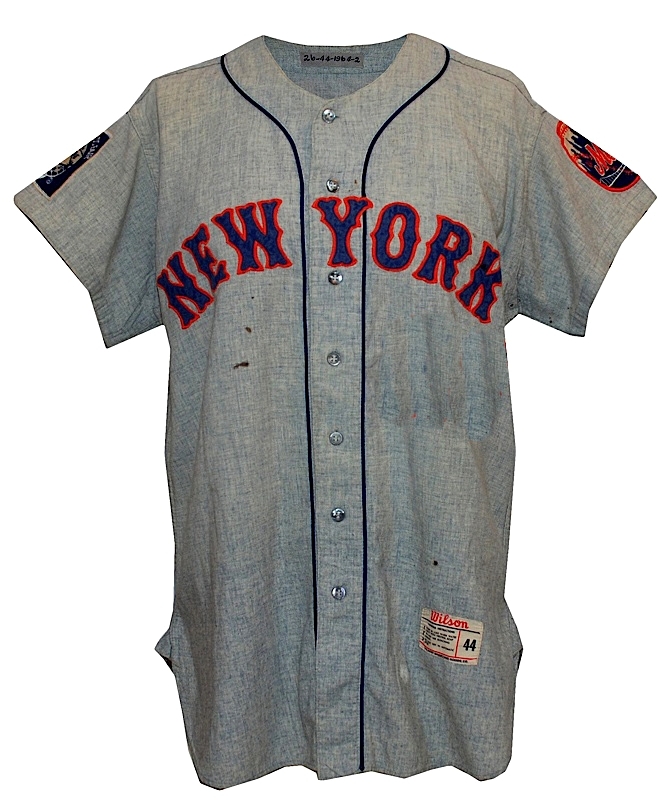 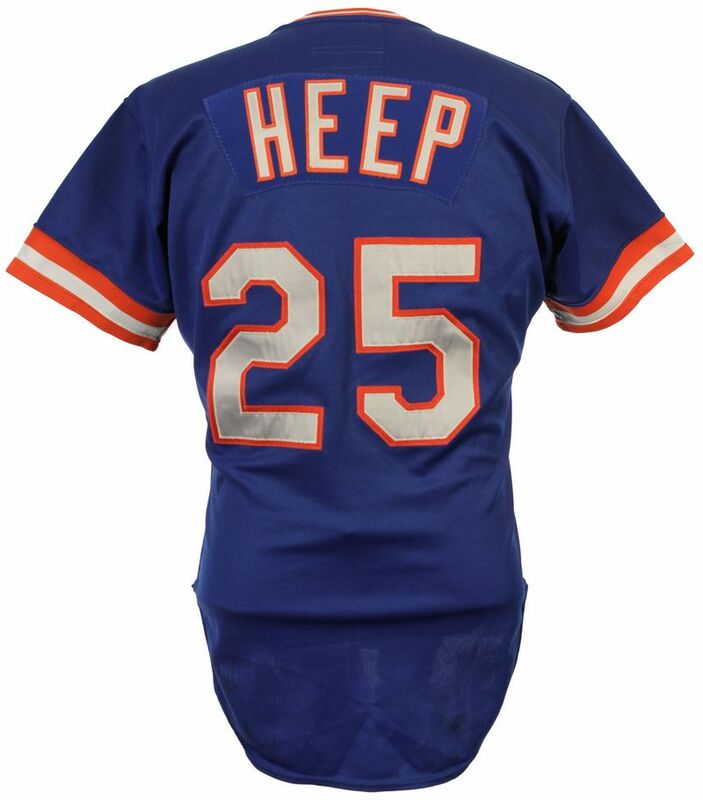 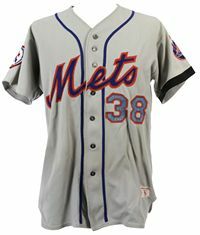 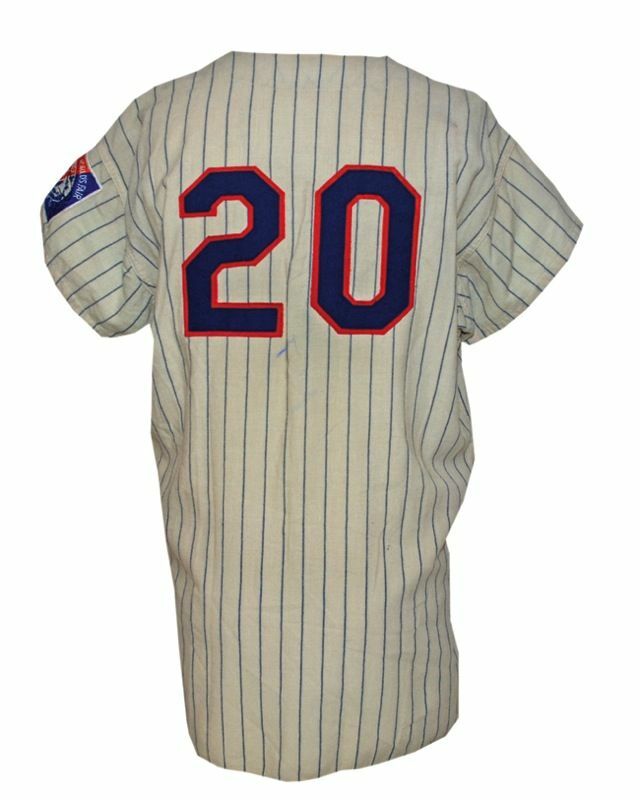 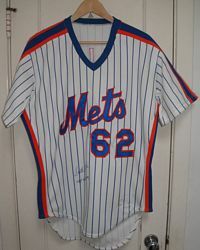 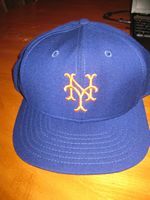 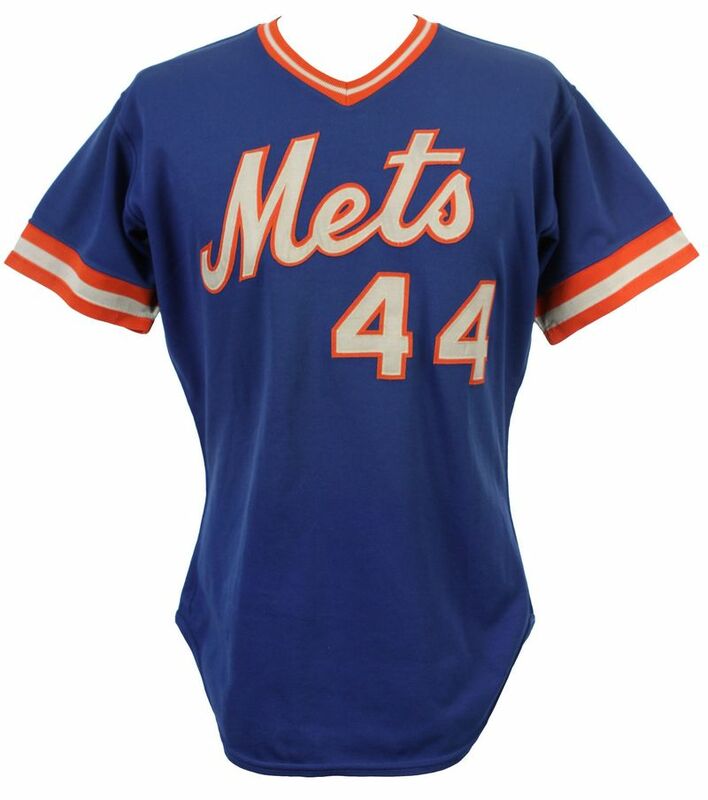 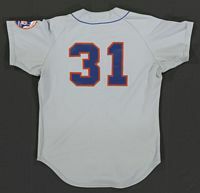 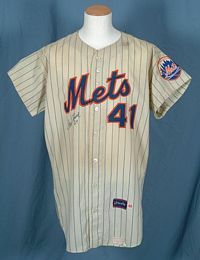 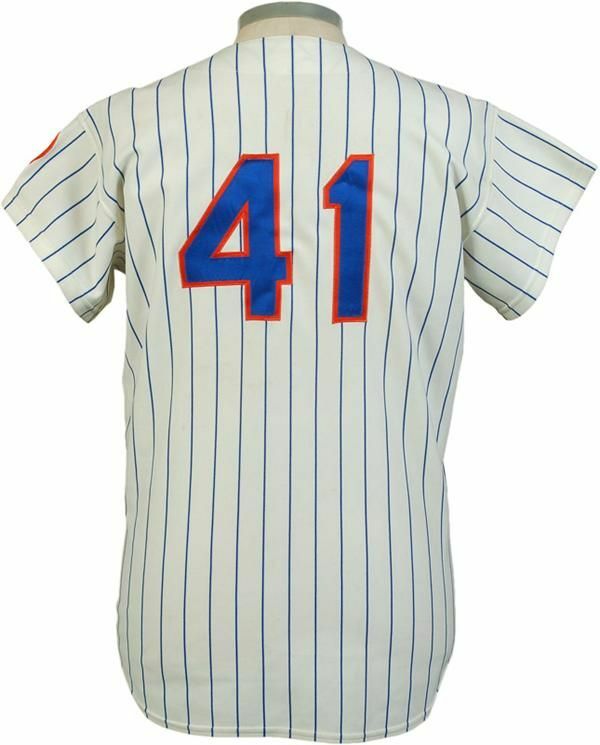 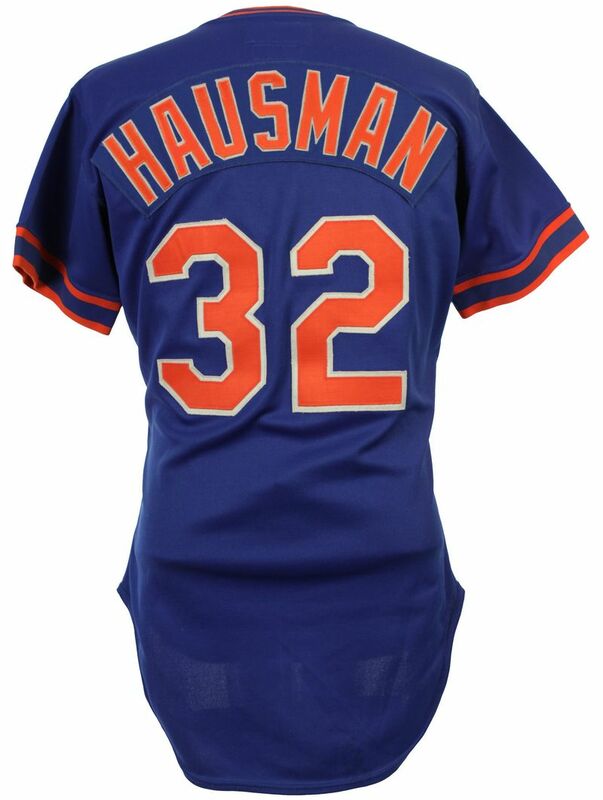 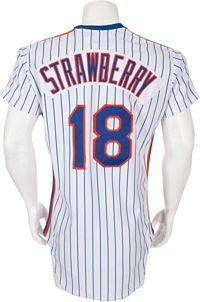 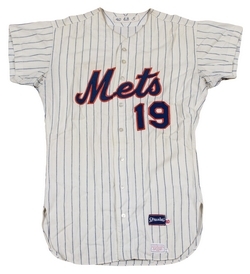 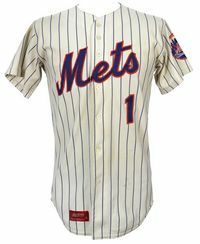 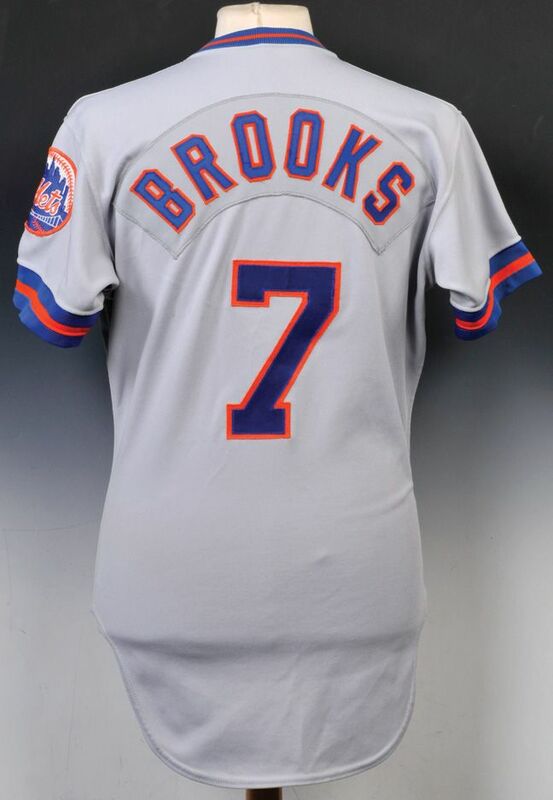 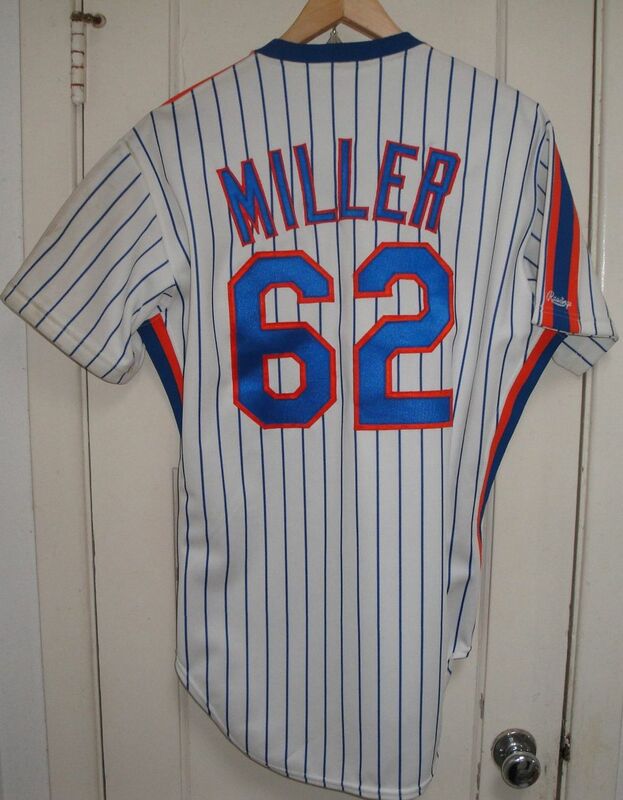 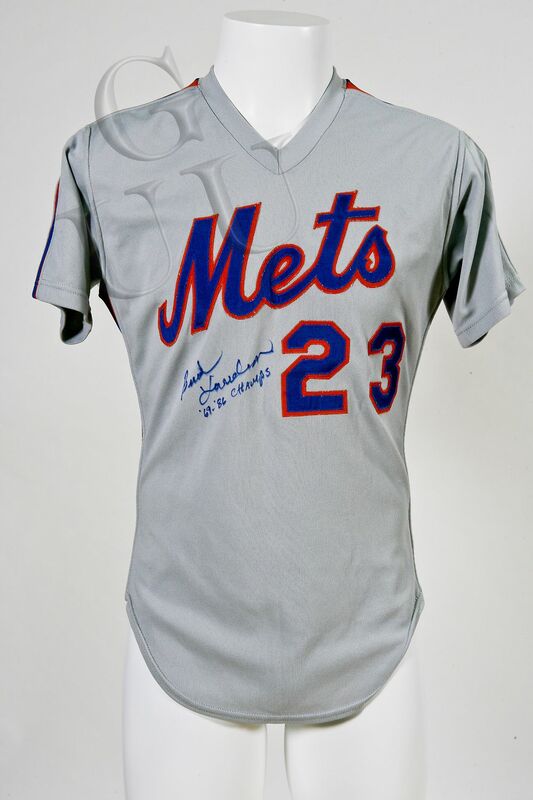 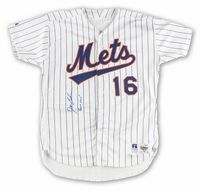 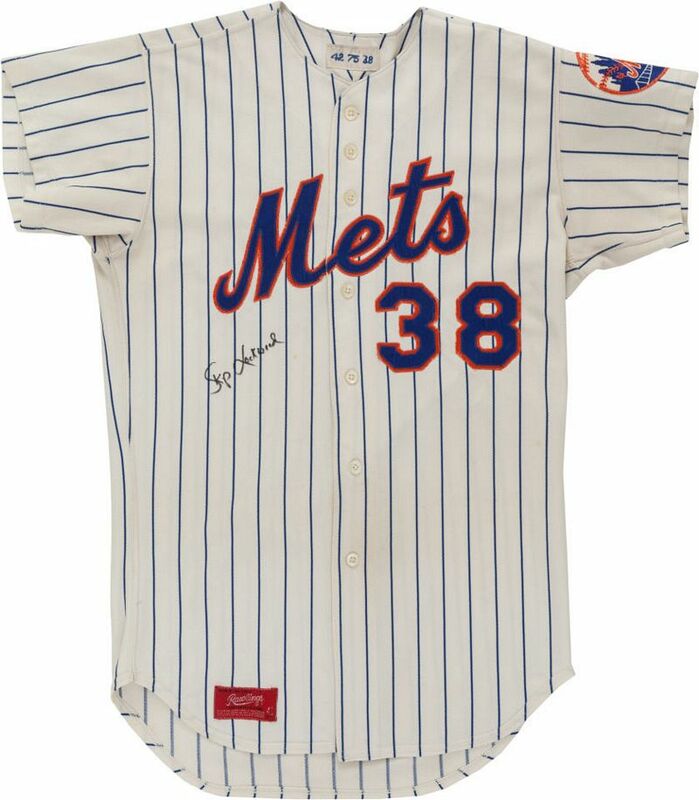 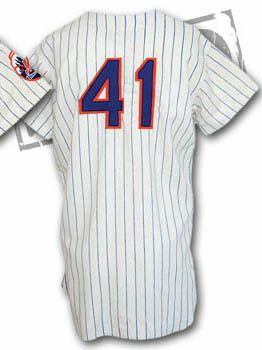 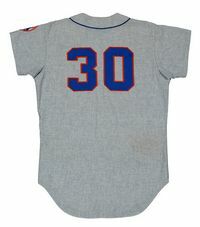 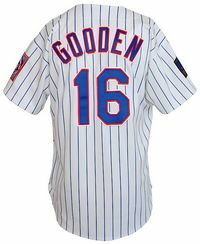 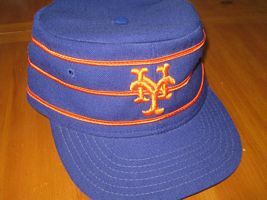 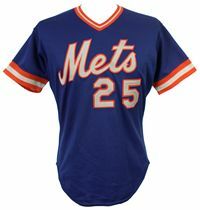 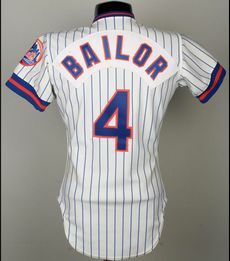 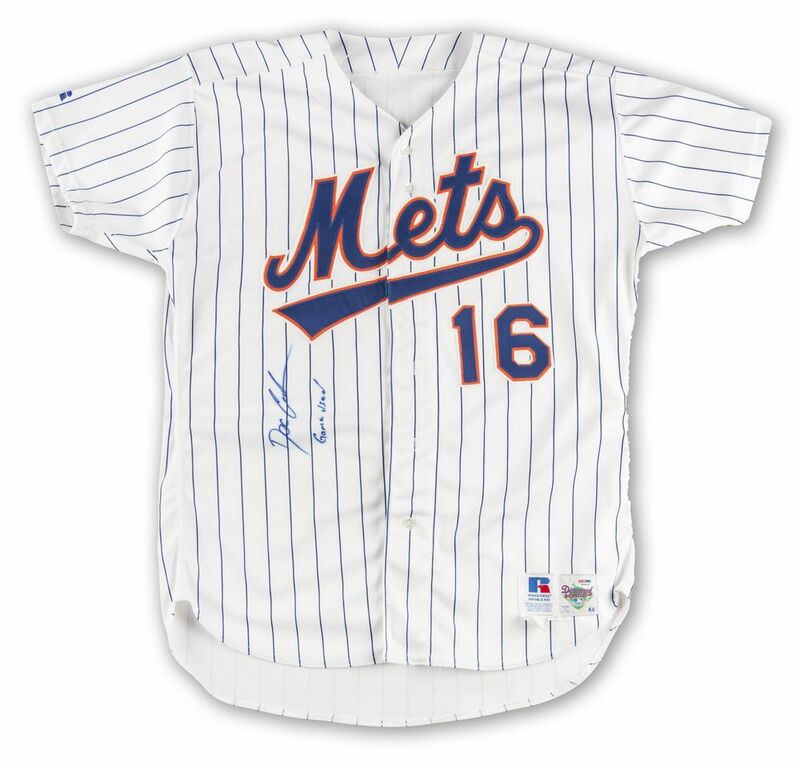 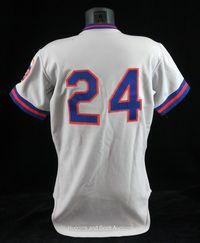 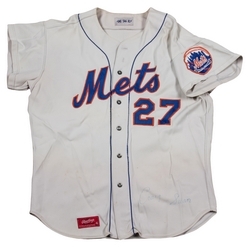 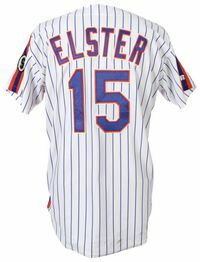 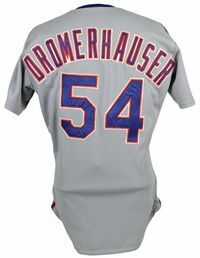 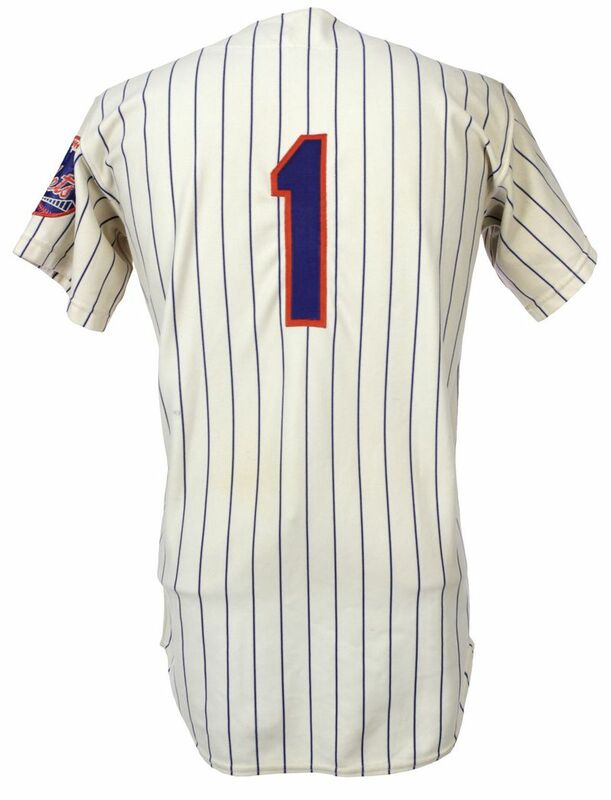 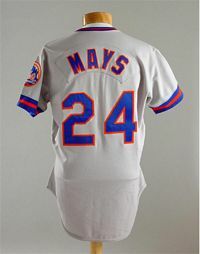 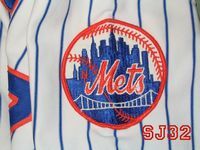 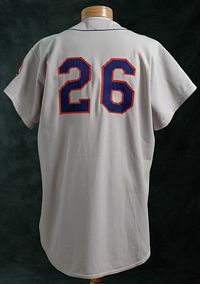 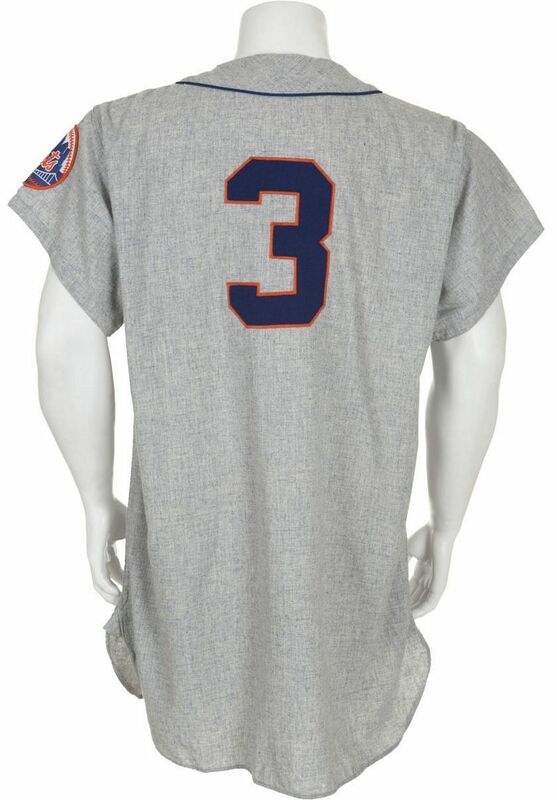 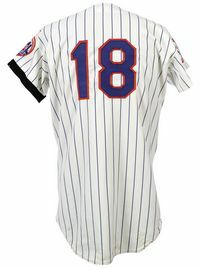 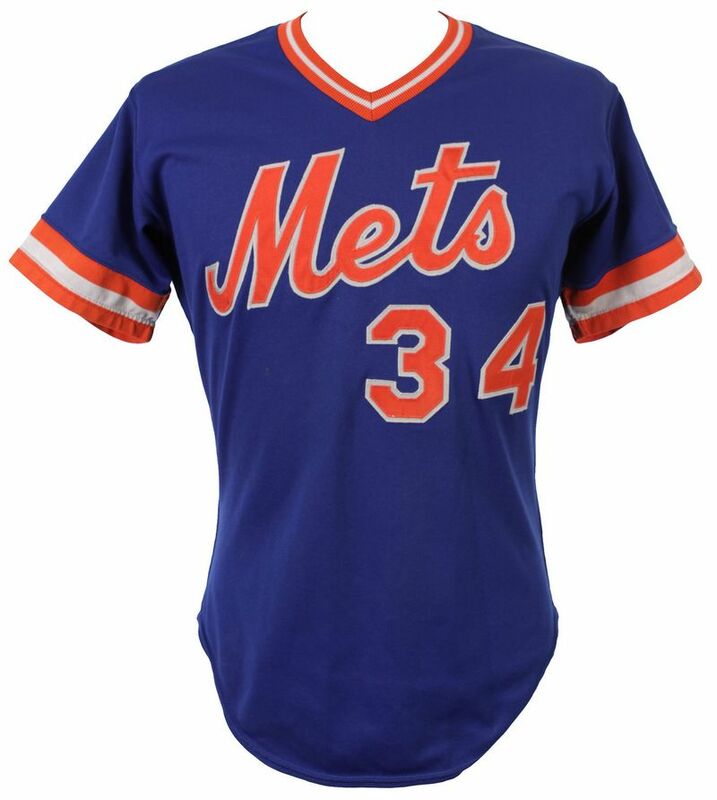 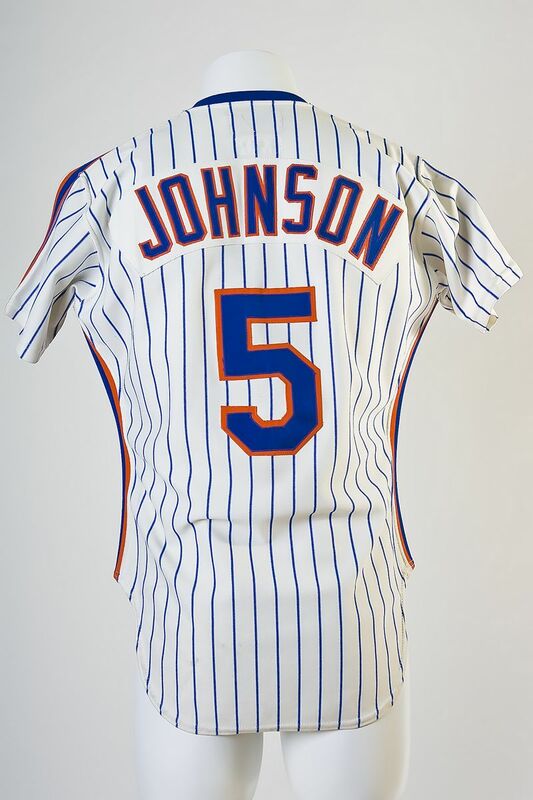 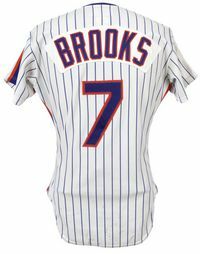 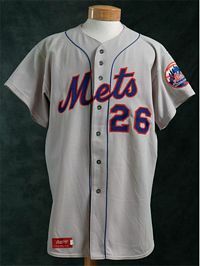 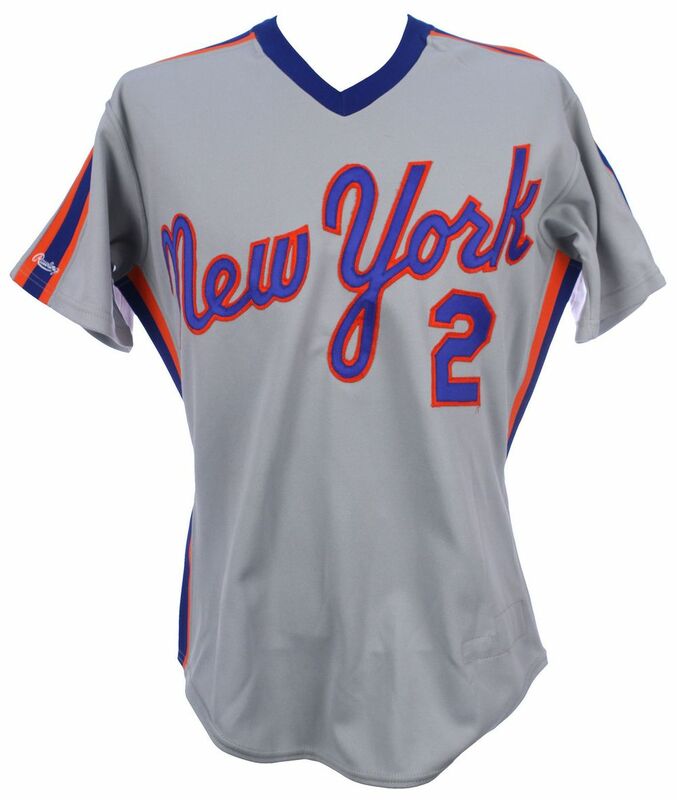 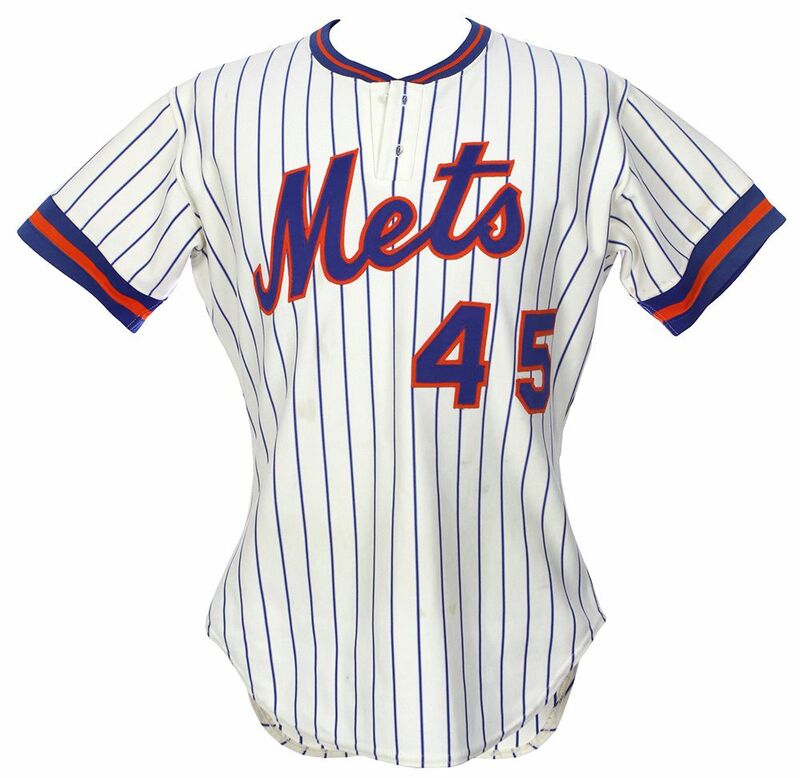 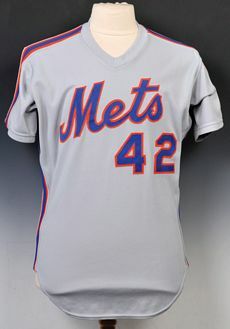 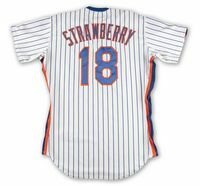 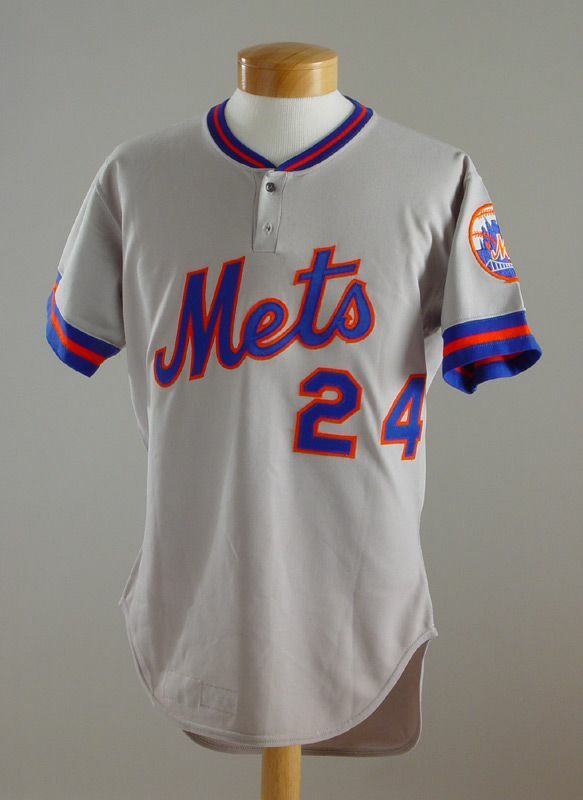 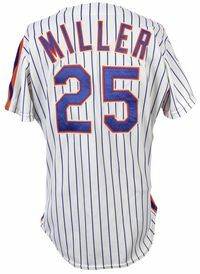 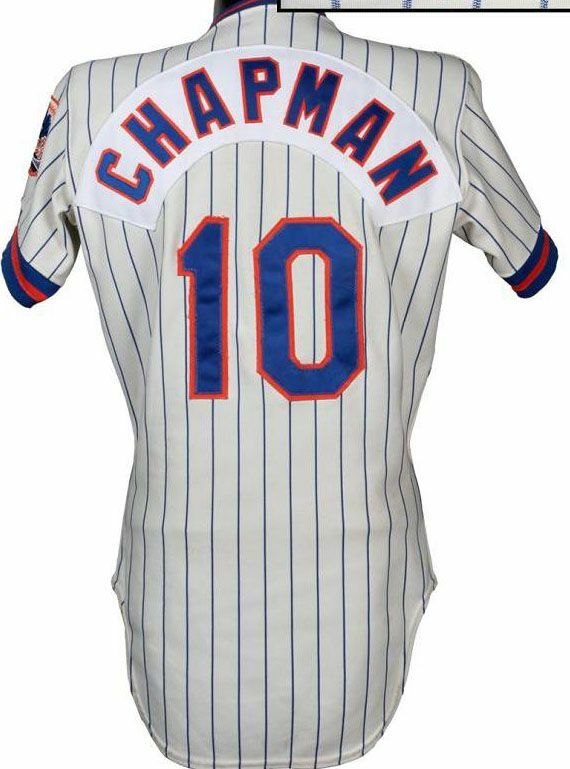 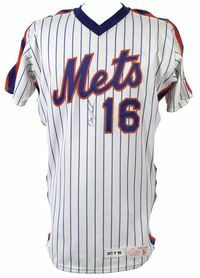 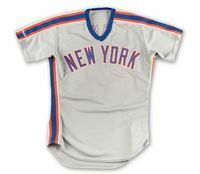 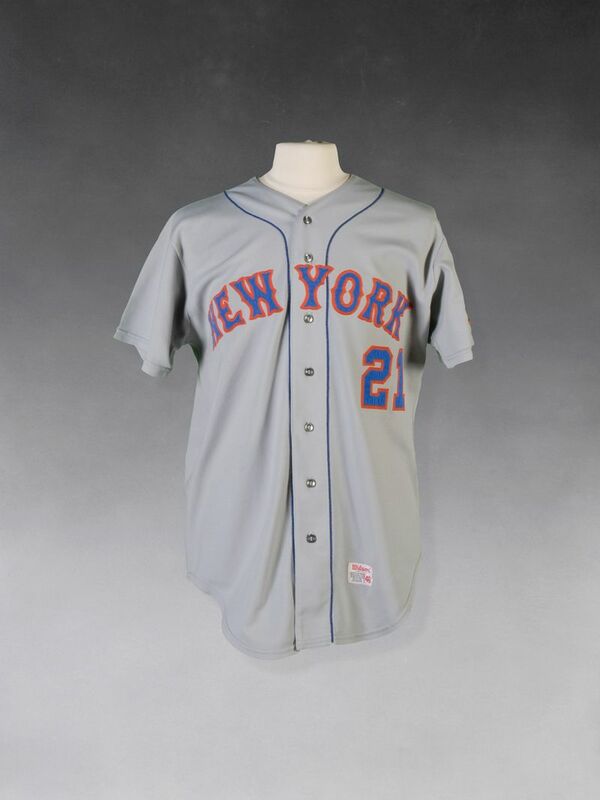 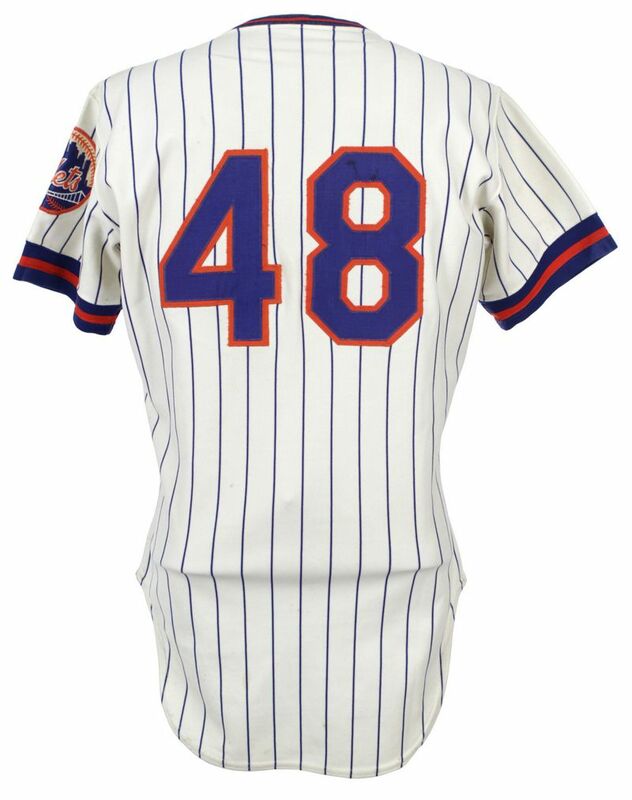 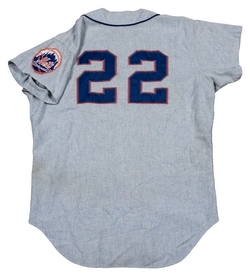 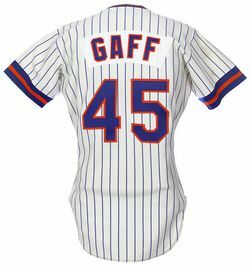 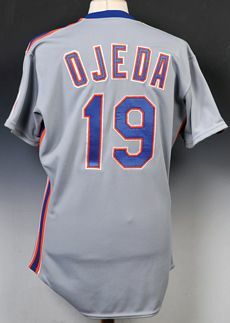 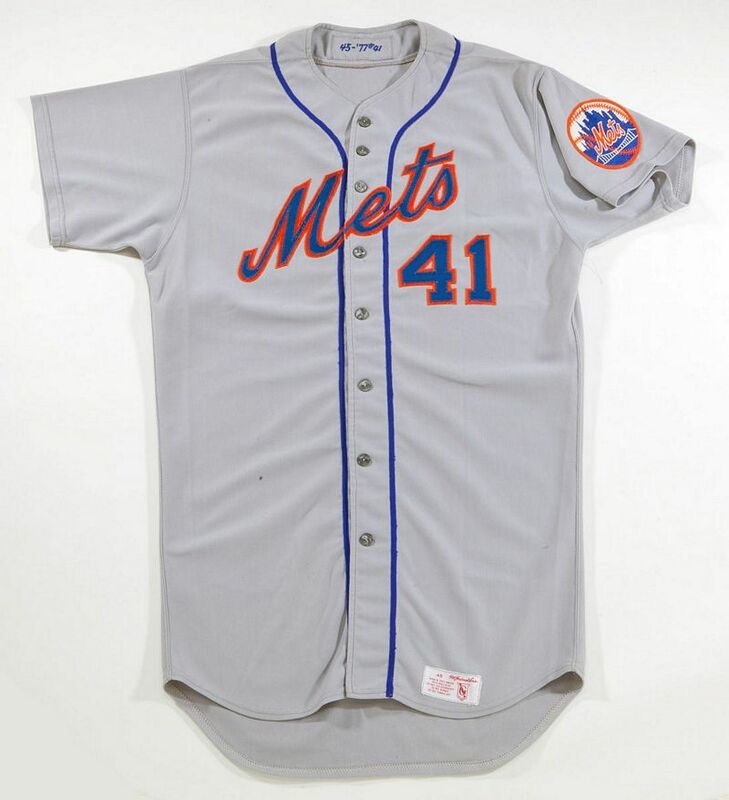 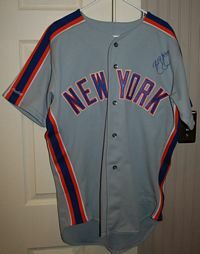 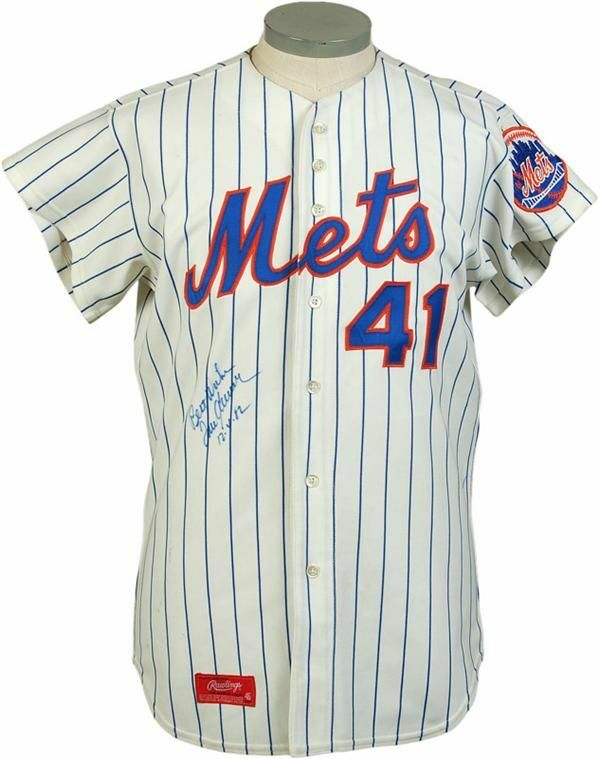 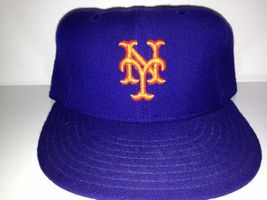 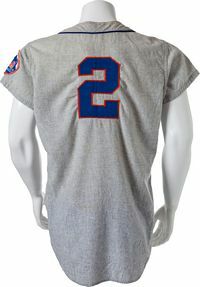 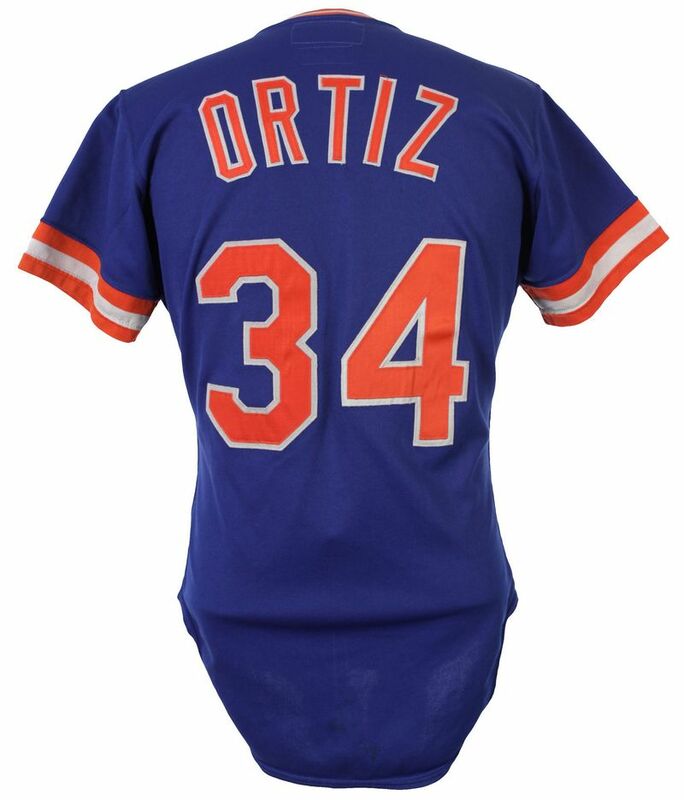 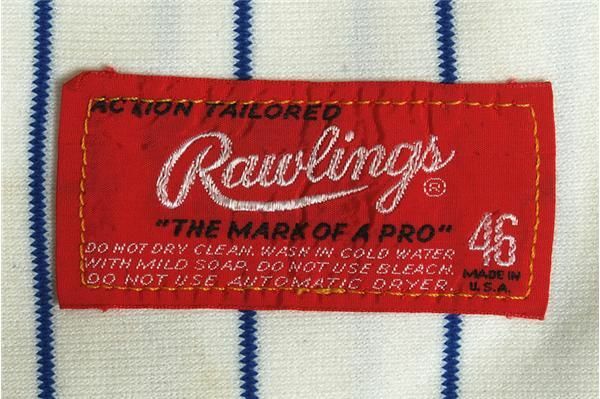 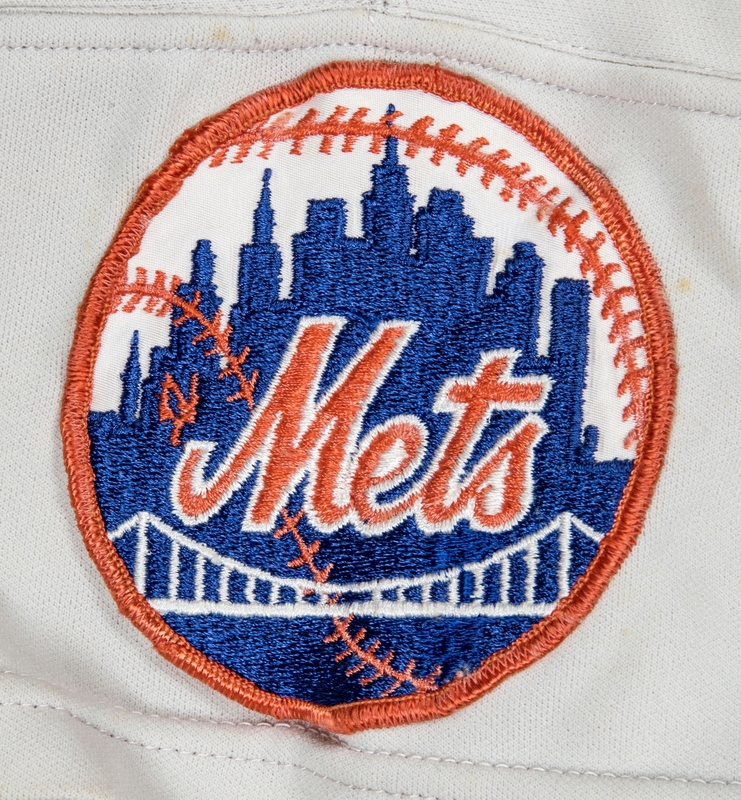 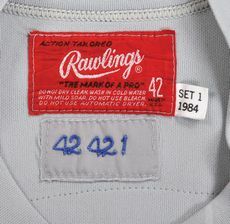 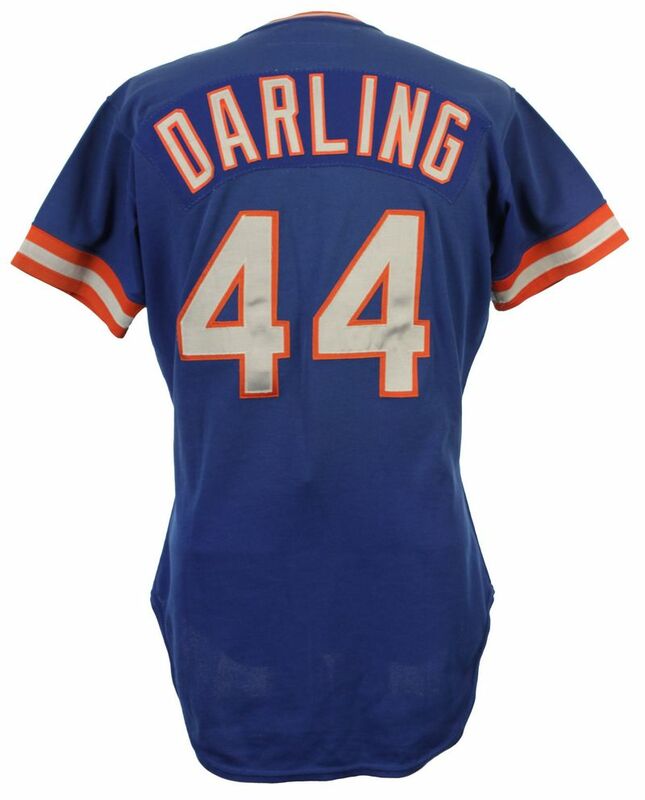 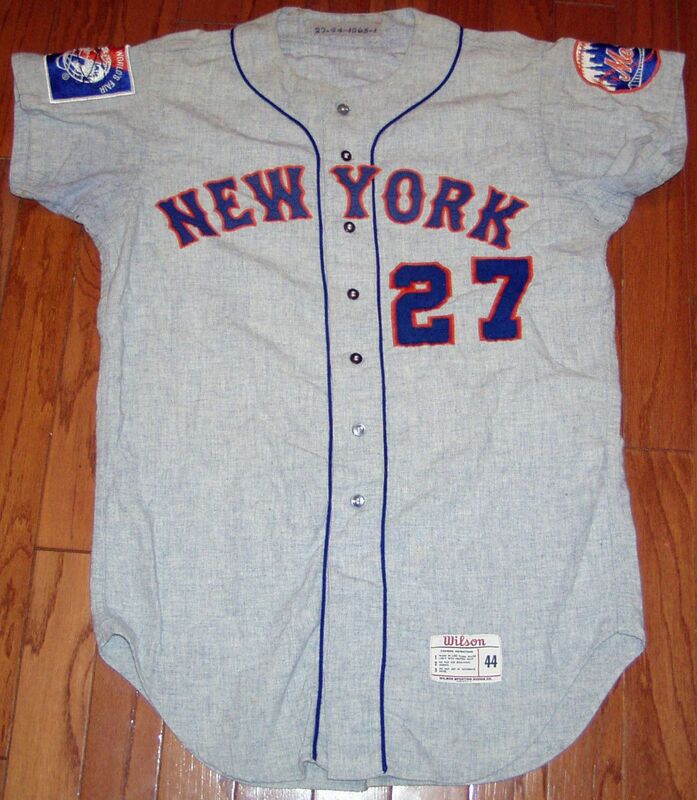 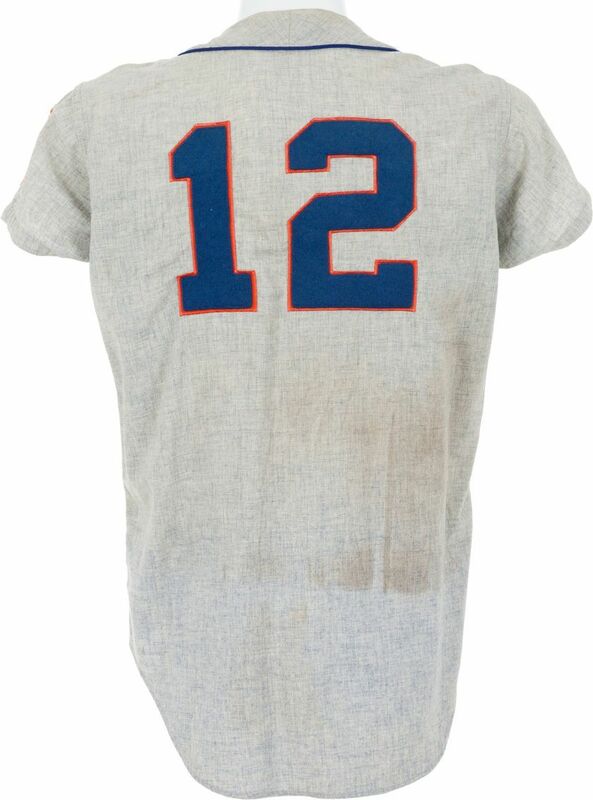 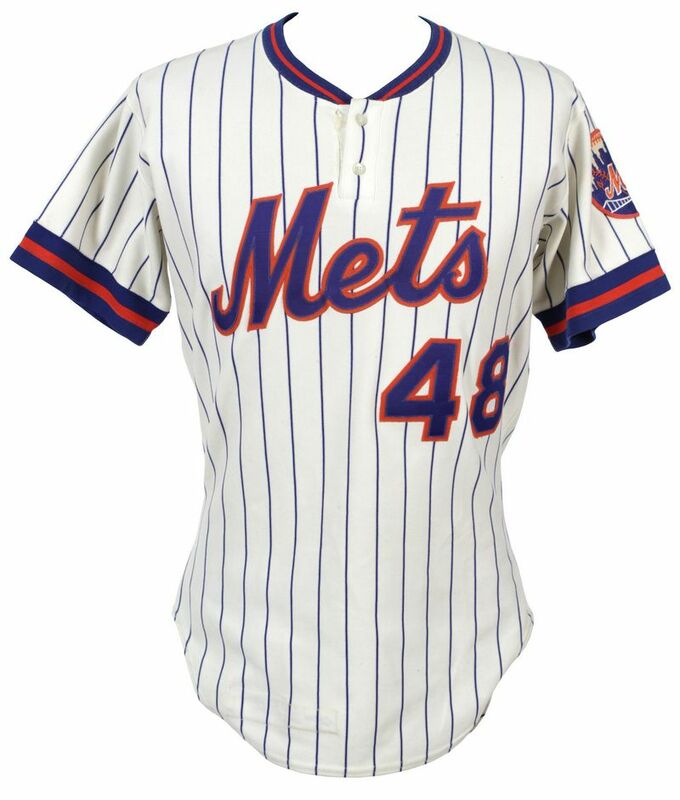 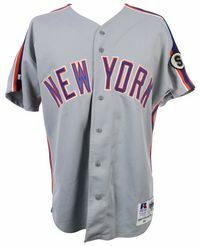 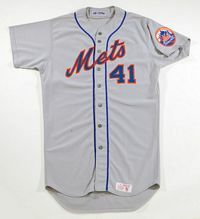 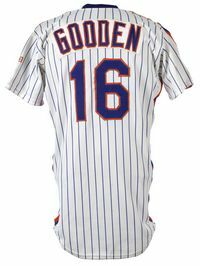 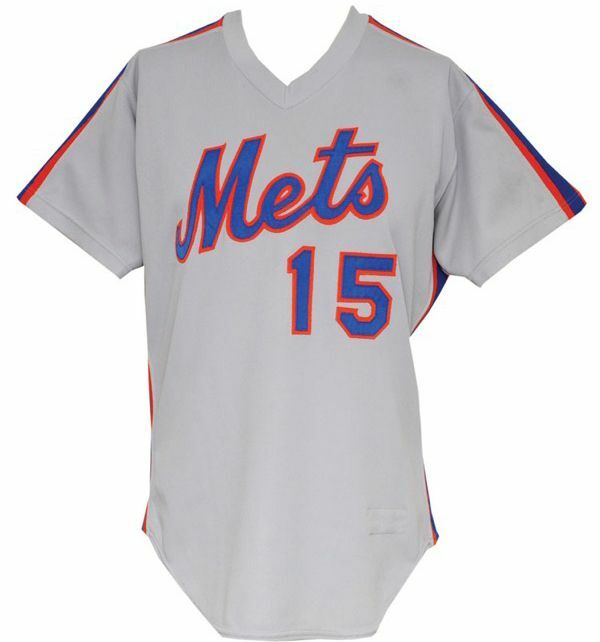 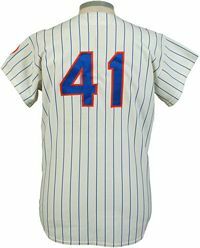 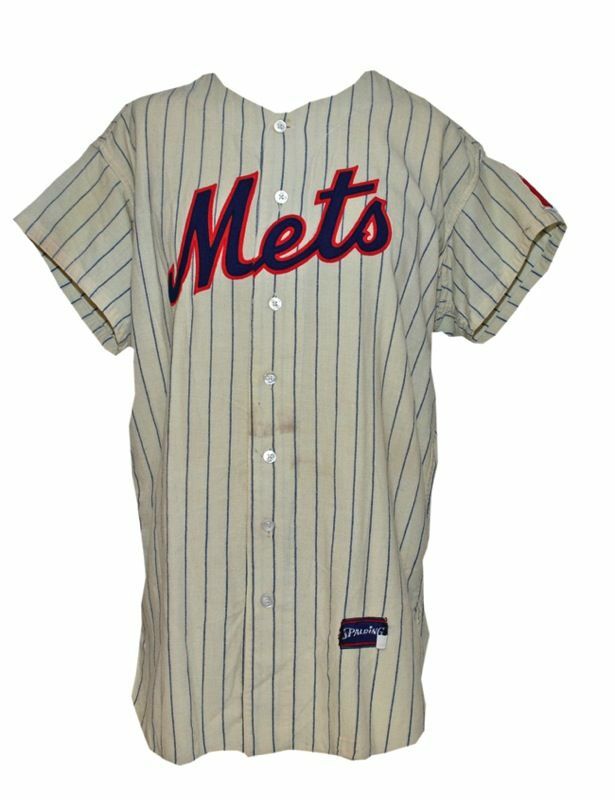 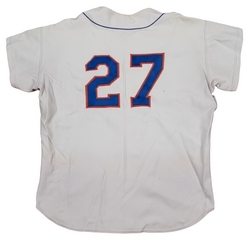 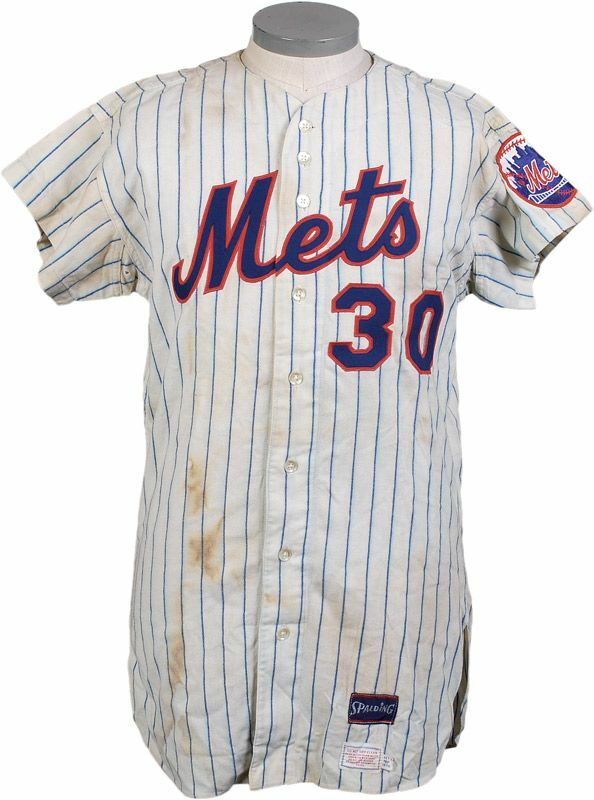 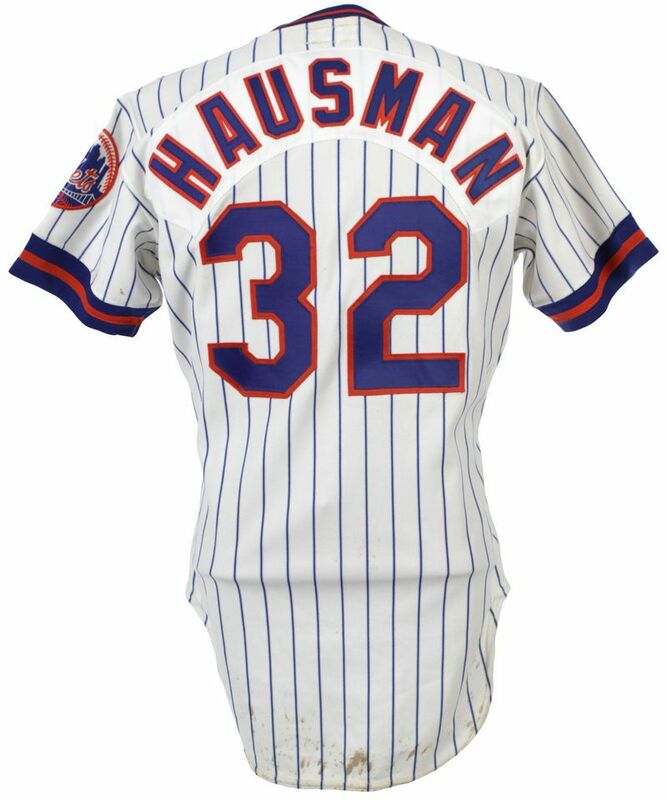 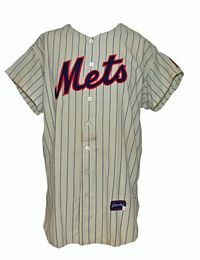 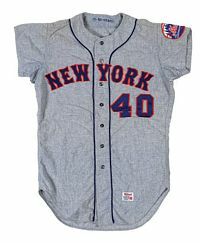 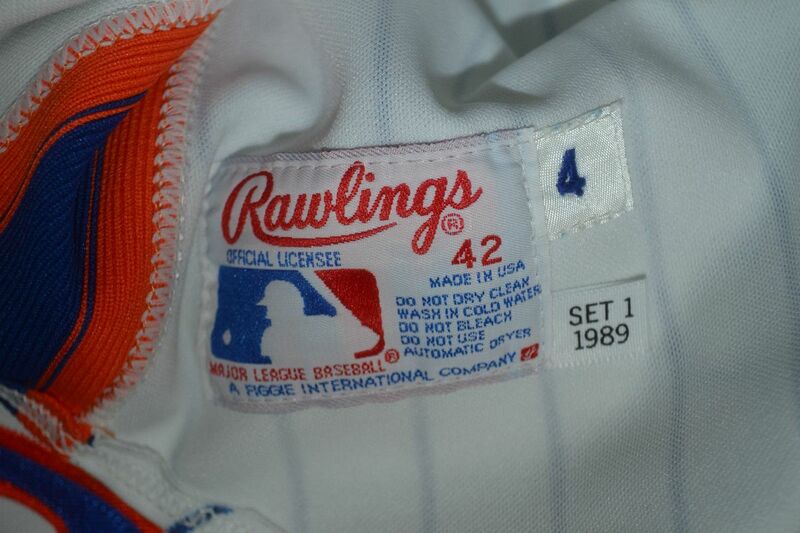 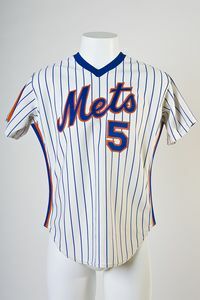 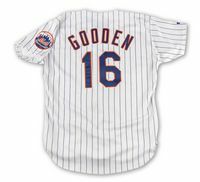 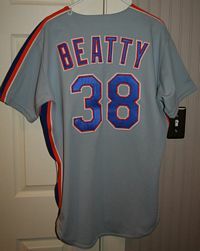 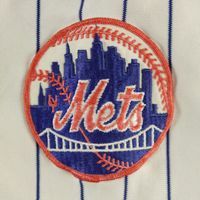 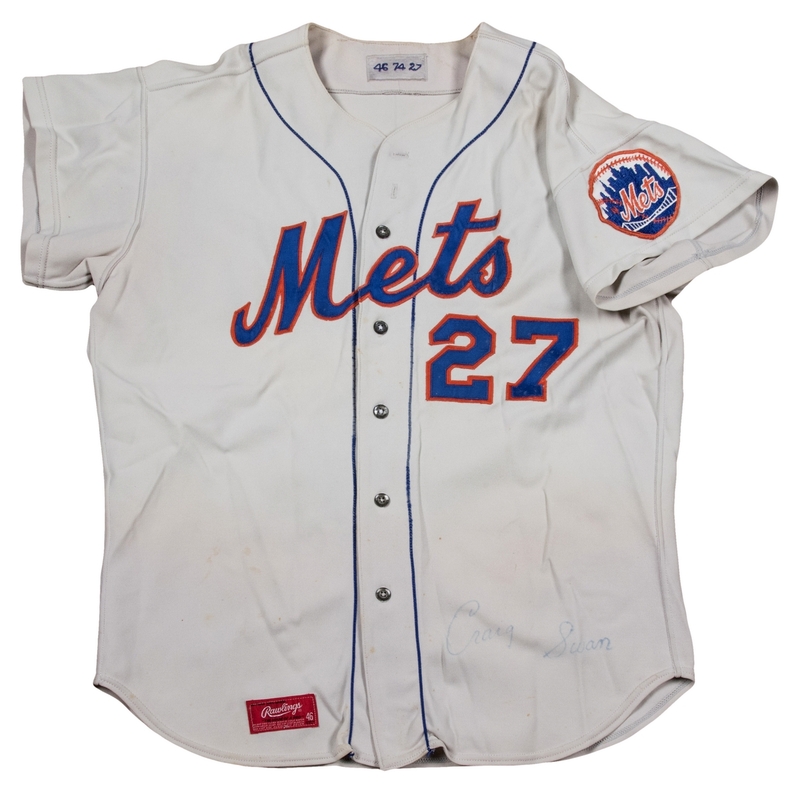 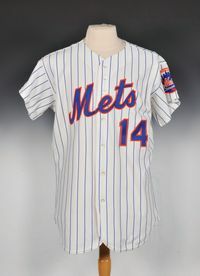 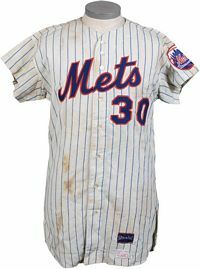 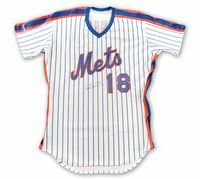 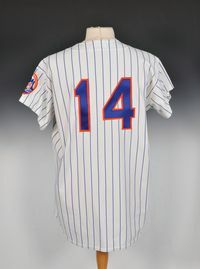 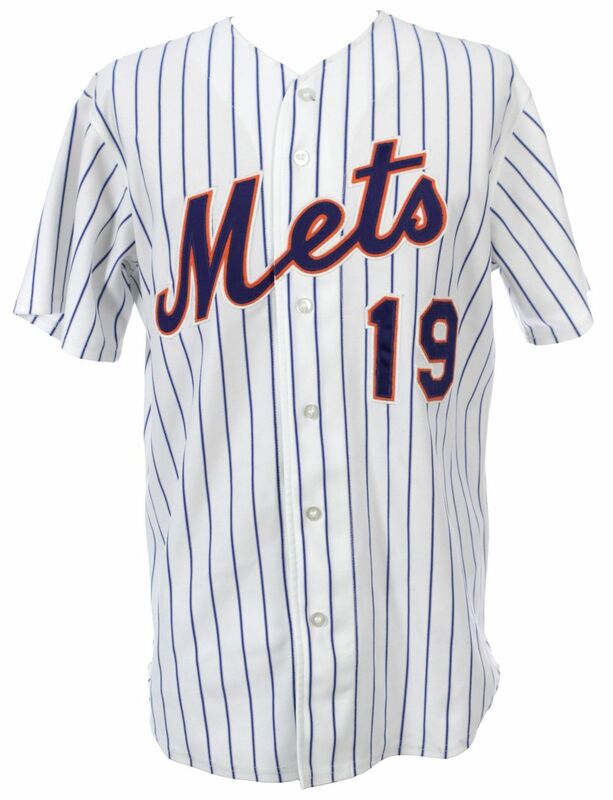 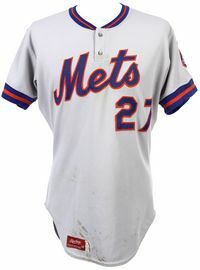 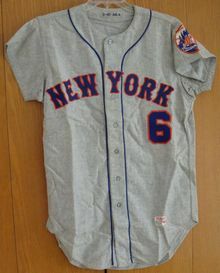 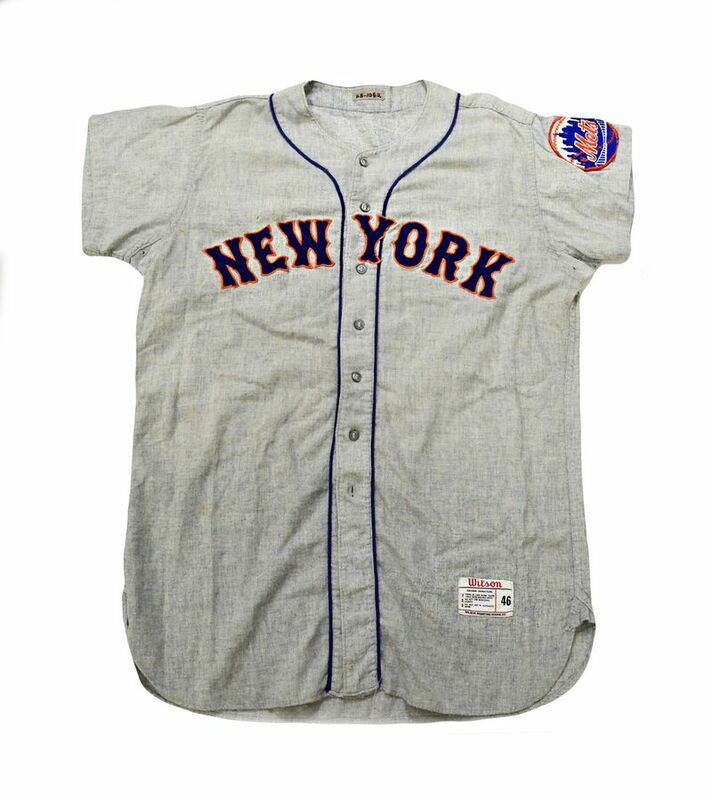 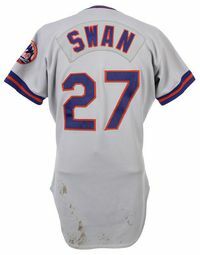 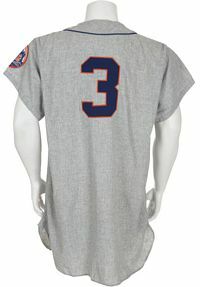 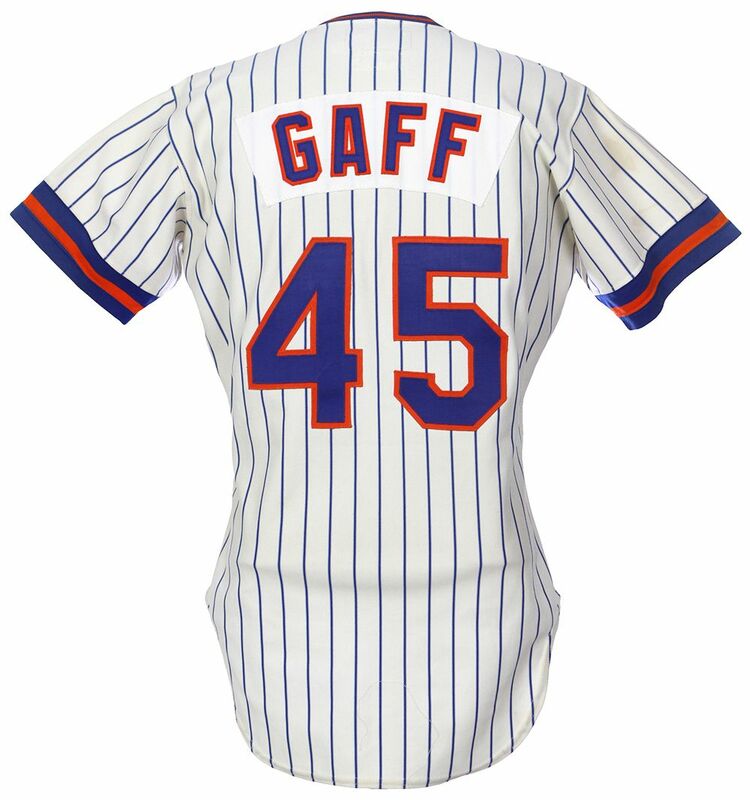 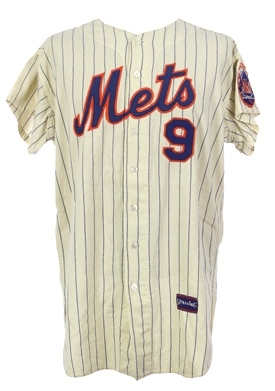 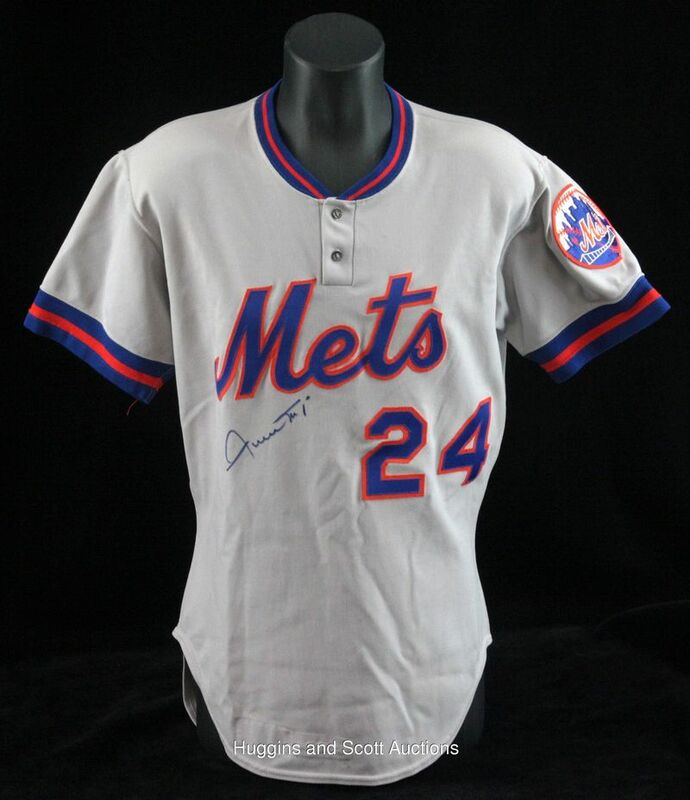 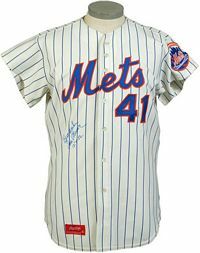 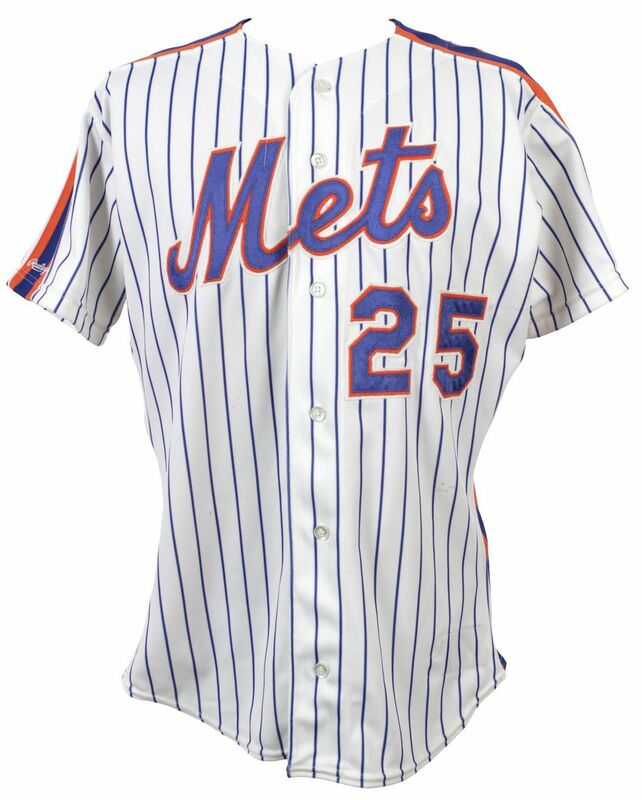 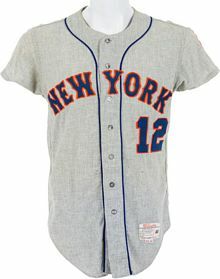 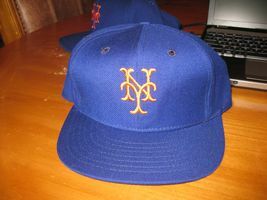 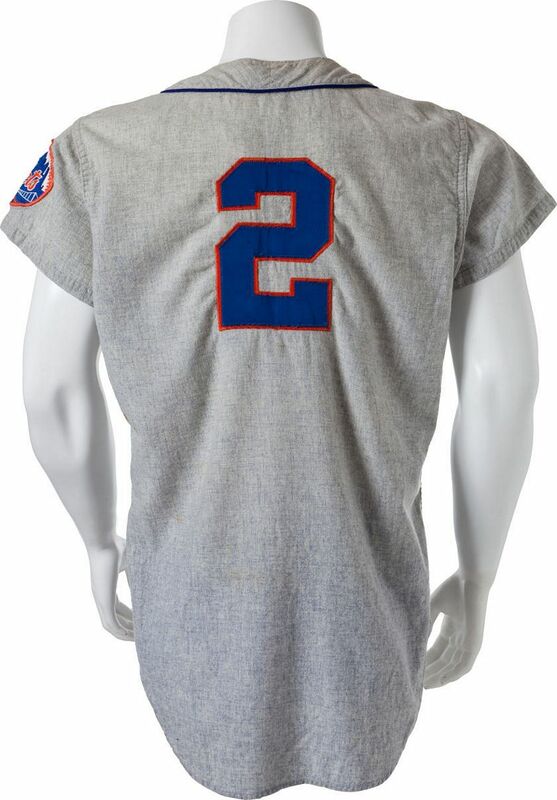 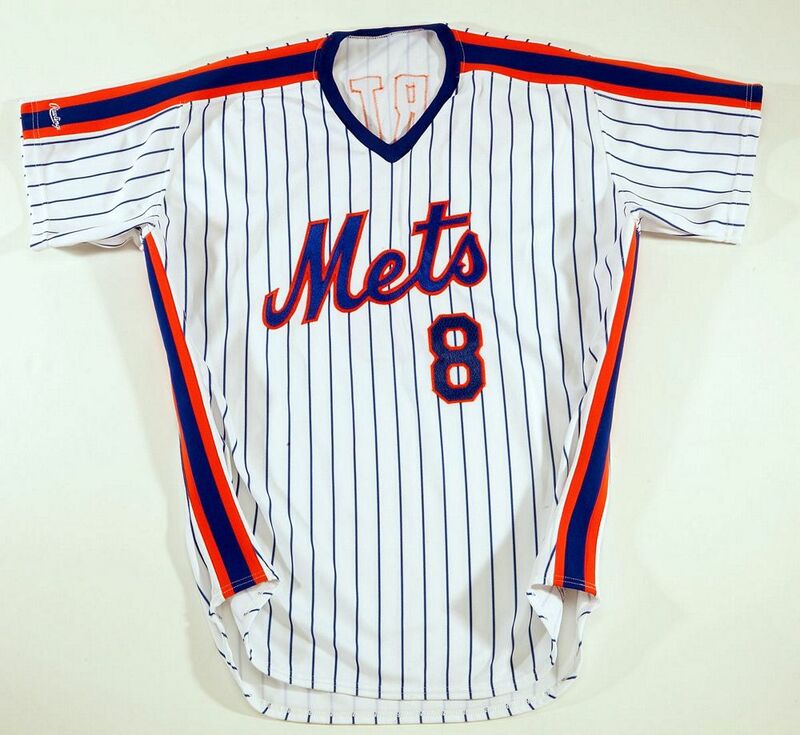 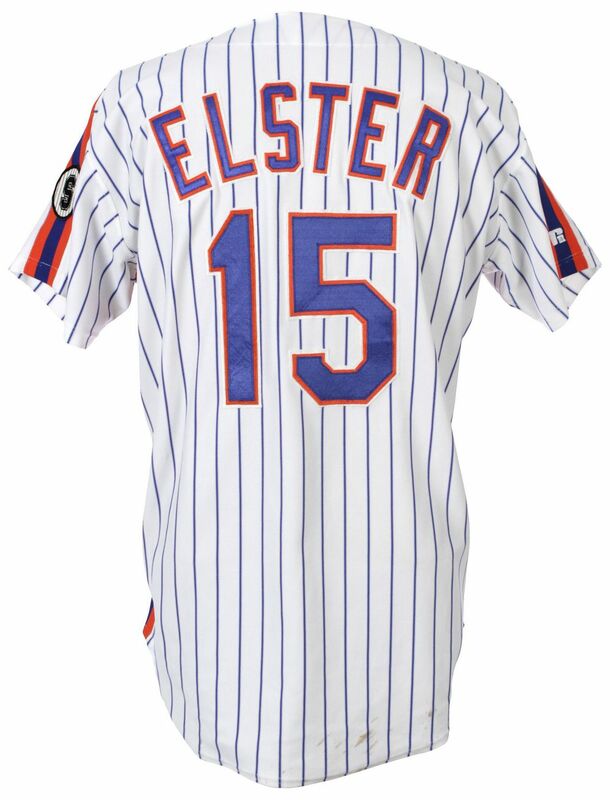 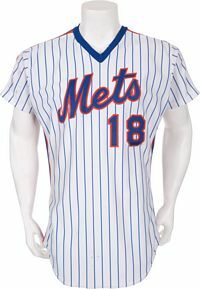 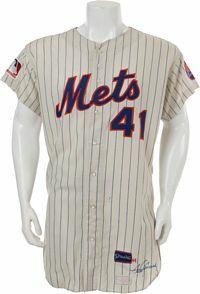 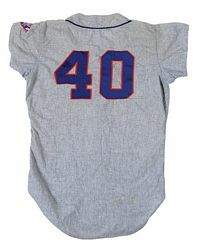 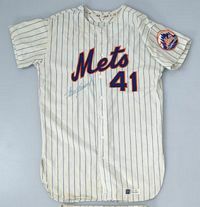 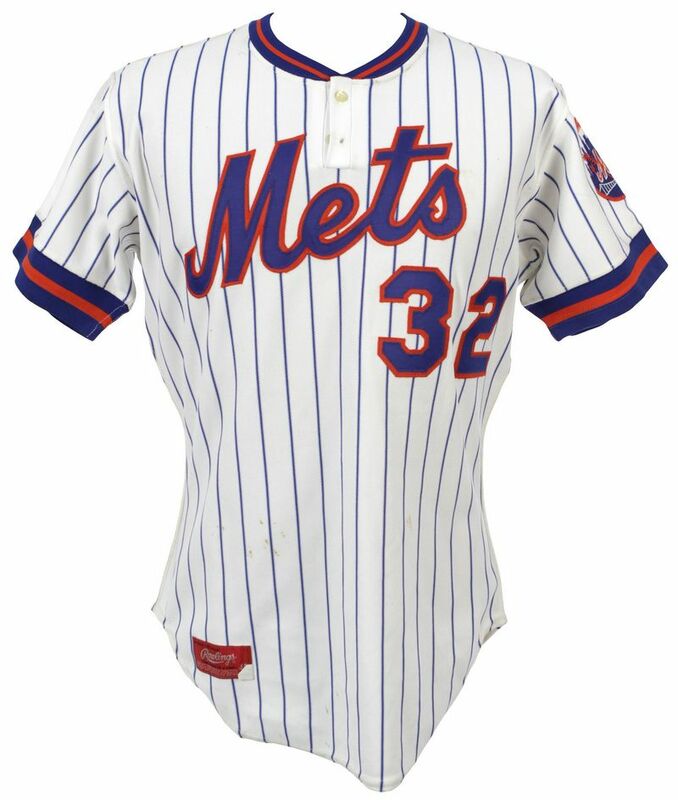 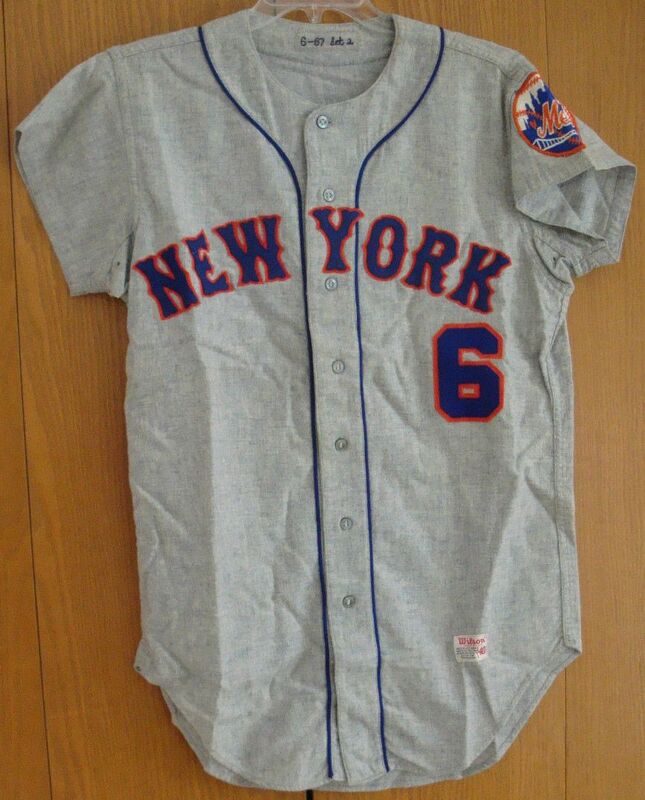 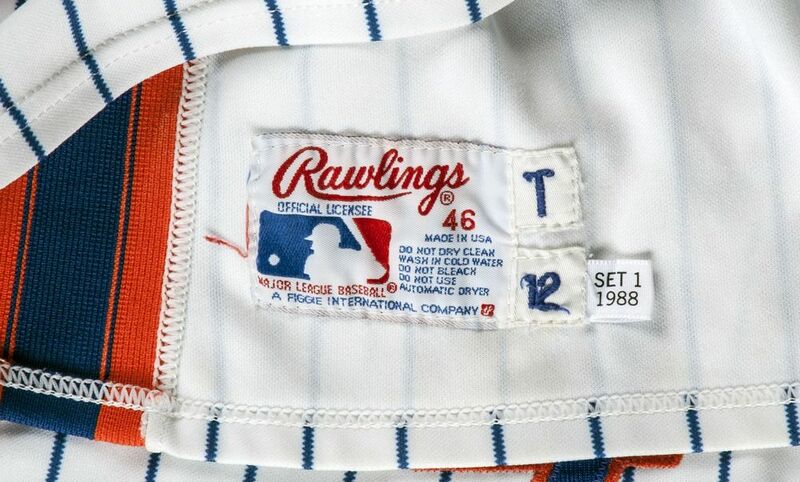 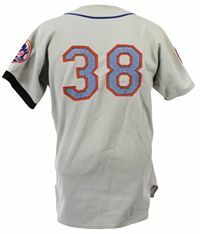 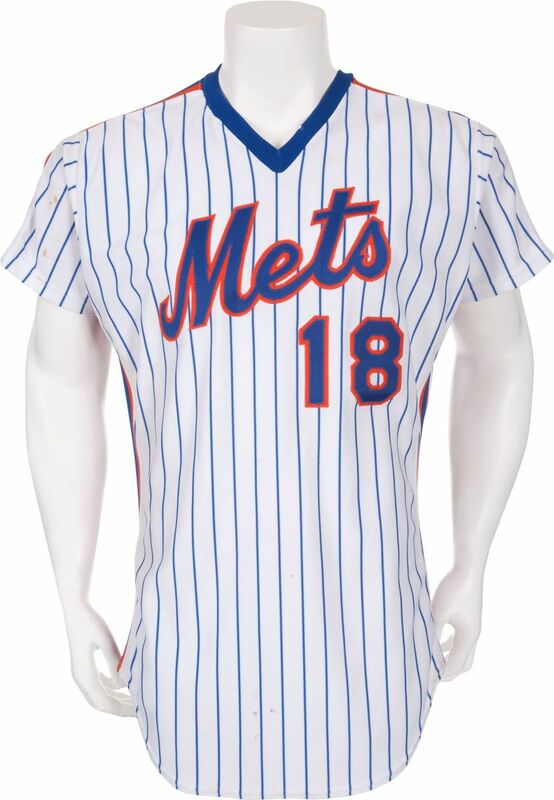 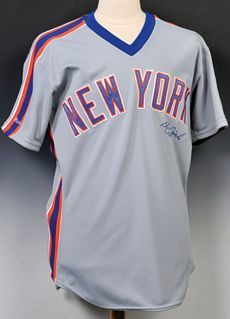 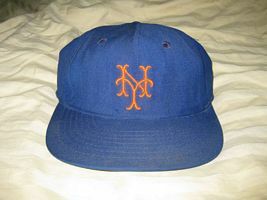 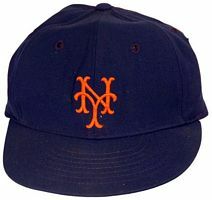 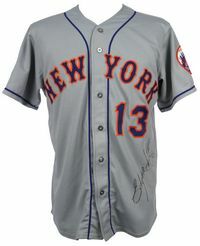 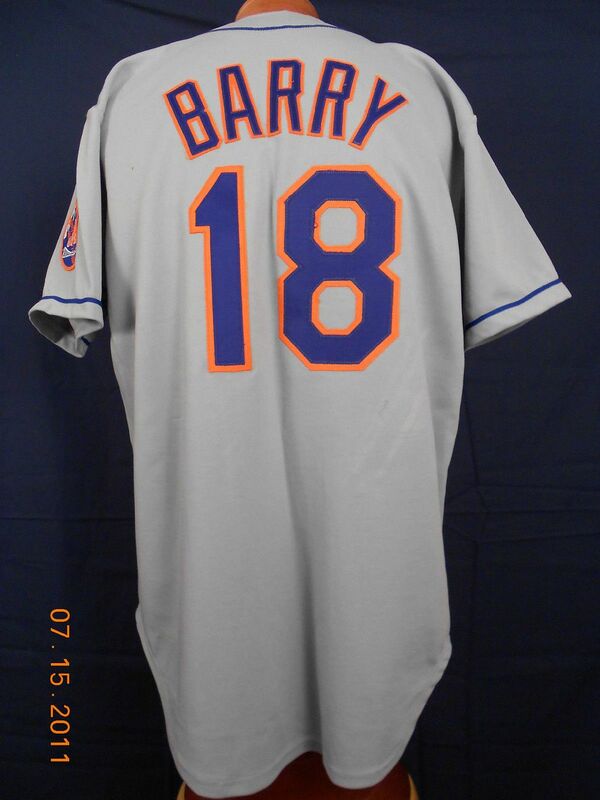 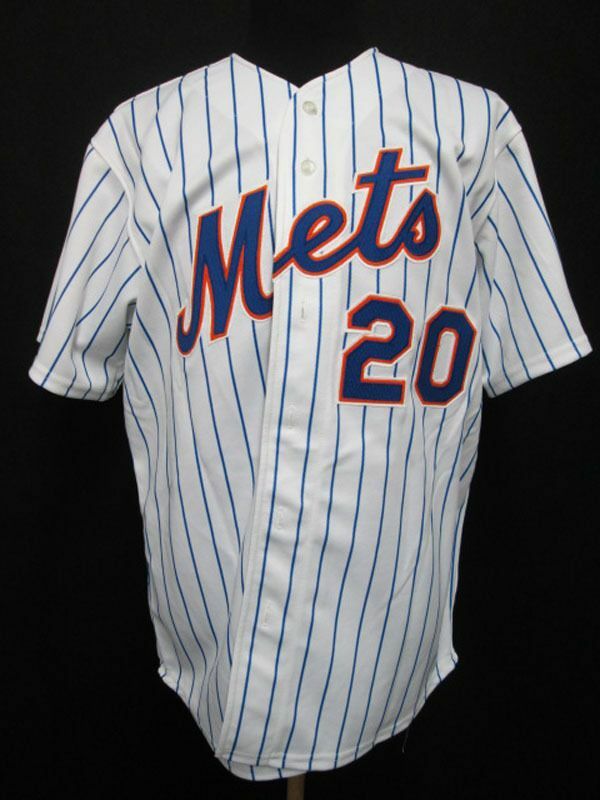 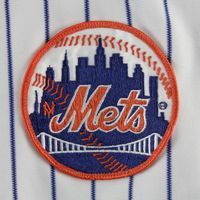 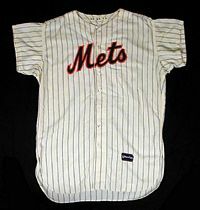 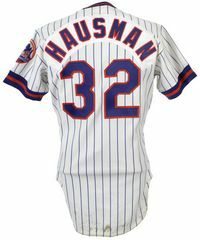 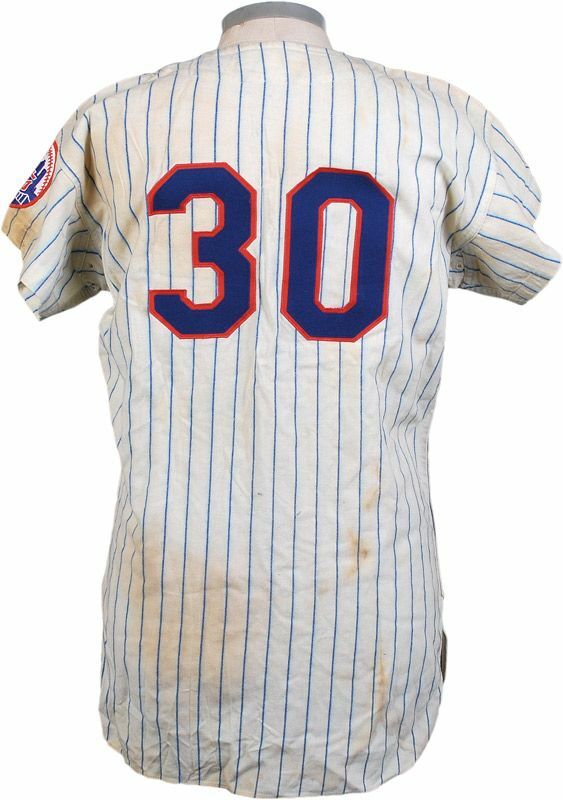 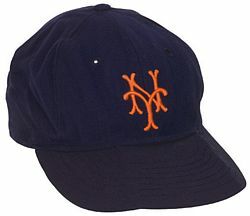 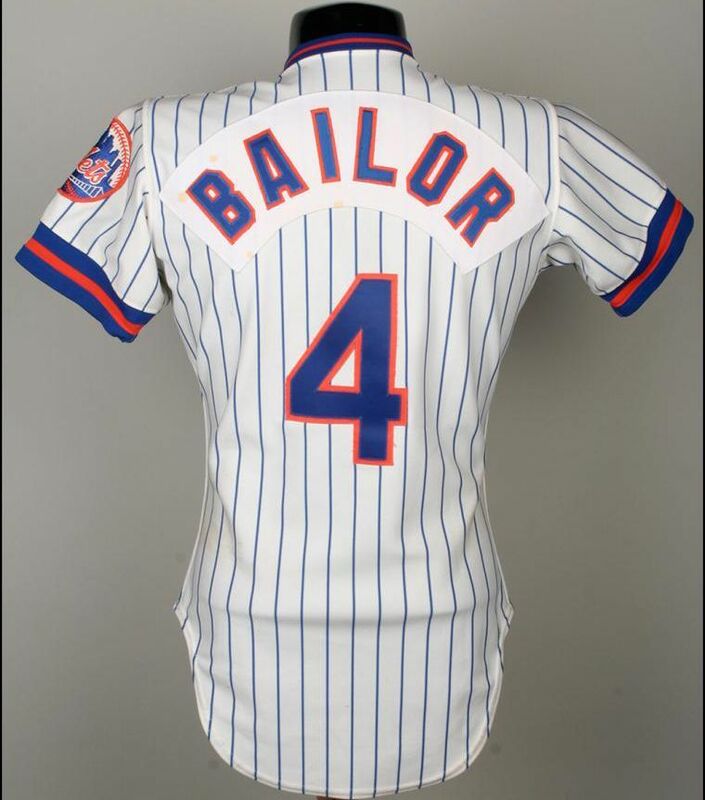 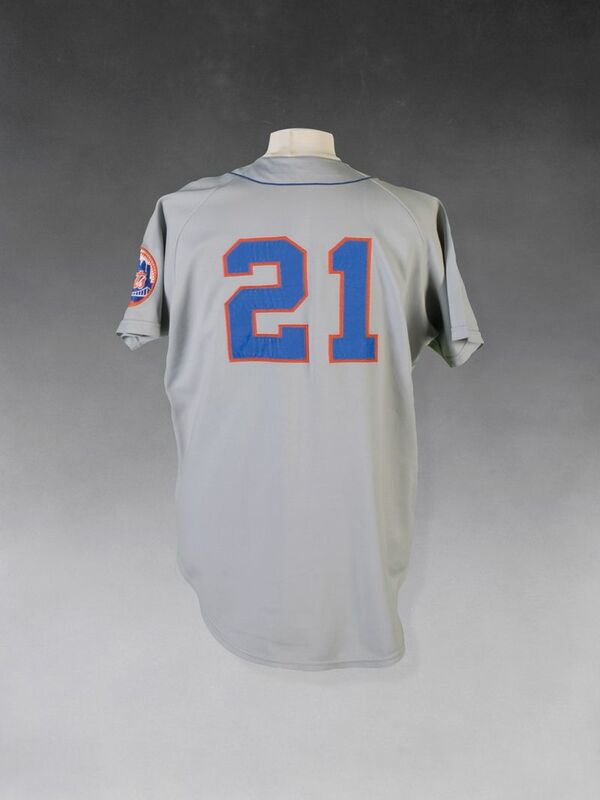 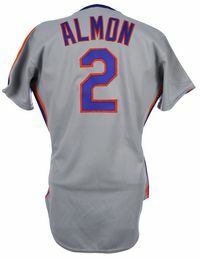 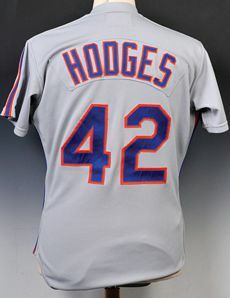 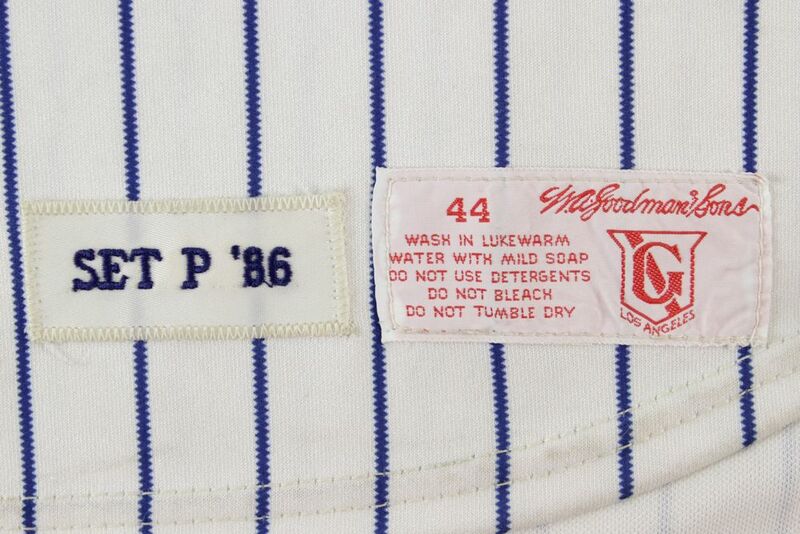 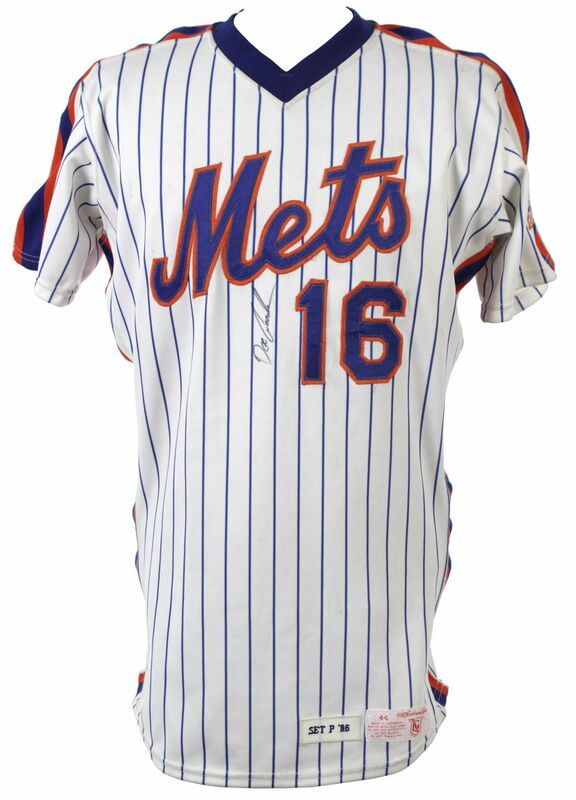 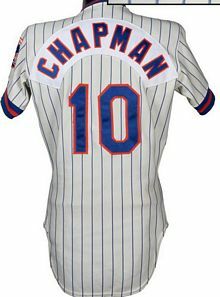 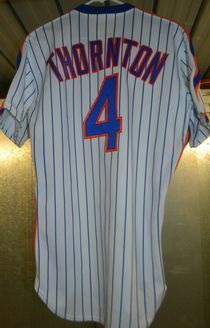 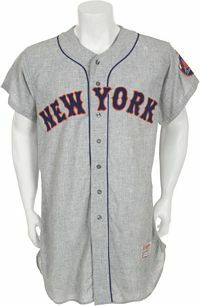 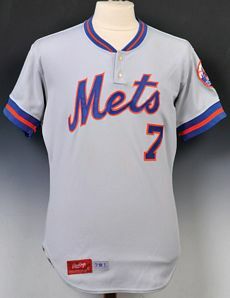 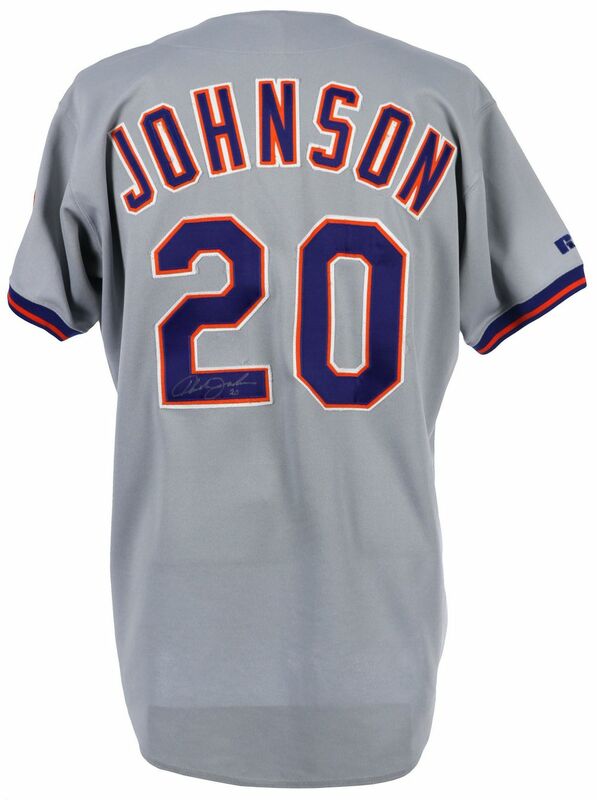 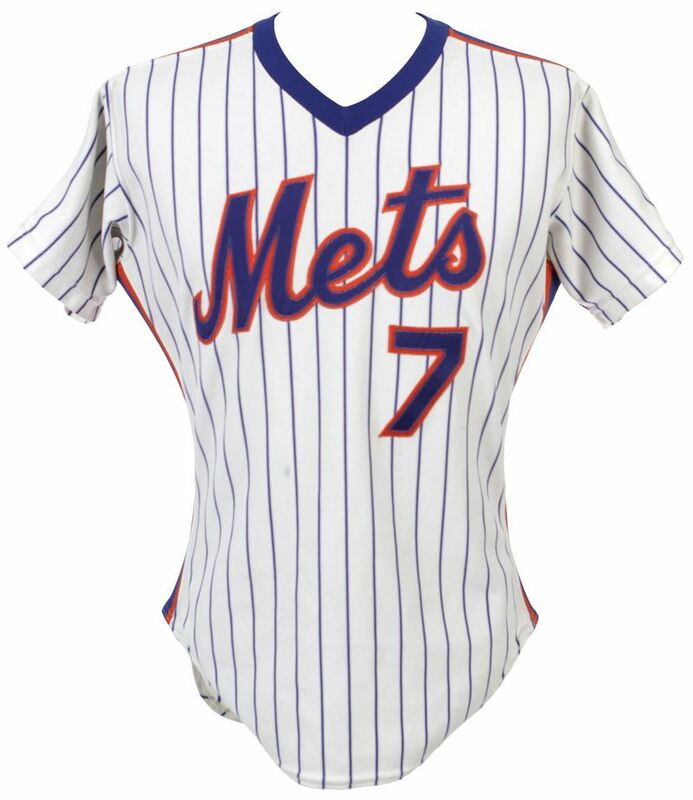 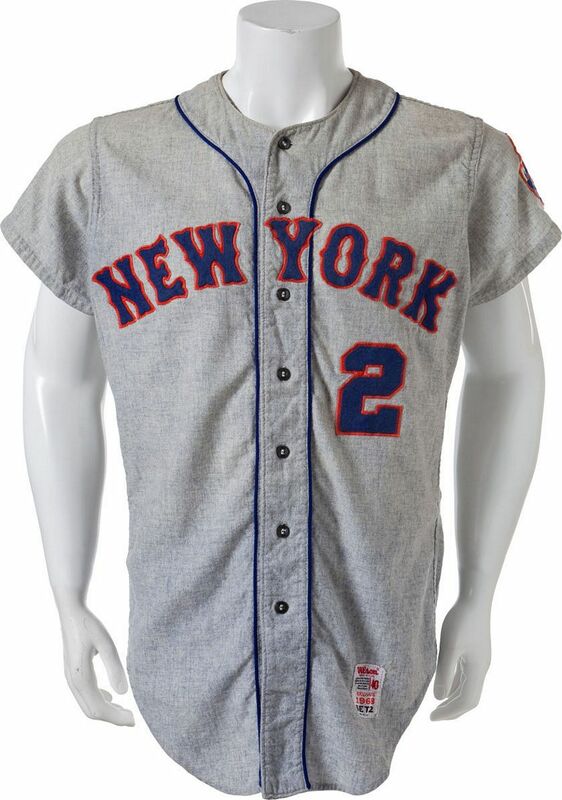 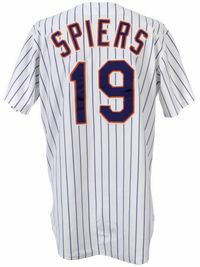 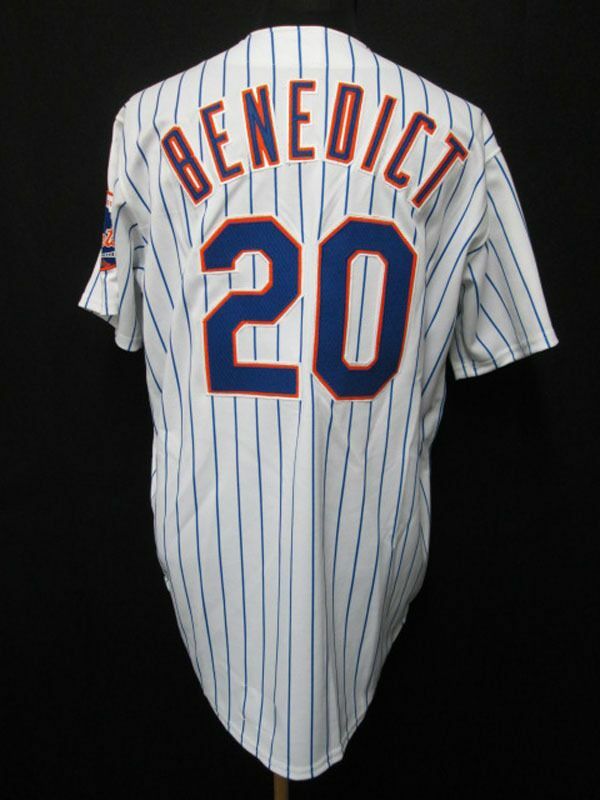 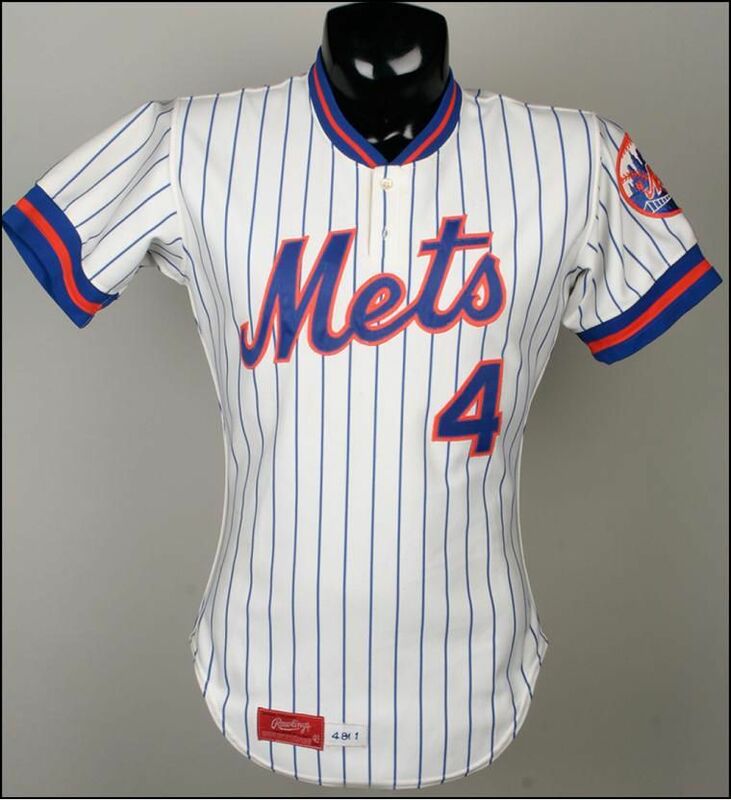 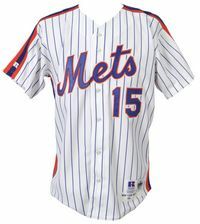 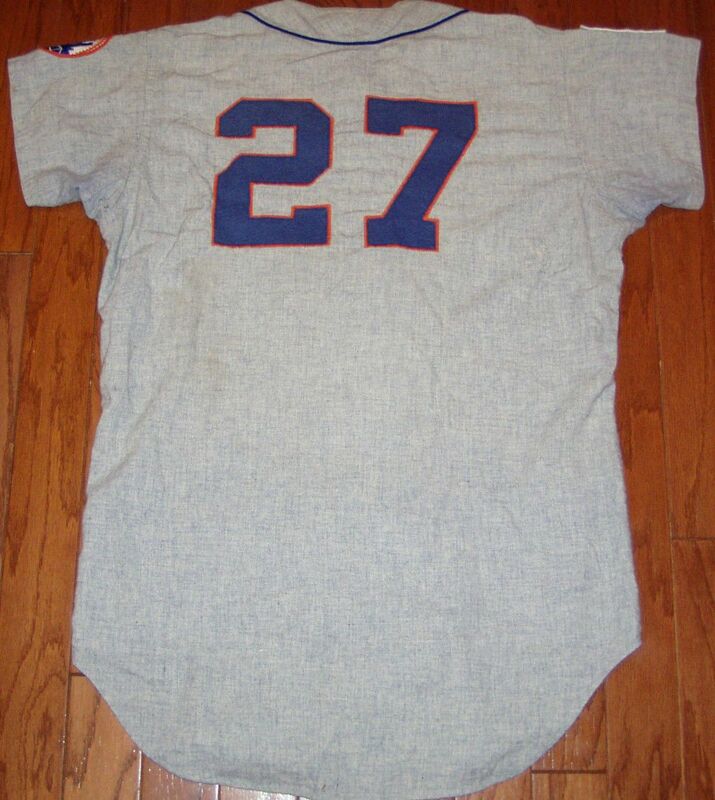 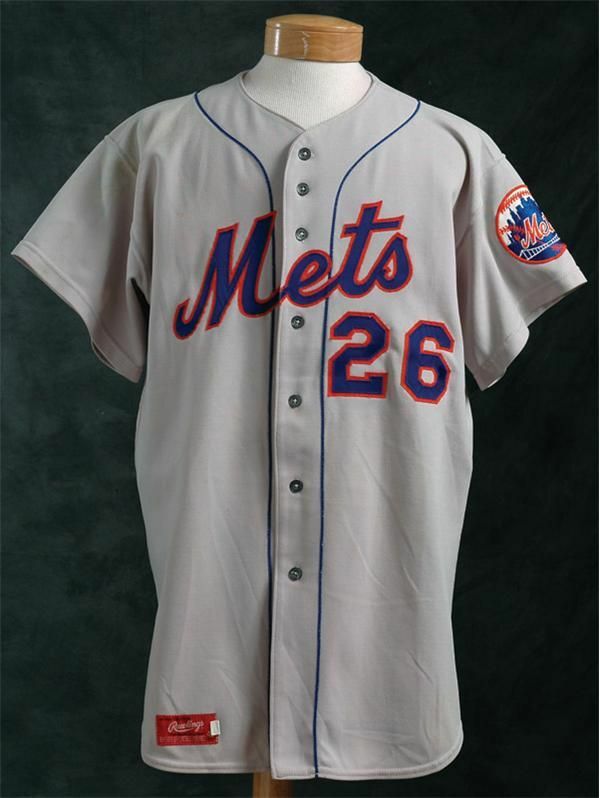 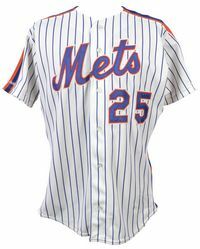 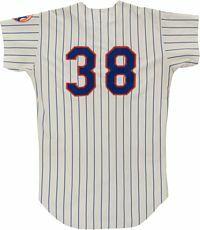 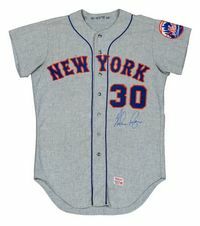 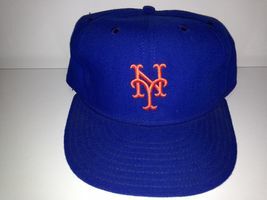 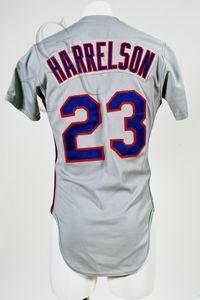 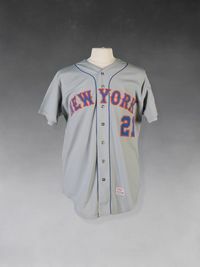 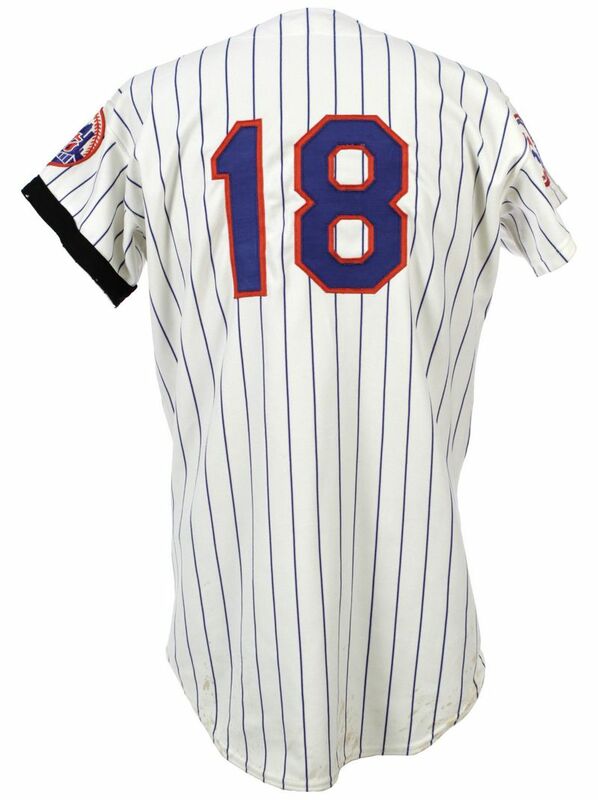 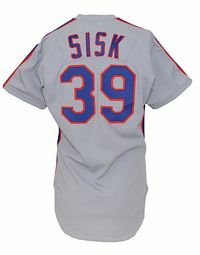 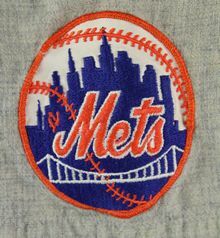 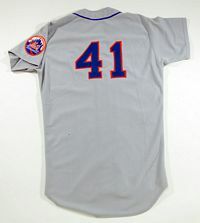 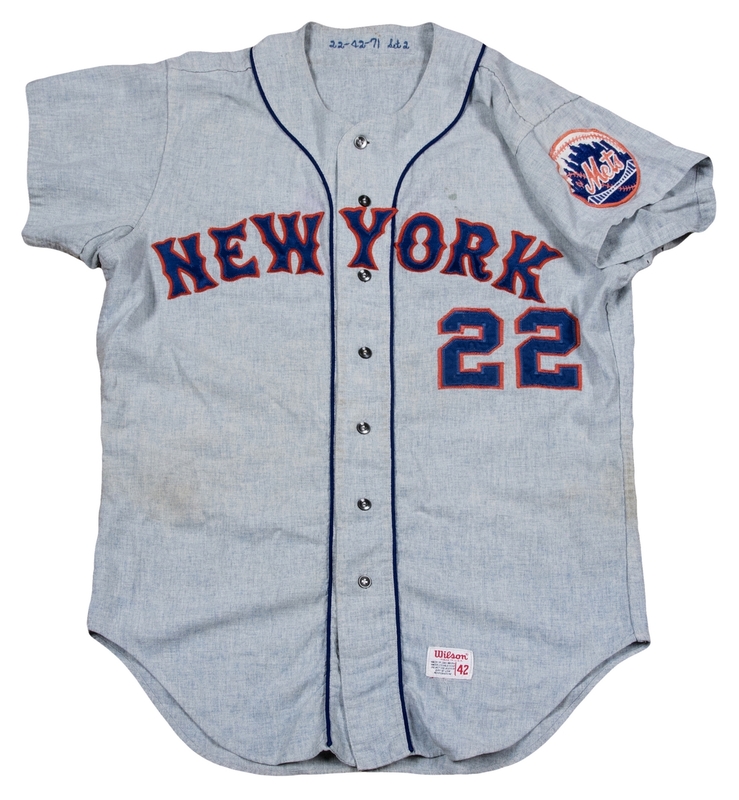 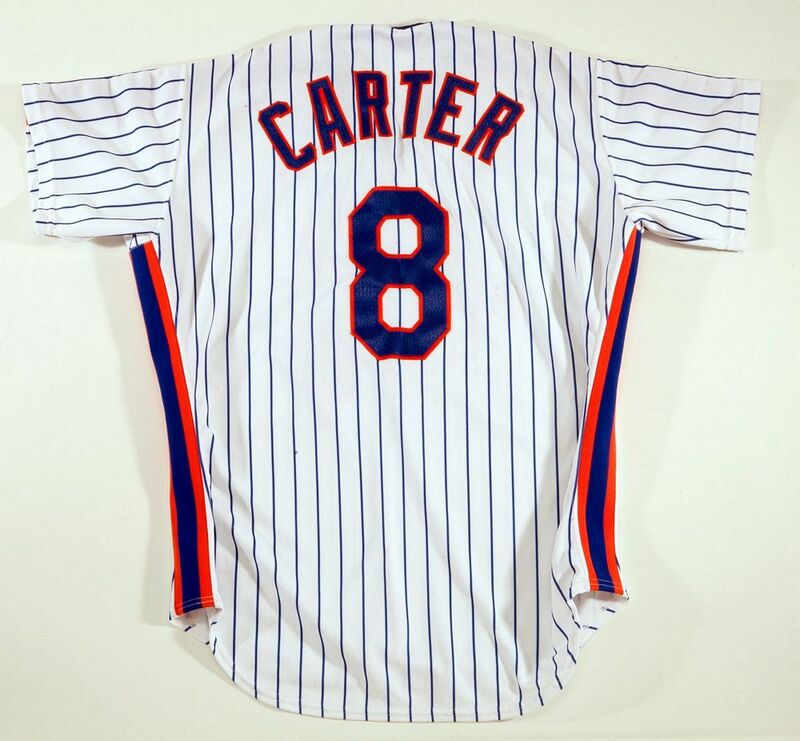 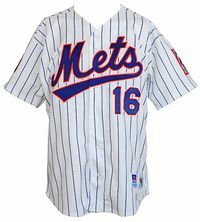 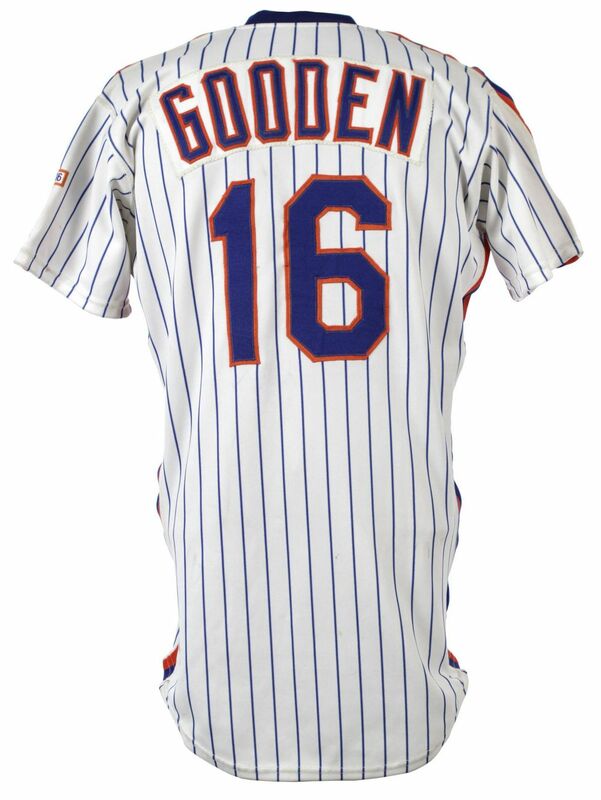 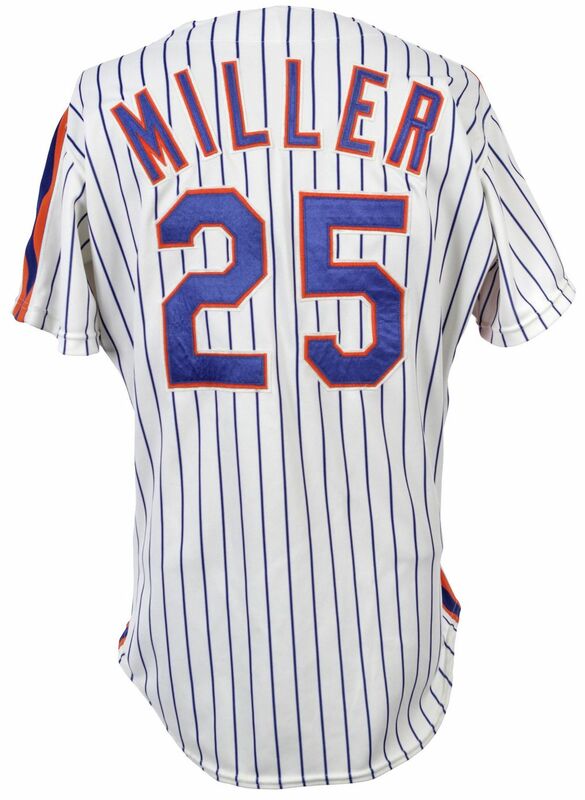 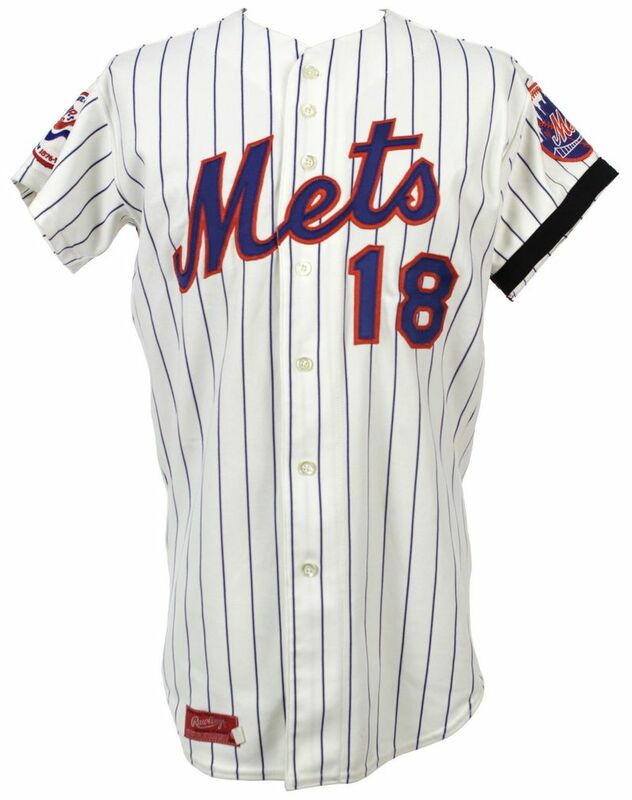 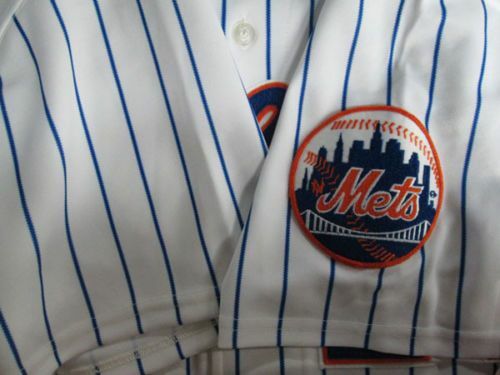 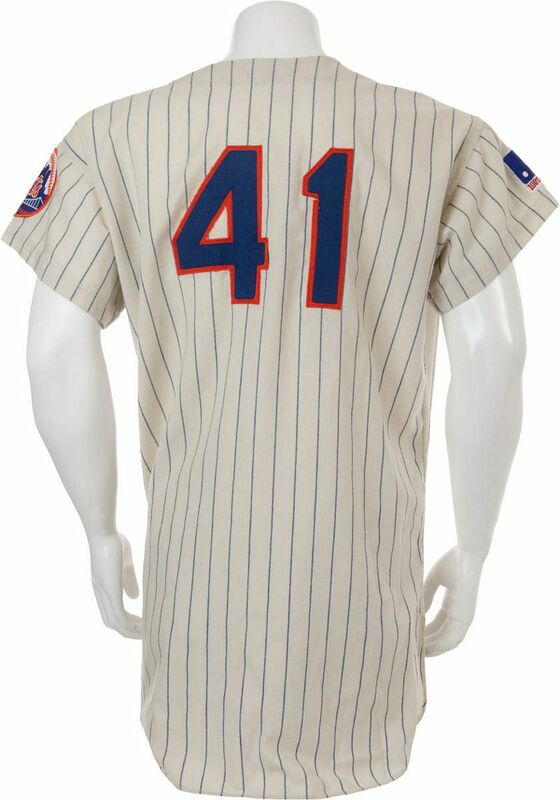 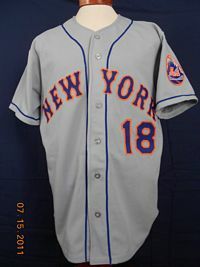 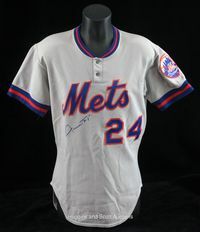 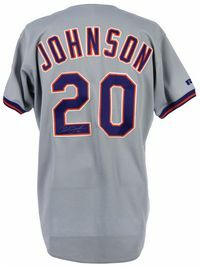 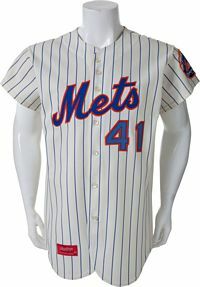 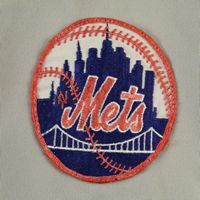 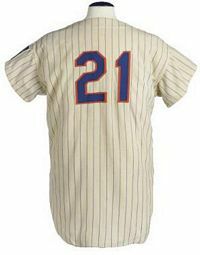 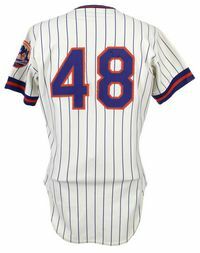 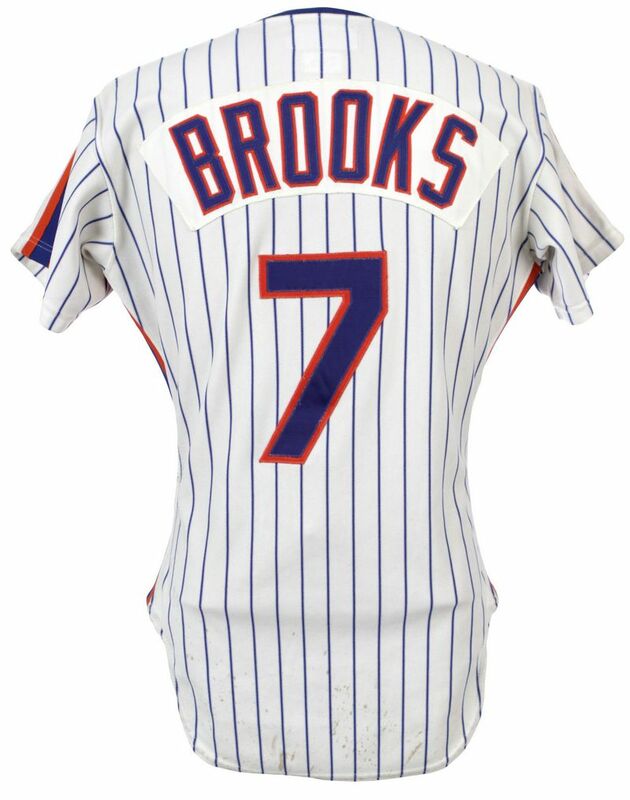 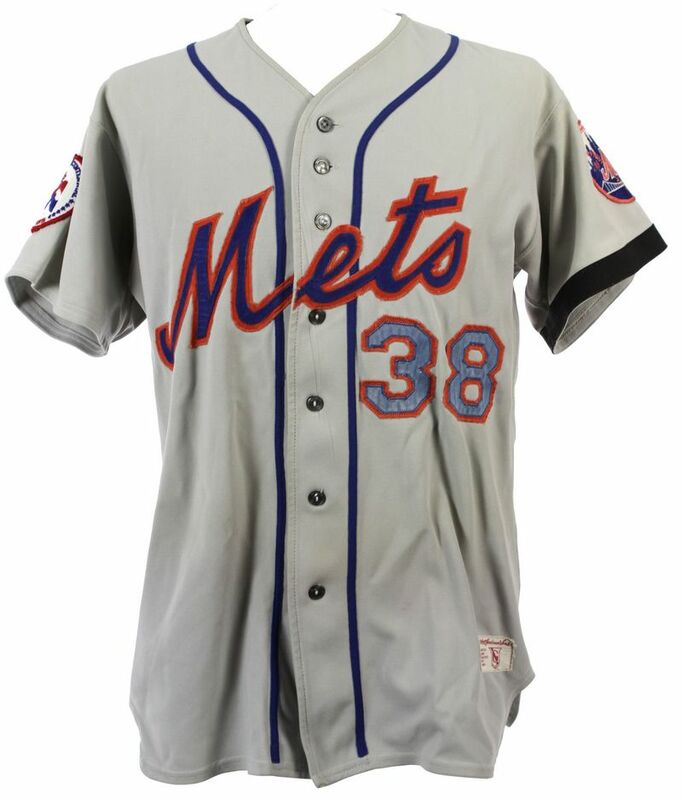 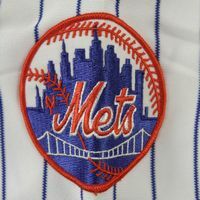 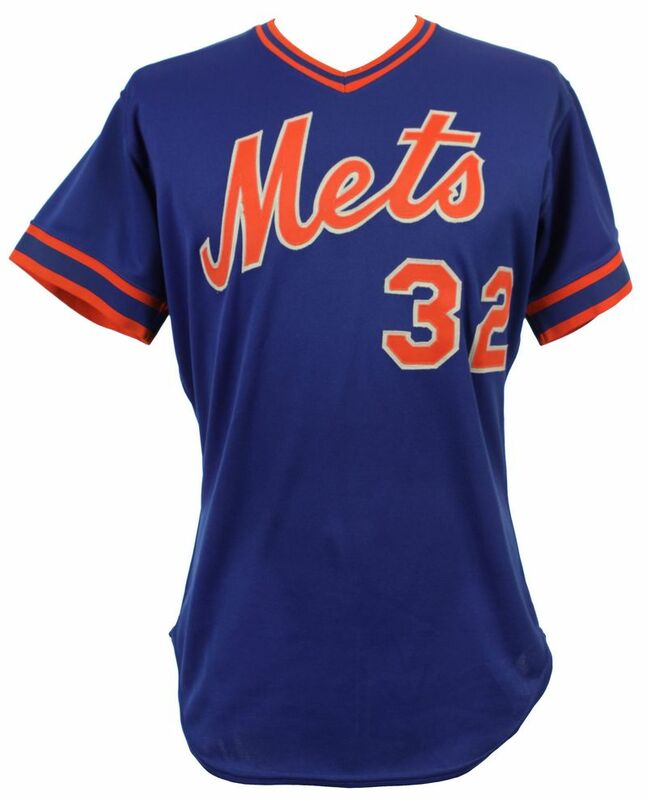 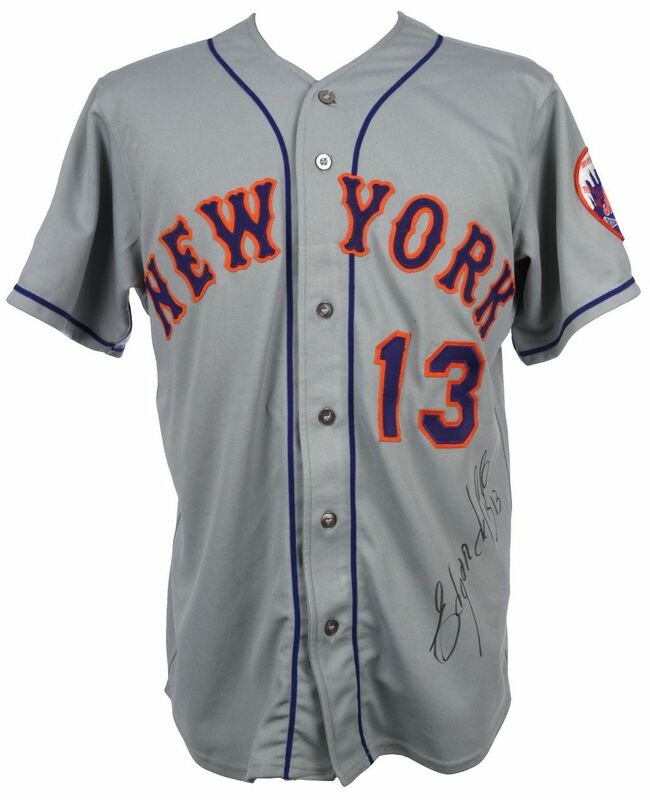 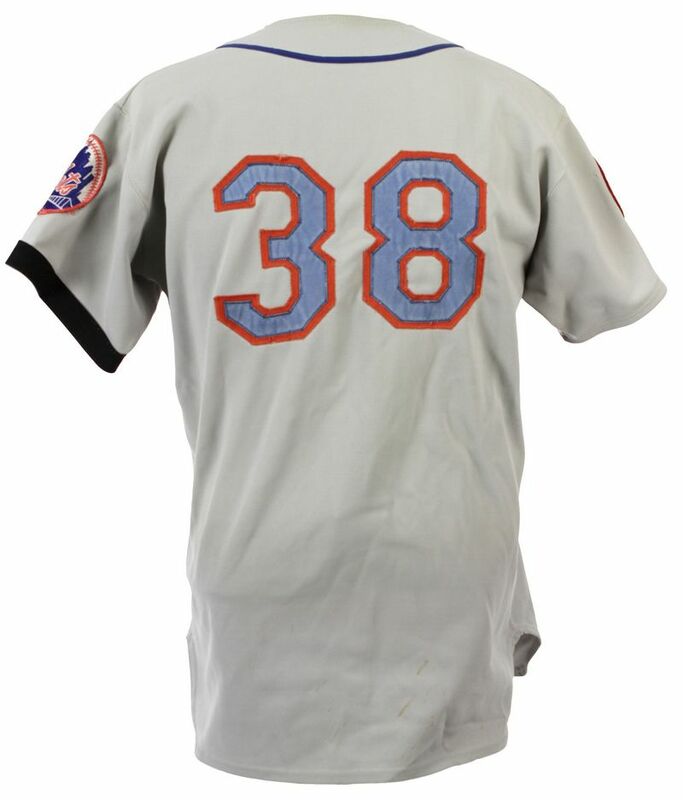 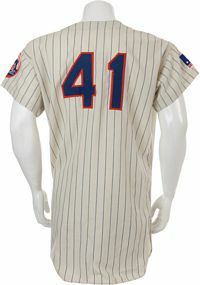 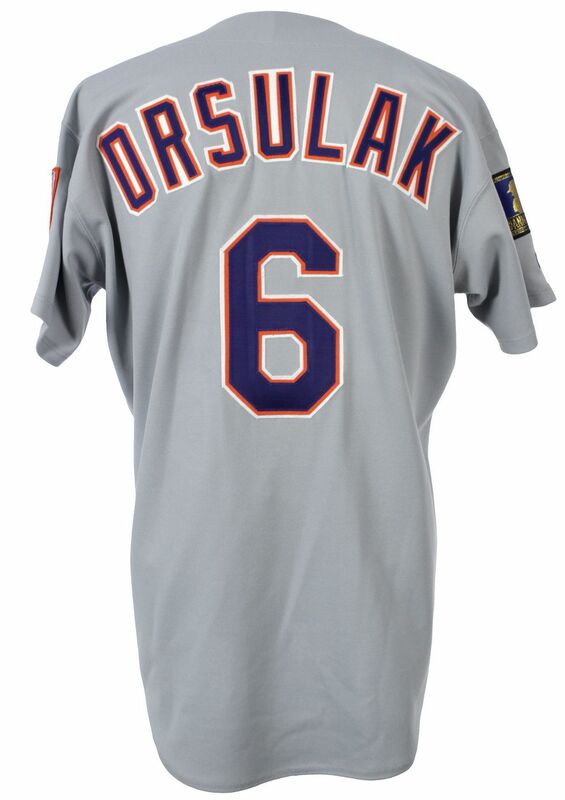 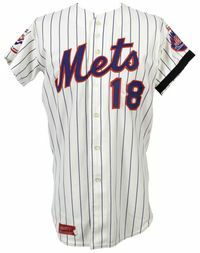 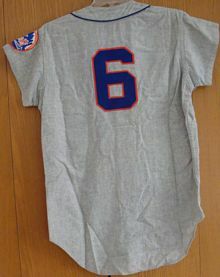 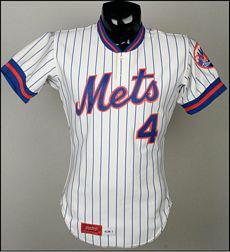 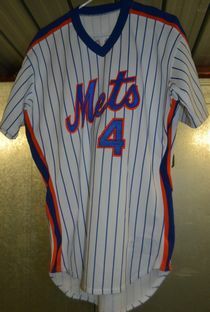 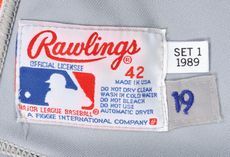 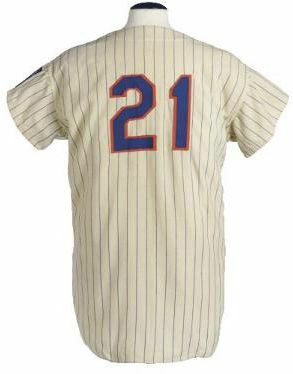 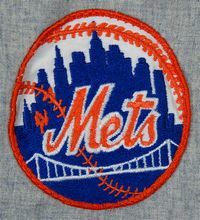 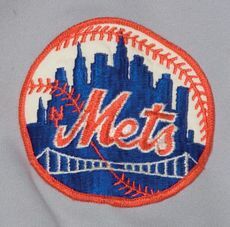 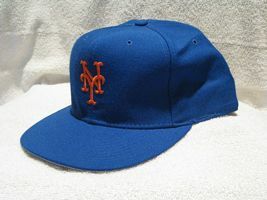 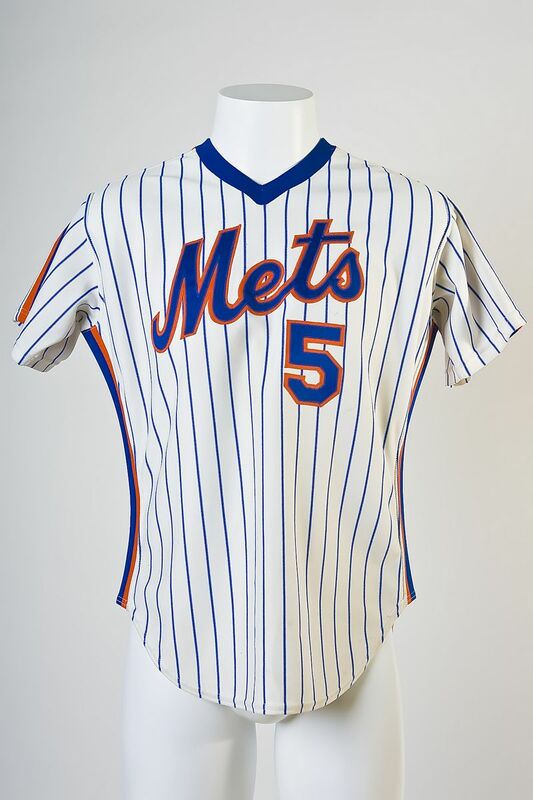 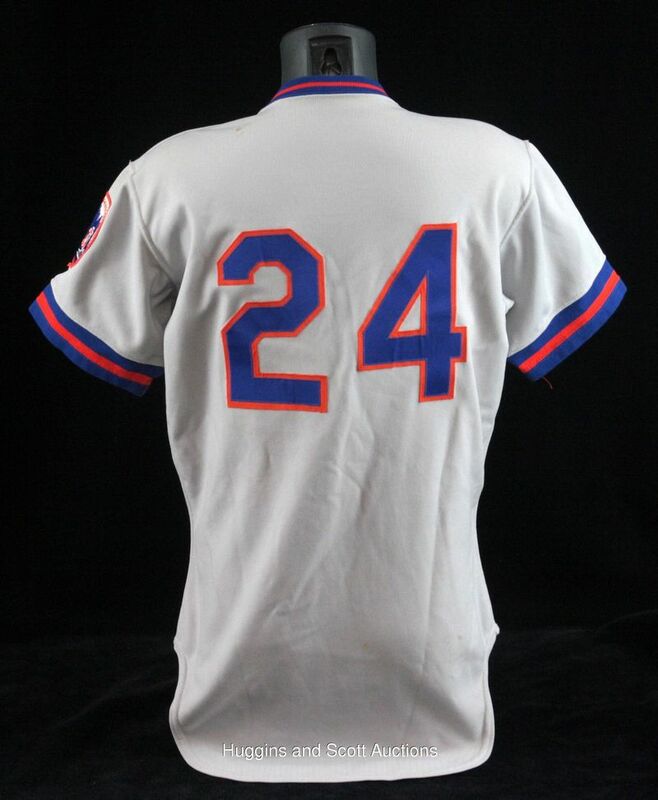 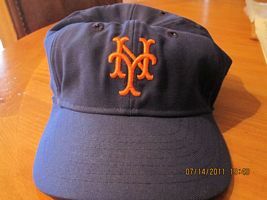 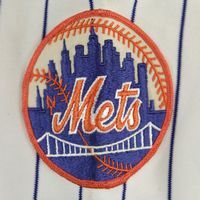 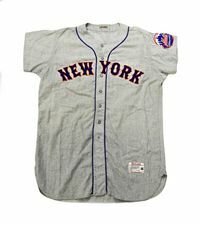 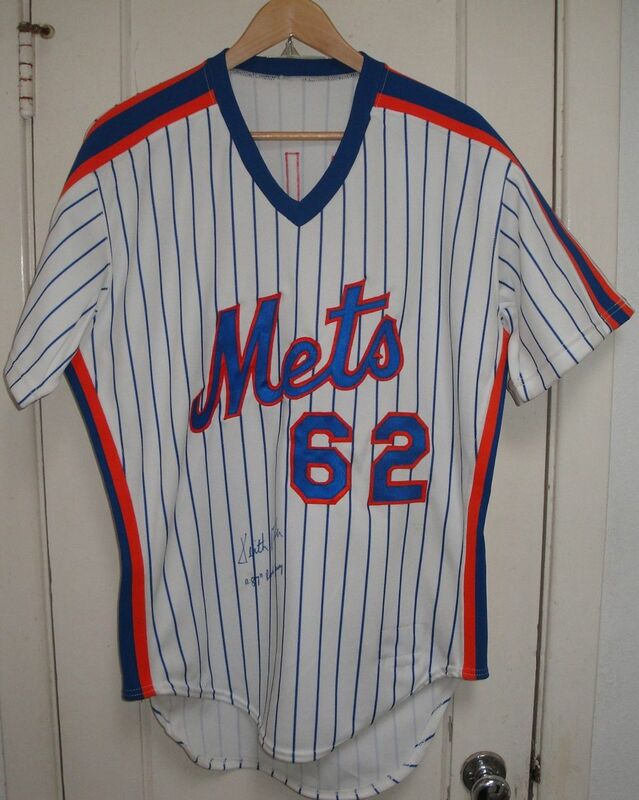 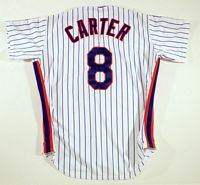 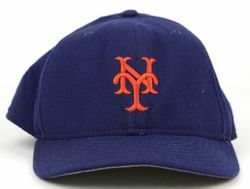 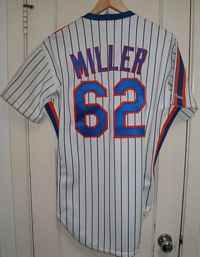 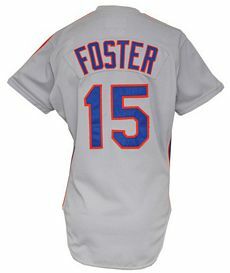 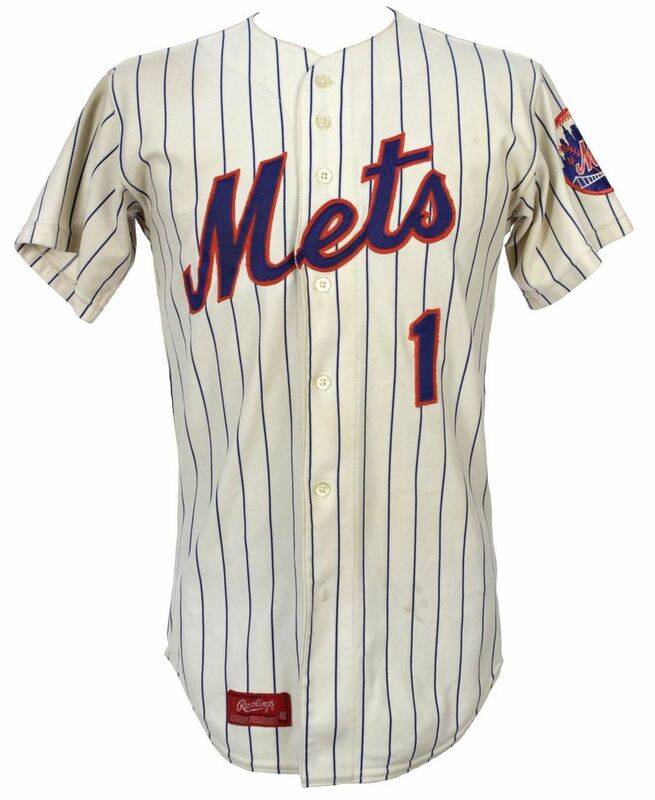 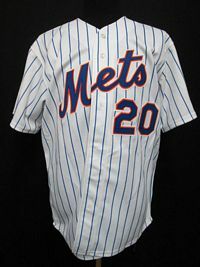 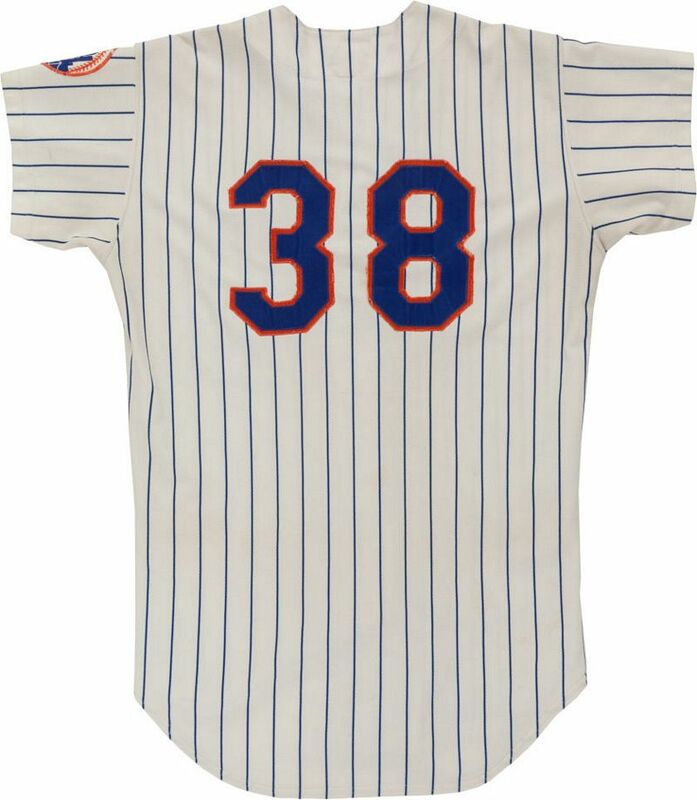 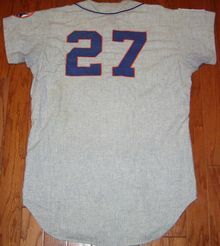 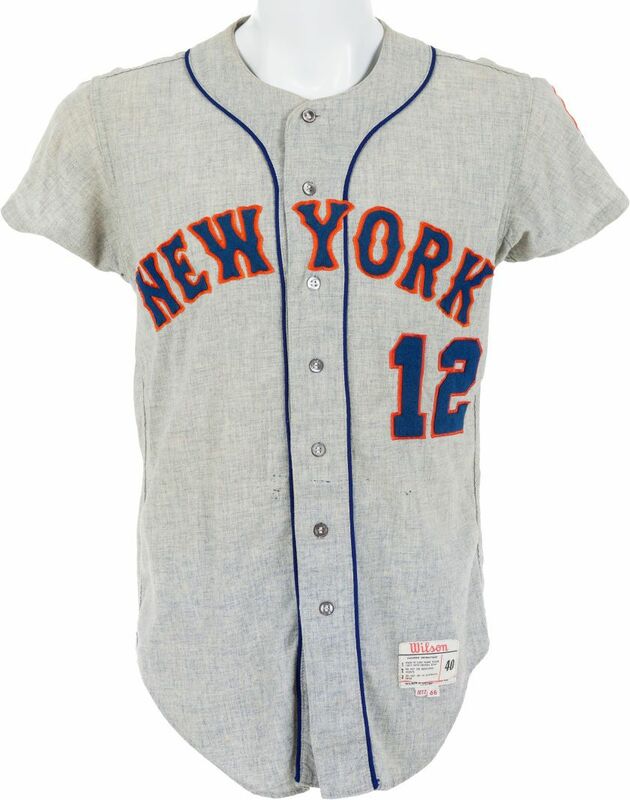 On home jerseys, it was on the left sleeve, replacing the Mets patch; on road jerseys, it was worn on the right sleeve, with the Mets patch worn on the left. 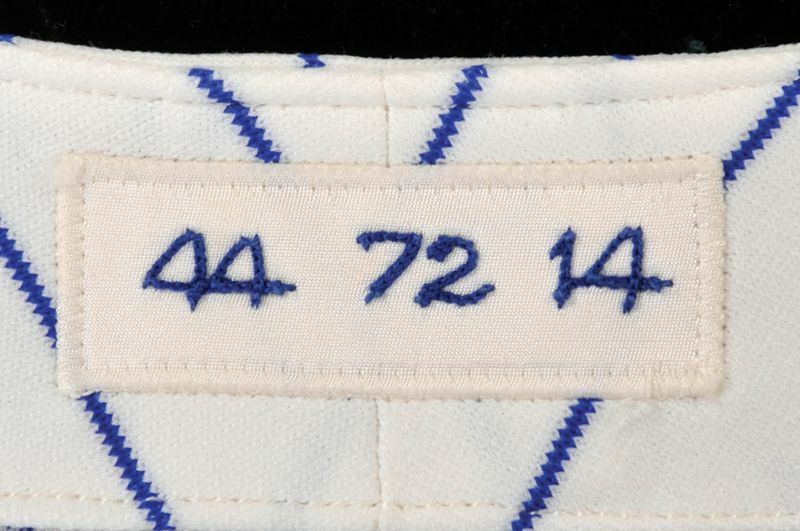 Numbers added to jersey fronts. 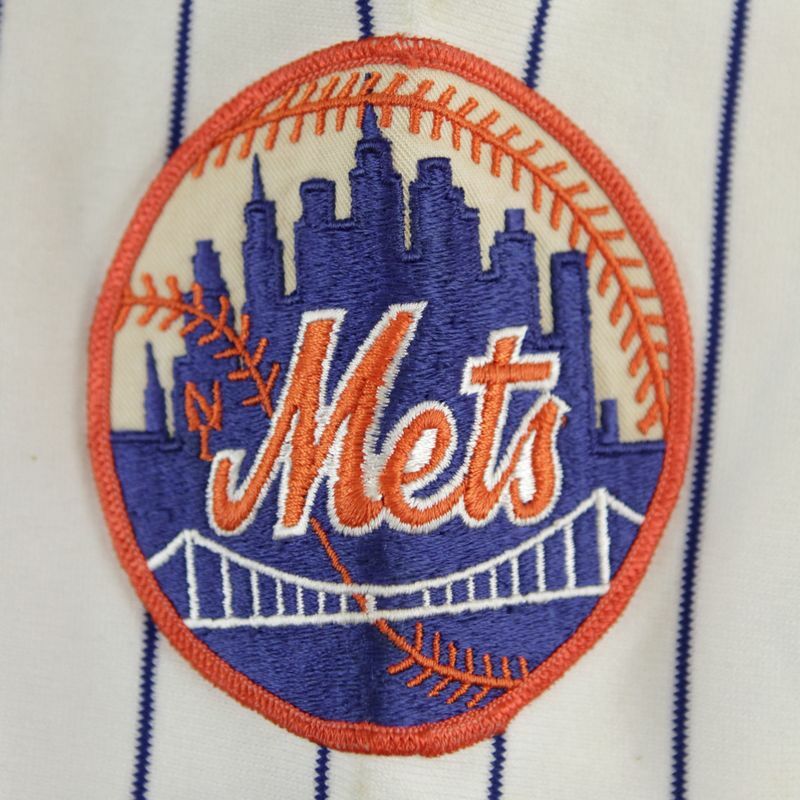 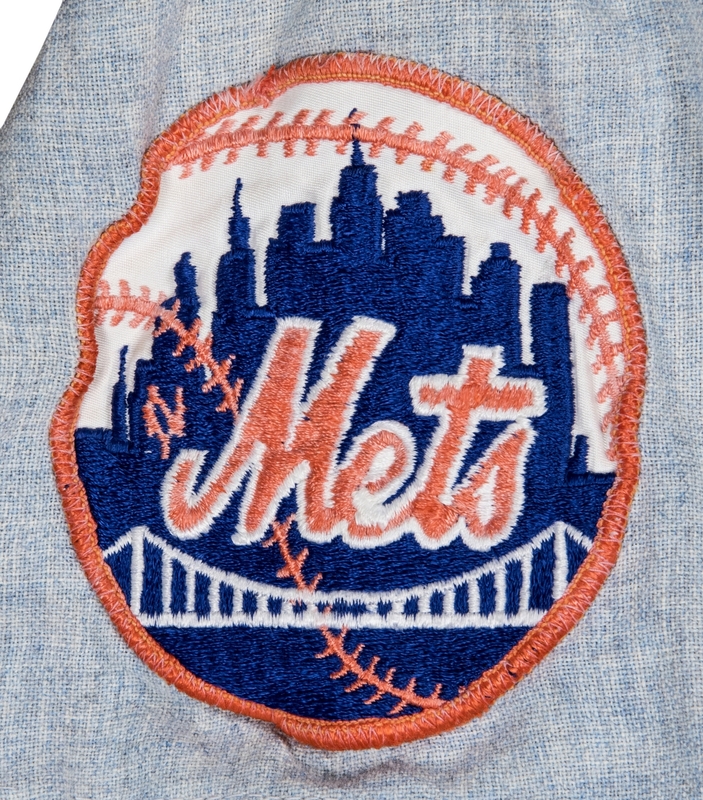 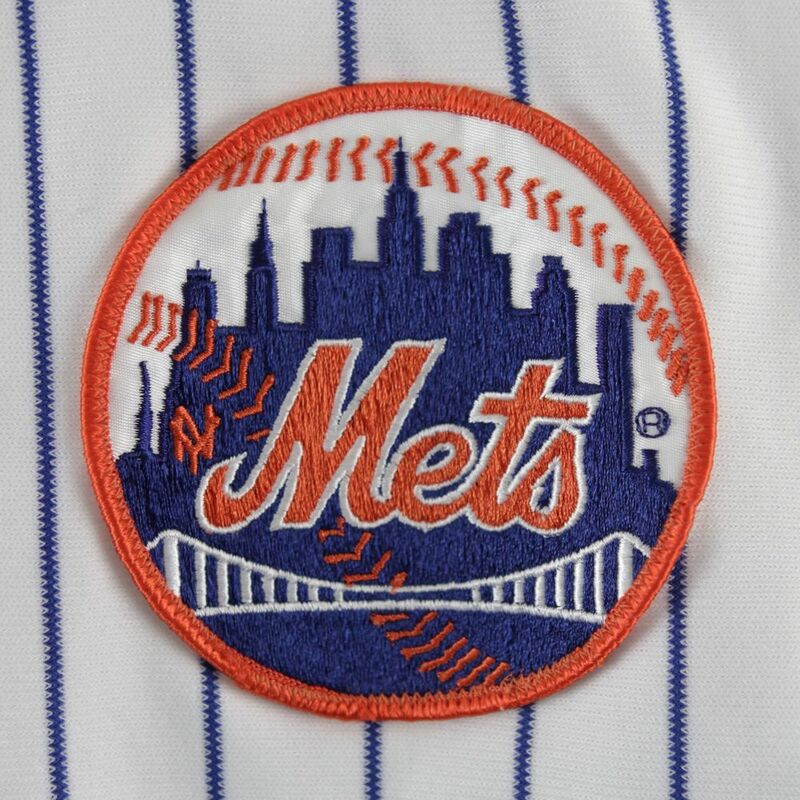 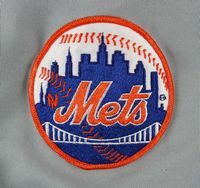 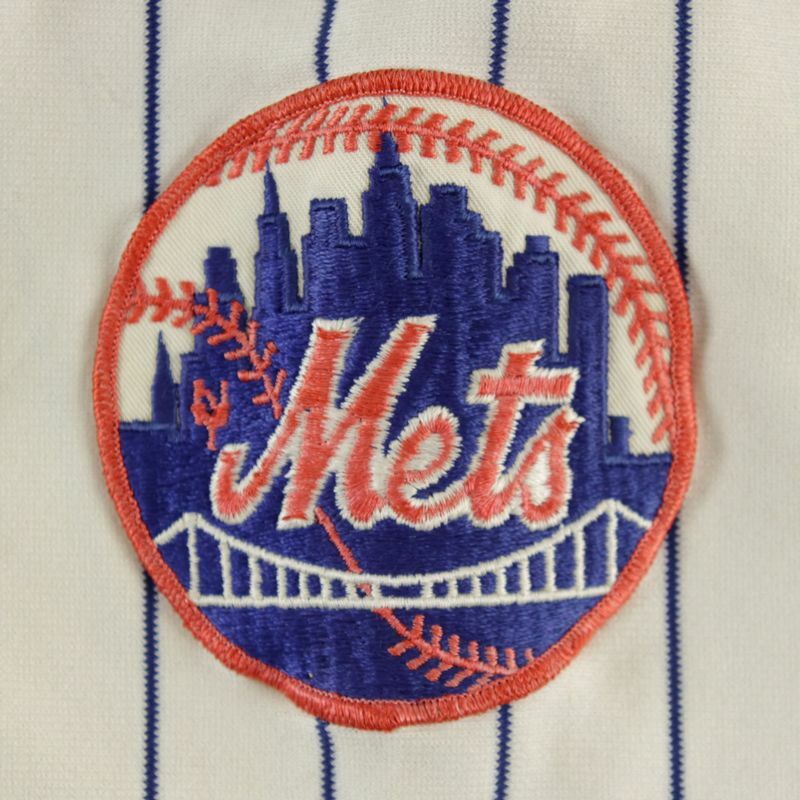 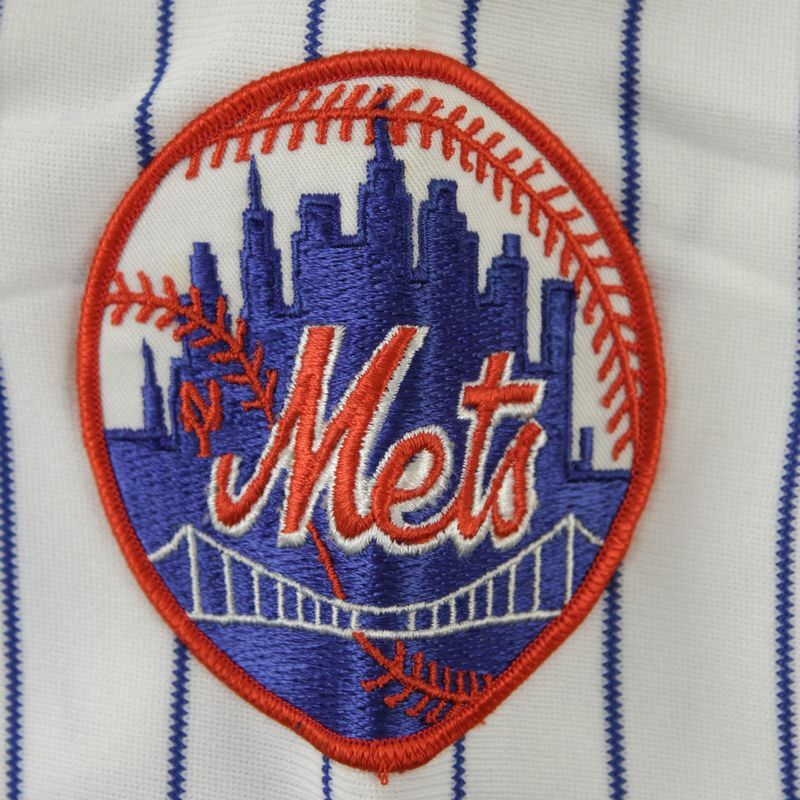 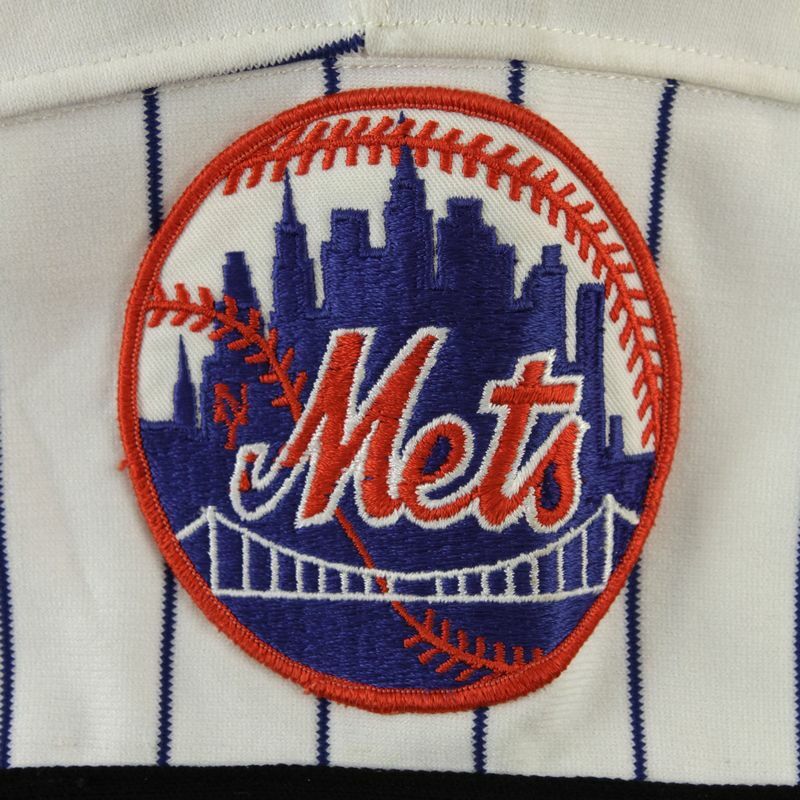 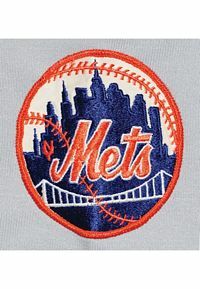 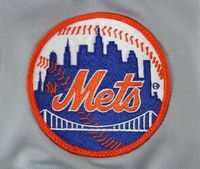 Mets sleeve patch returns to the home jersey. 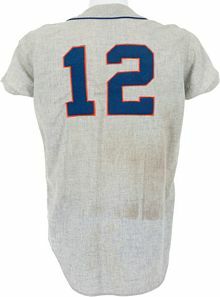 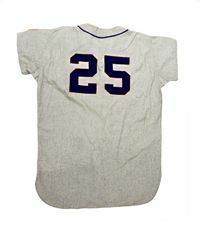 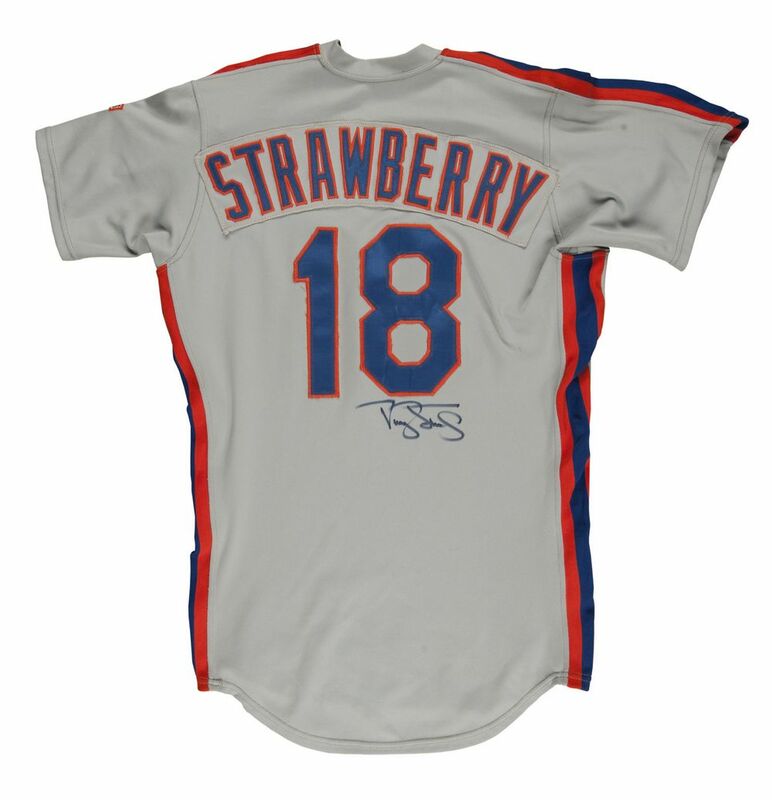 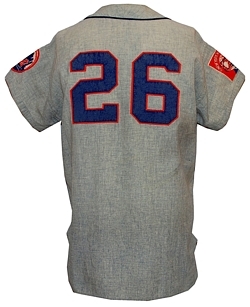 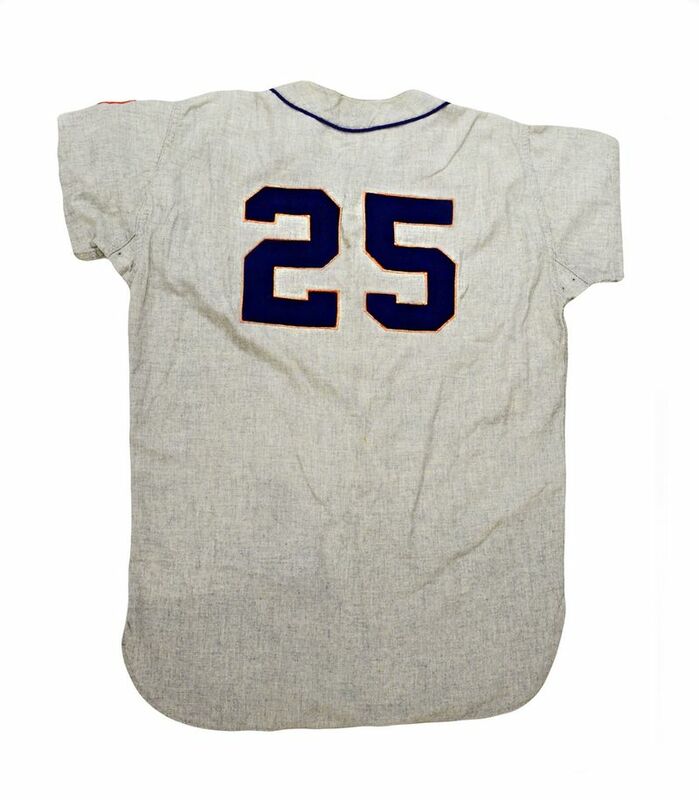 This is a 1964 jersey recycled for reuse in 1966. Double knit jerseys debut. 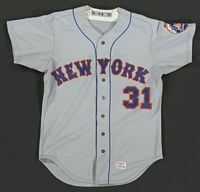 Little change other than the road jersey changes from blue-grey mist to grey. 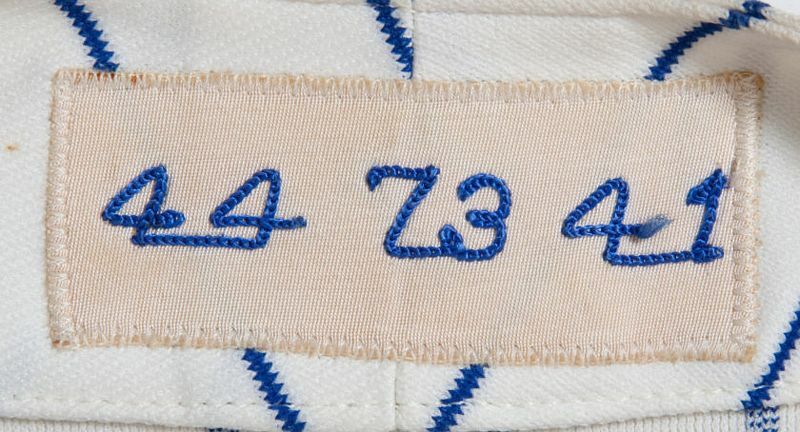 Home & road have different number fonts. 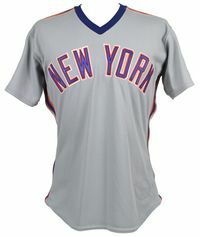 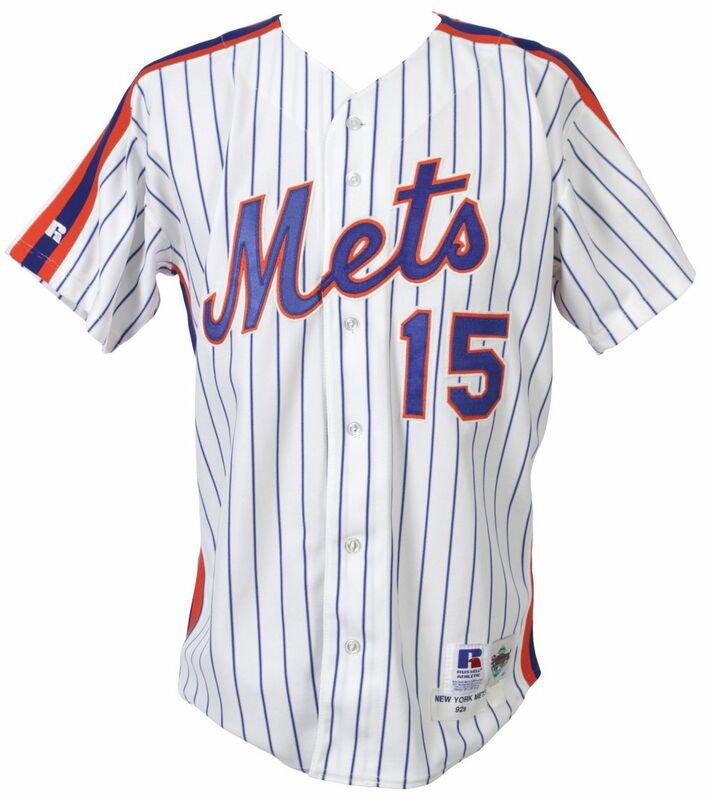 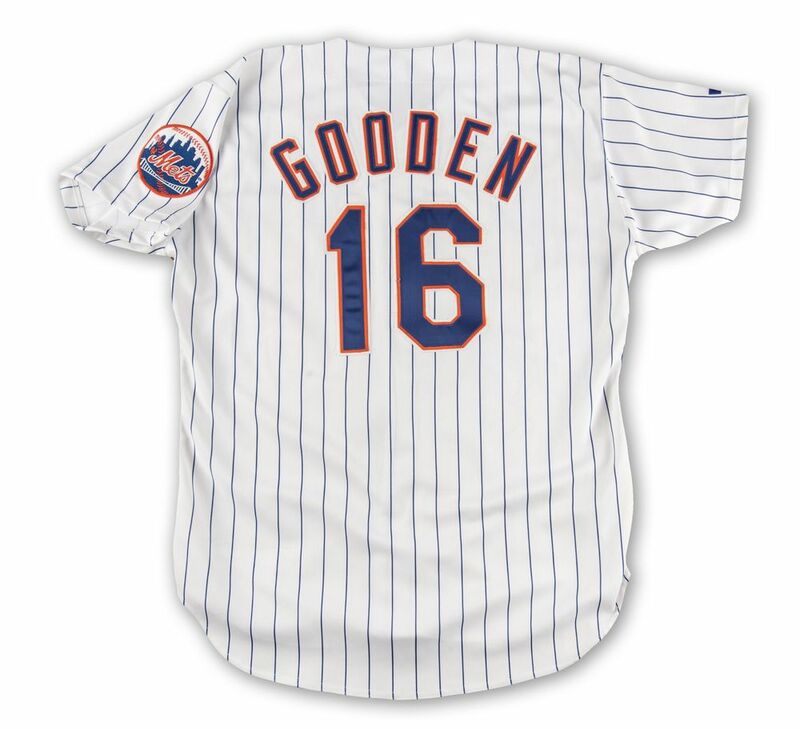 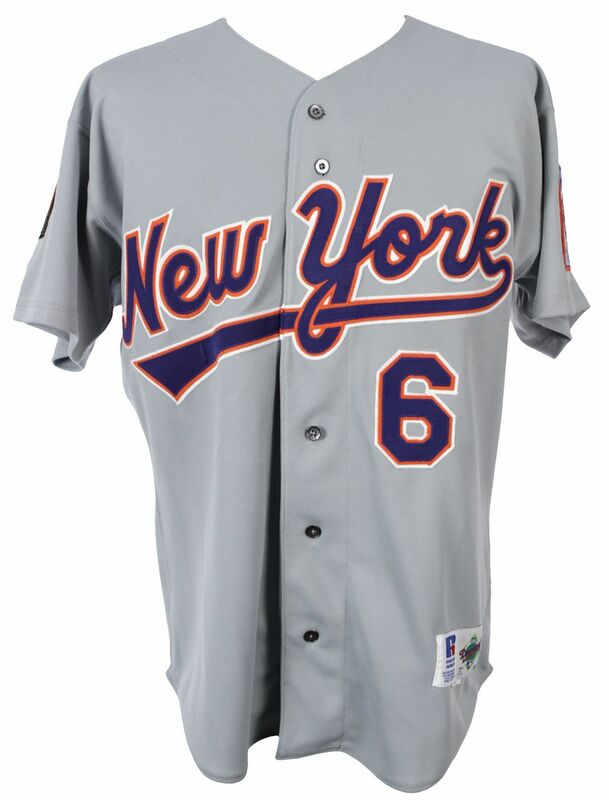 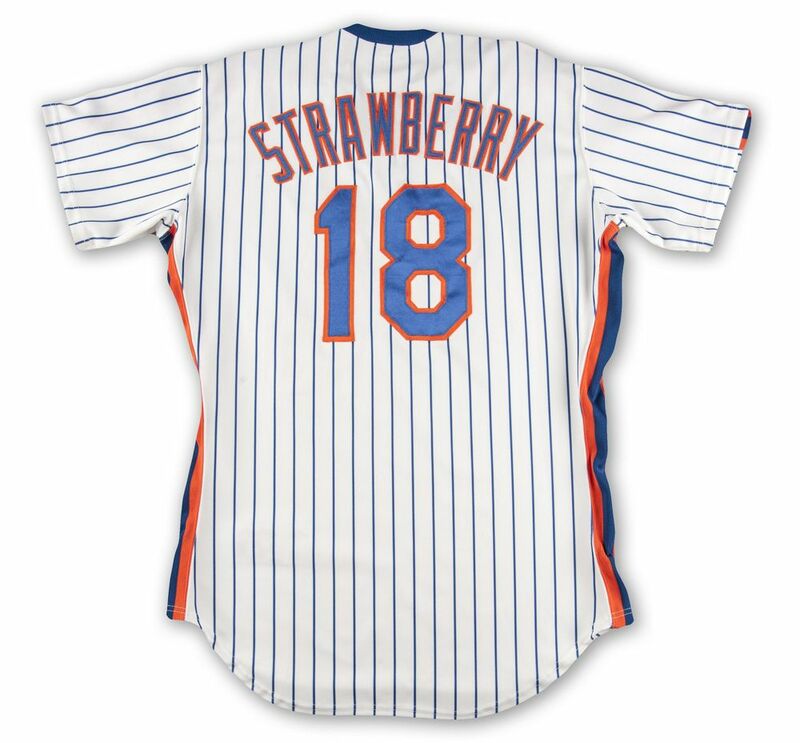 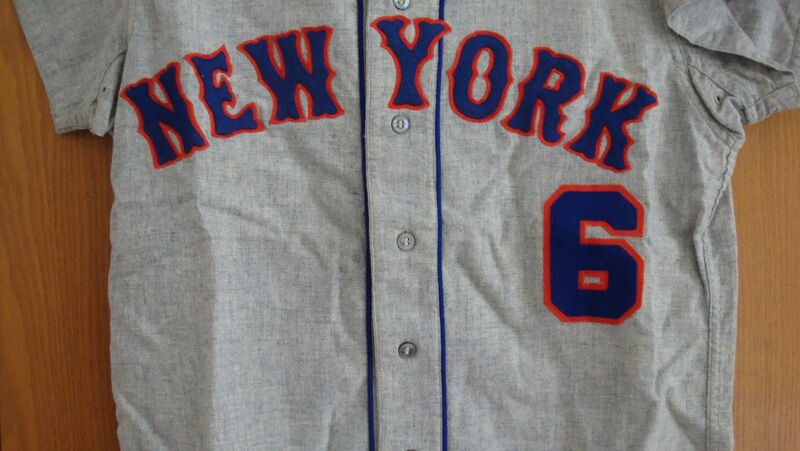 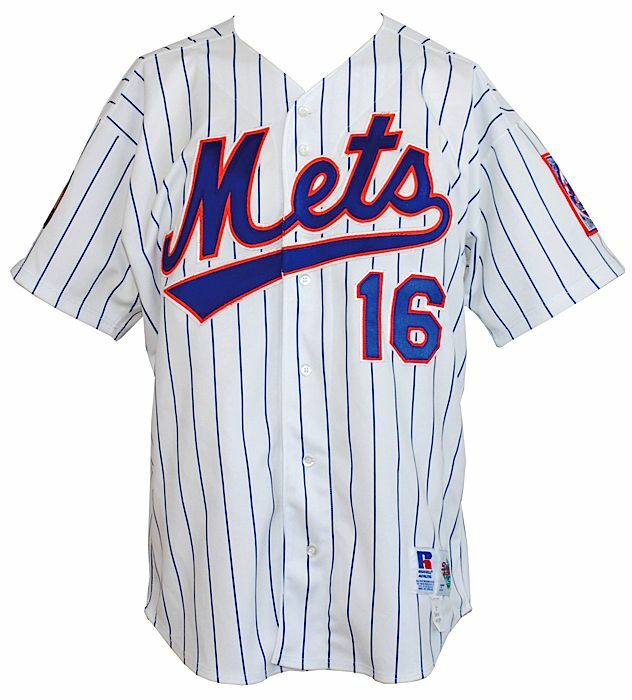 "Mets" replaces "NEW YORK" on the road jersey. 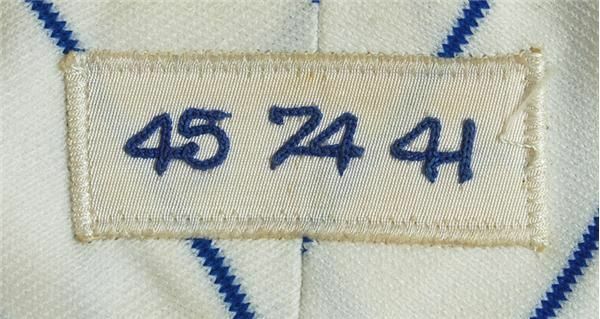 Home & road have different number fonts. 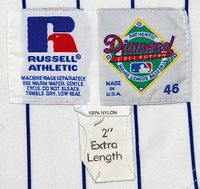 Jerseys change to a unique two-button pullover style. 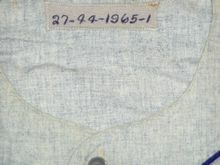 Stripes added to collars and sleeve cuffs. 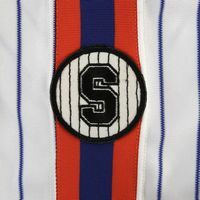 Piping removed from road jersey. 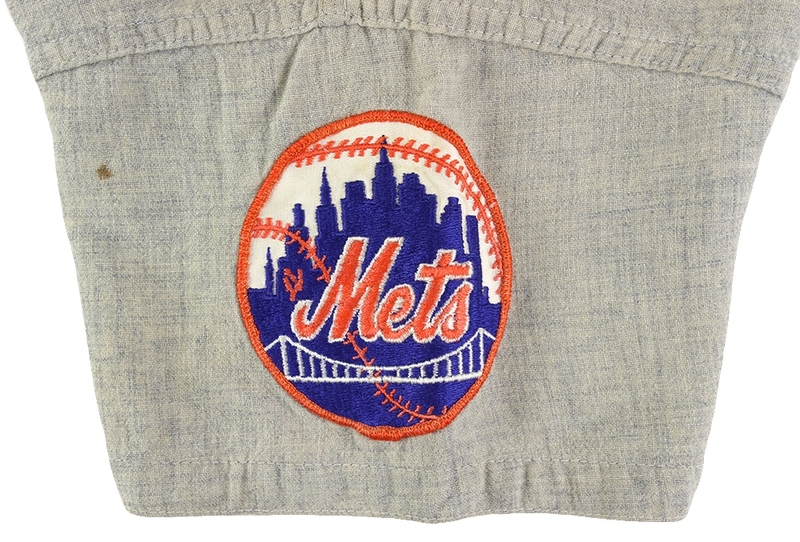 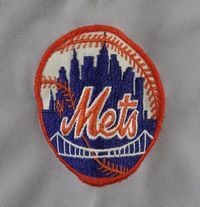 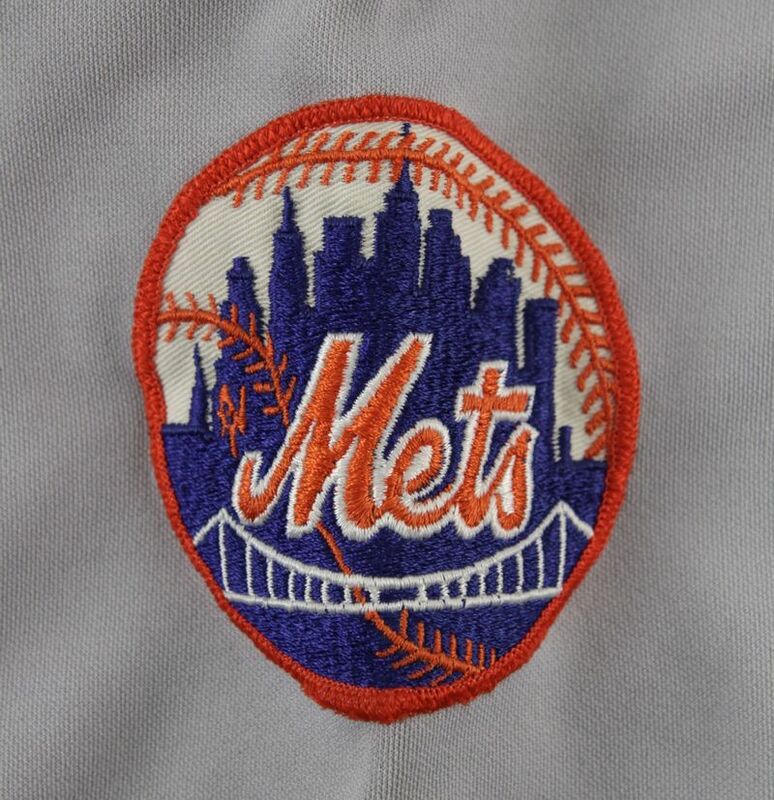 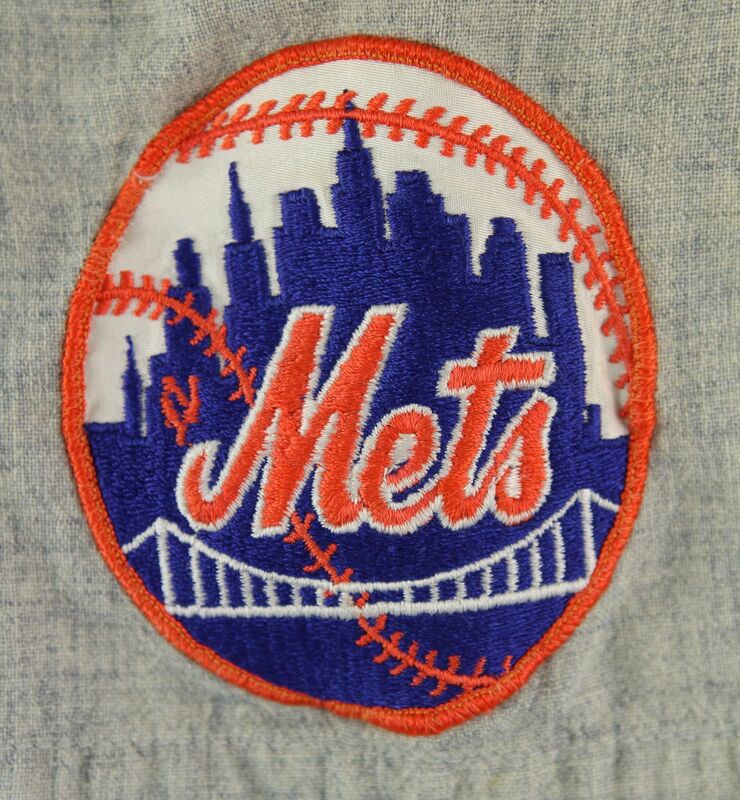 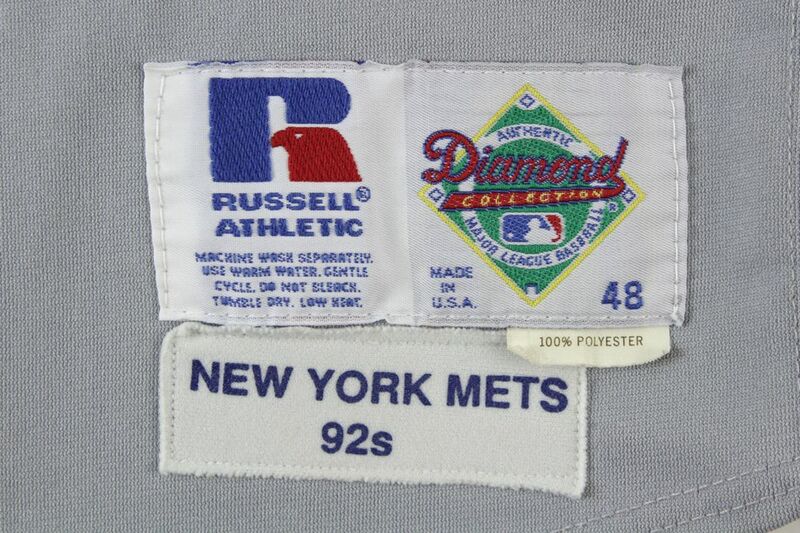 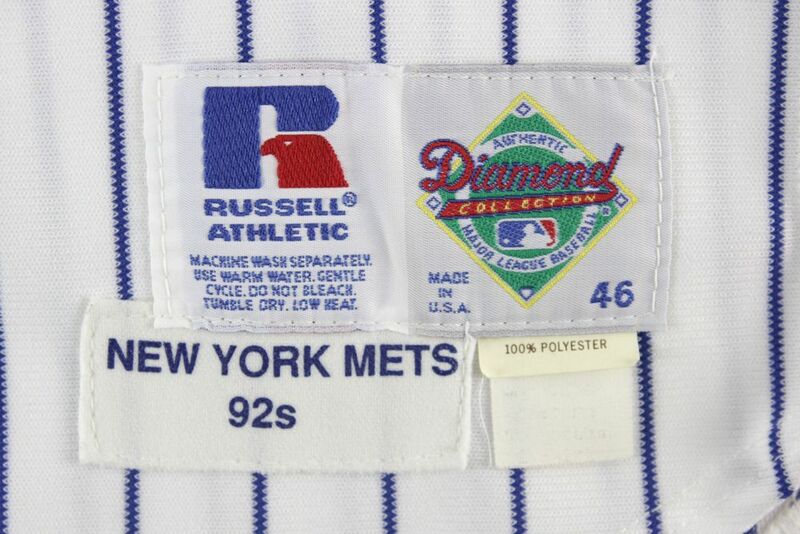 "Mets" sleeve patch removed. 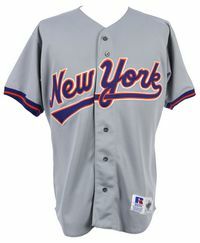 Other than that, the home jersey is unchanged. 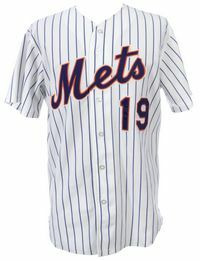 Racing stripes replace cuffs on the road jersey and a V-neck replaces buttons. A blue alternate jersey is introduced with orange lettering and silver trim, but seems it was hardly used, if at all - anyone have more info? 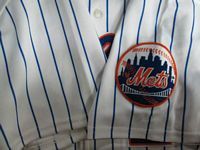 Home jersey changes to match the road style. 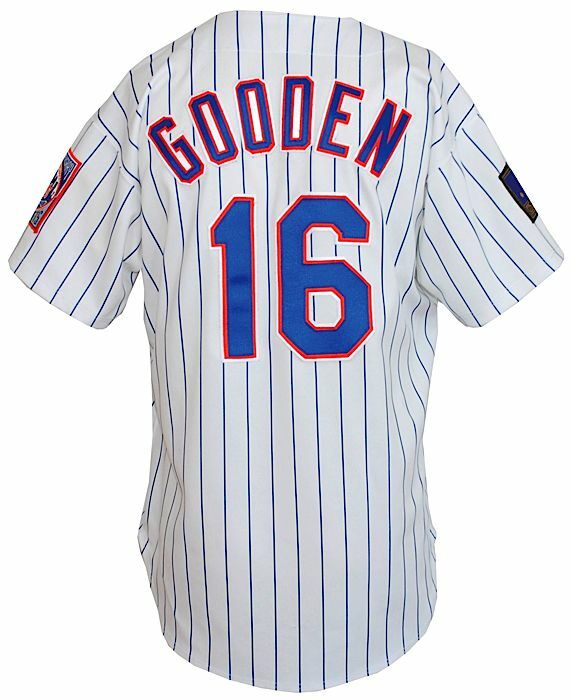 A blue alternate jersey like the 1982 version is made, but again, not sure if it was used much if at all, since a second alternate is introduced with lettering colors reversed, and that one is used regularly. 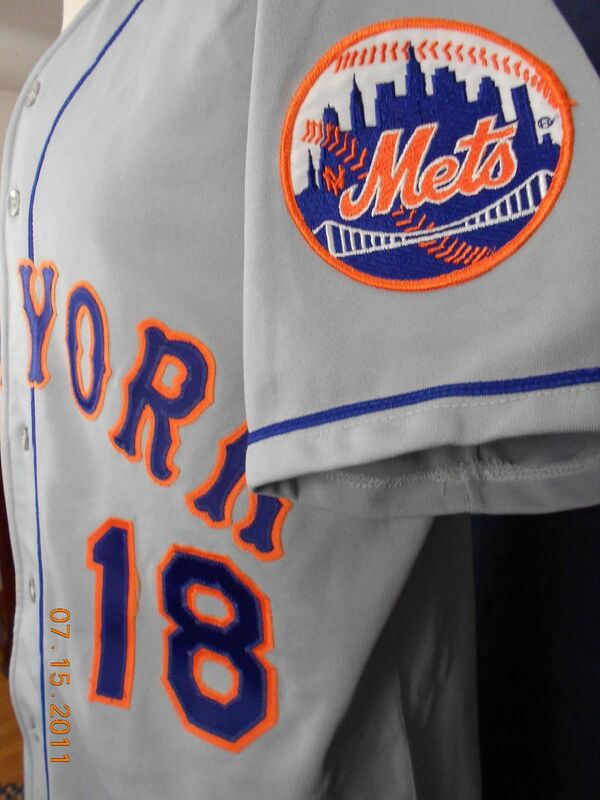 The alternate with orange lettering is gone. 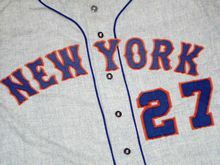 Road jersey script changes to "New York". 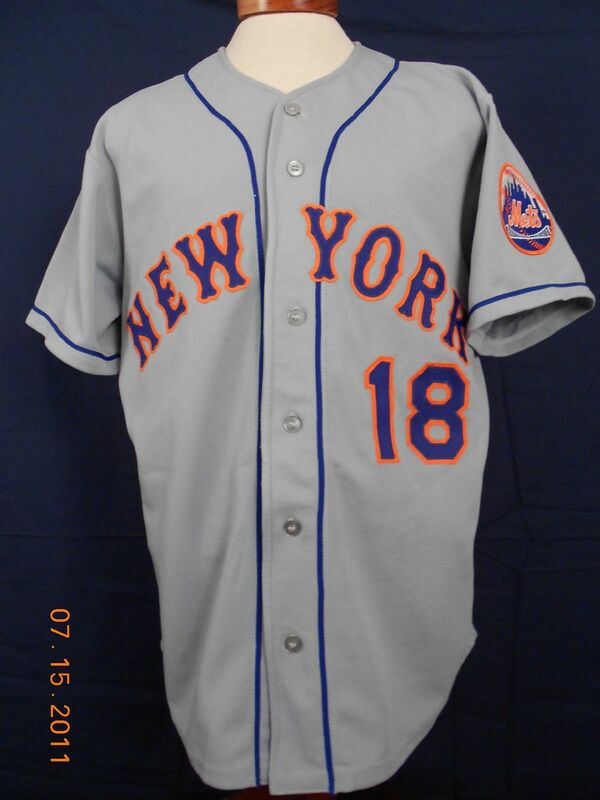 NOB now sewn directly without nameplates. 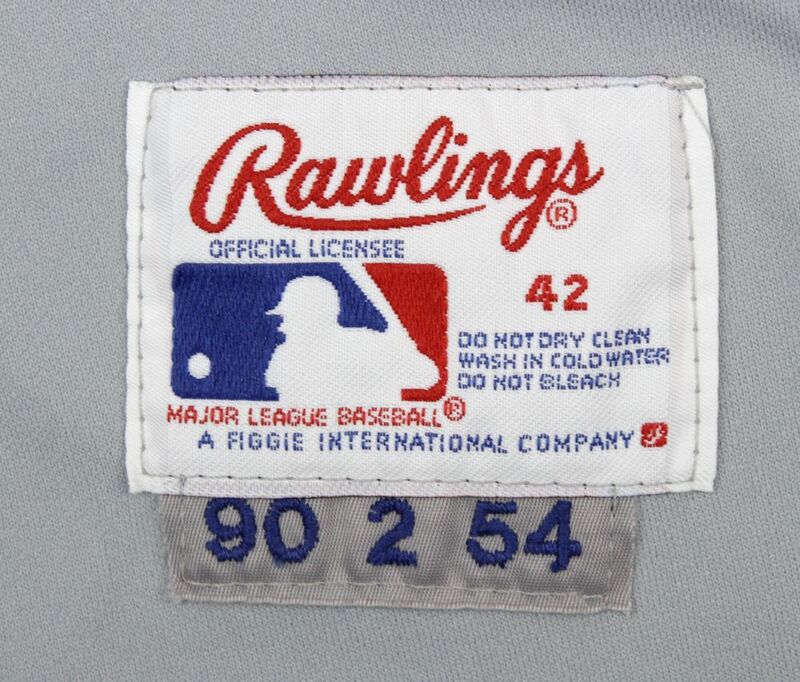 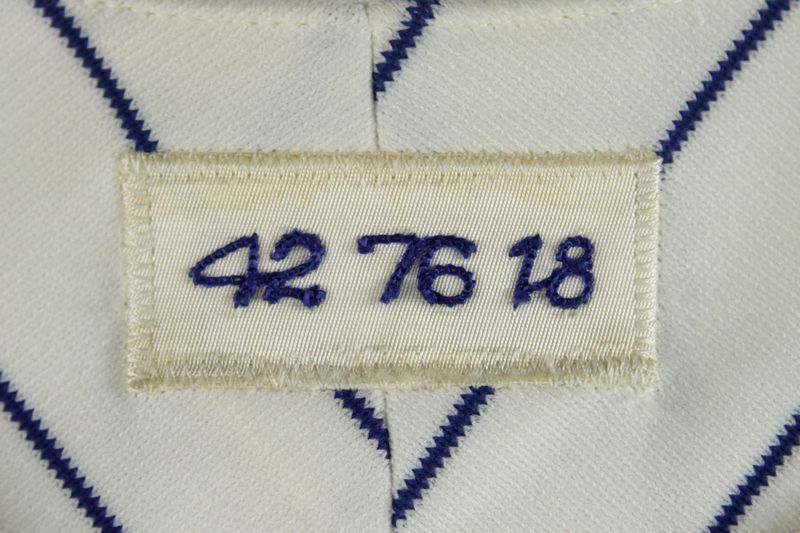 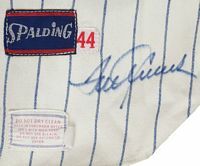 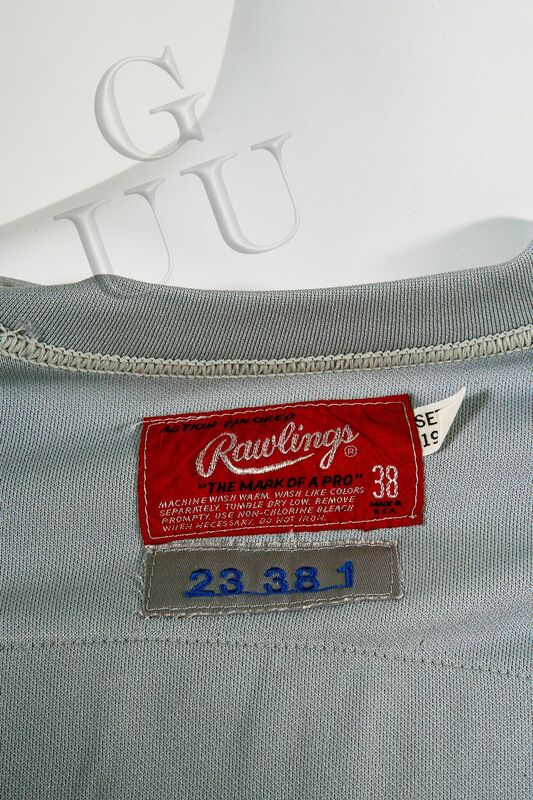 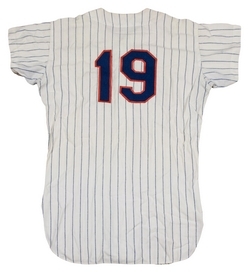 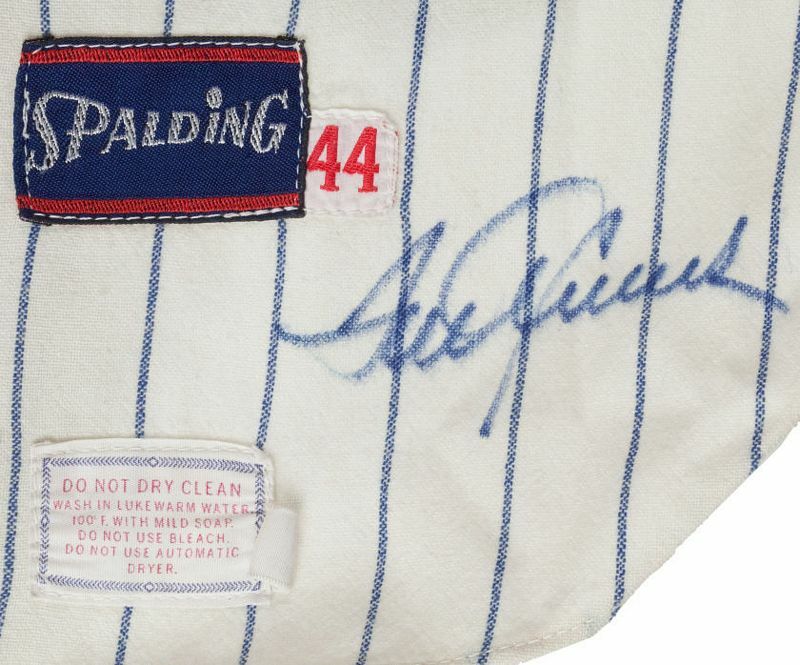 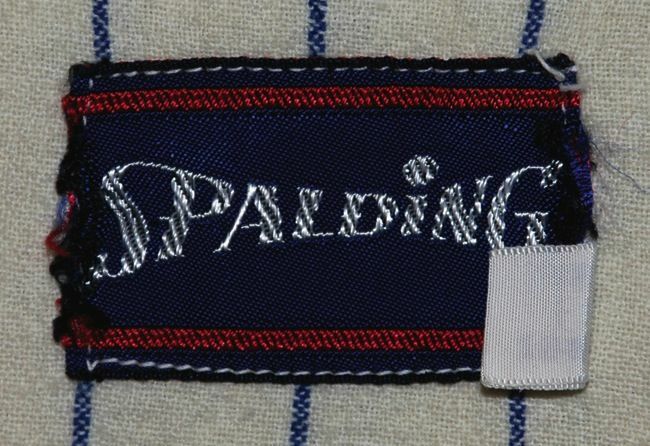 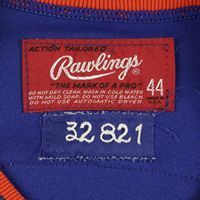 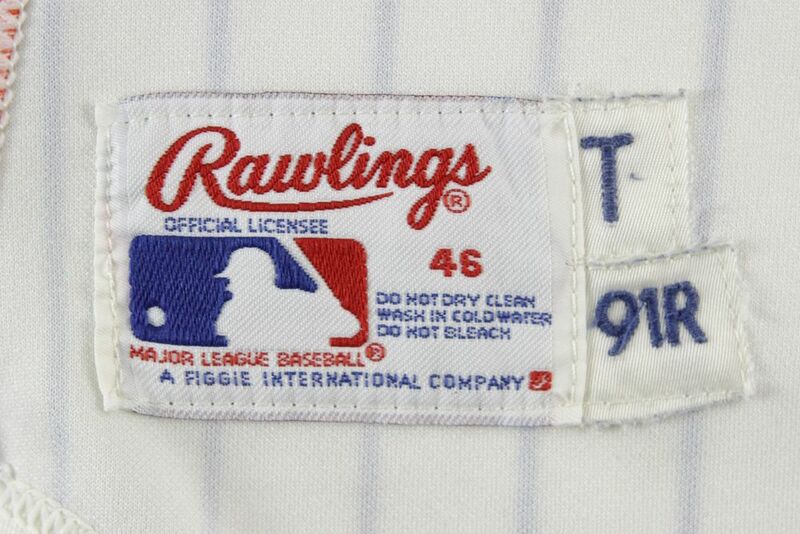 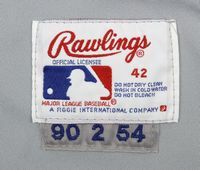 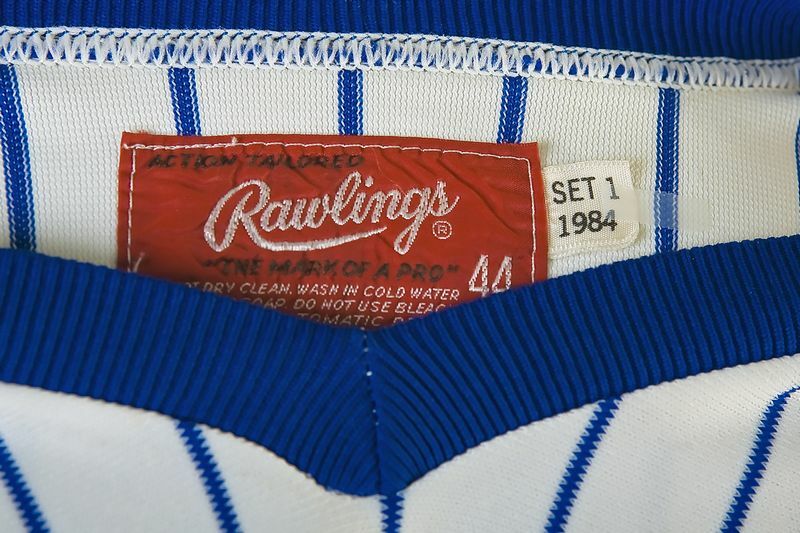 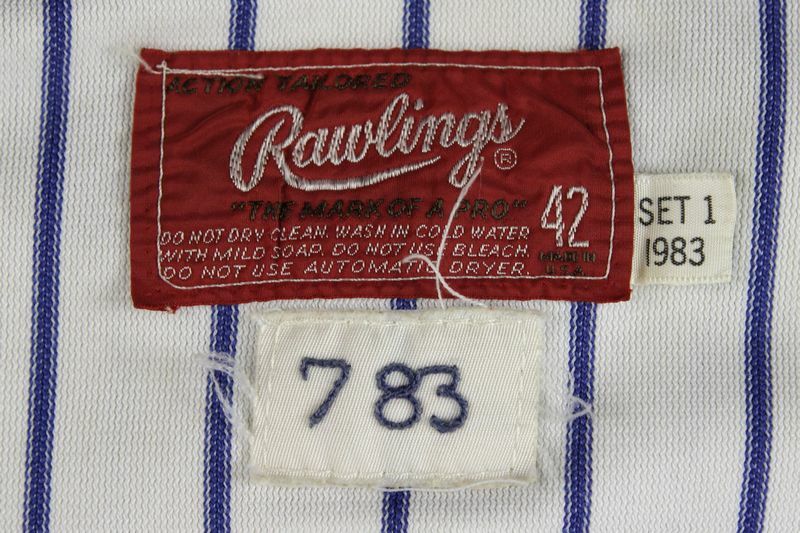 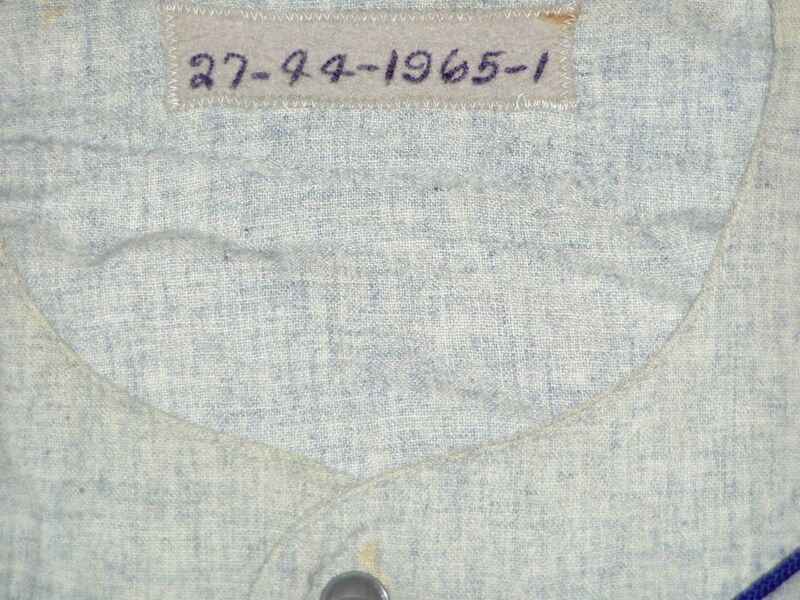 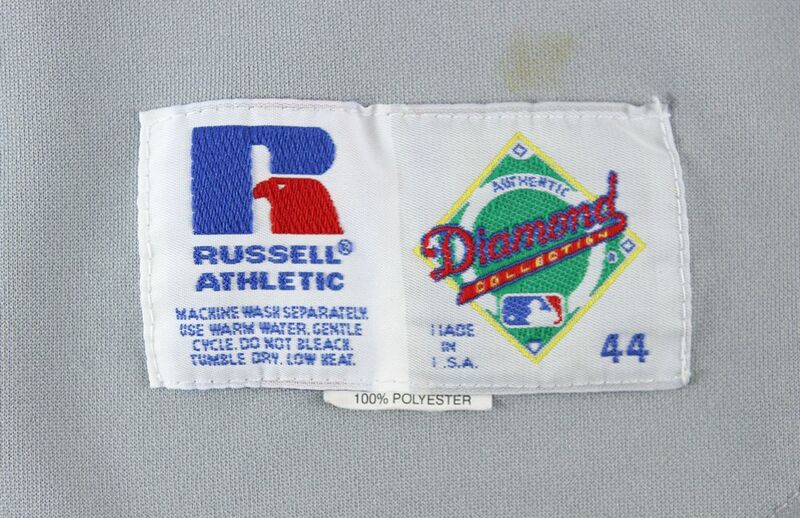 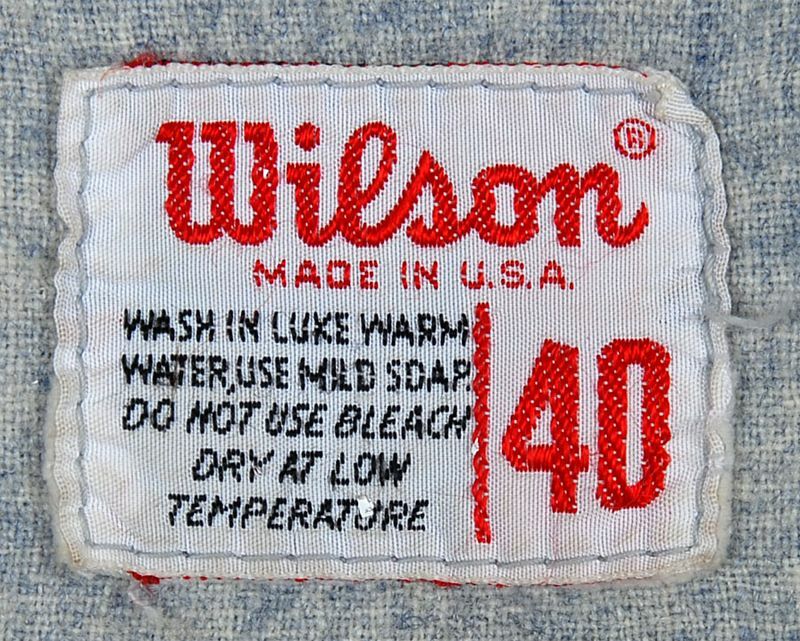 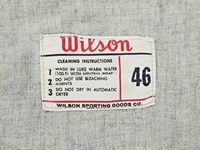 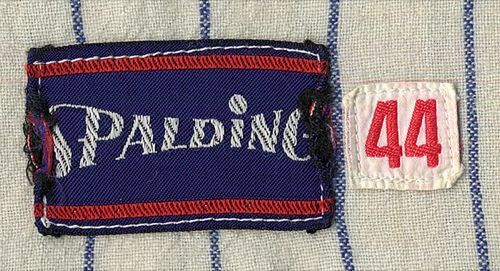 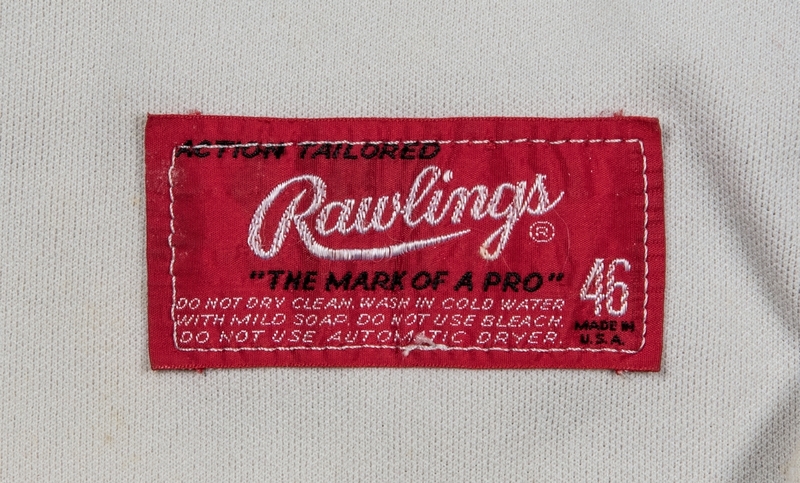 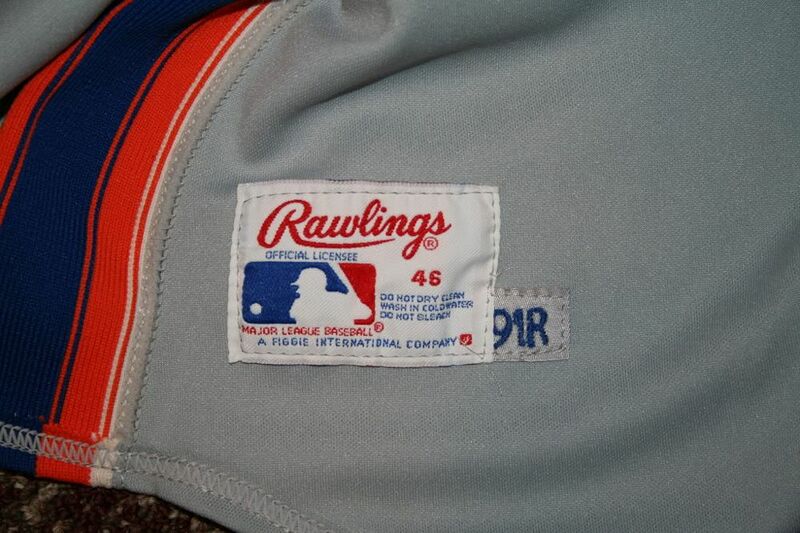 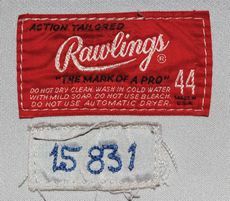 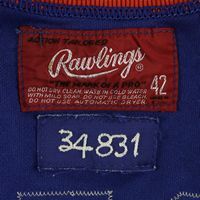 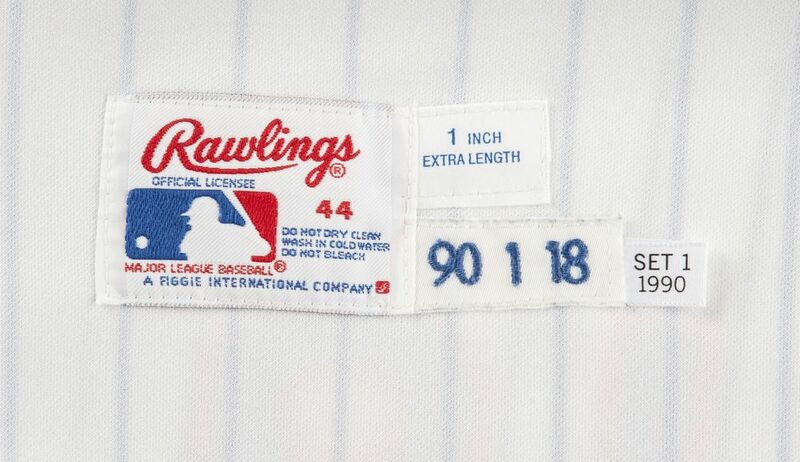 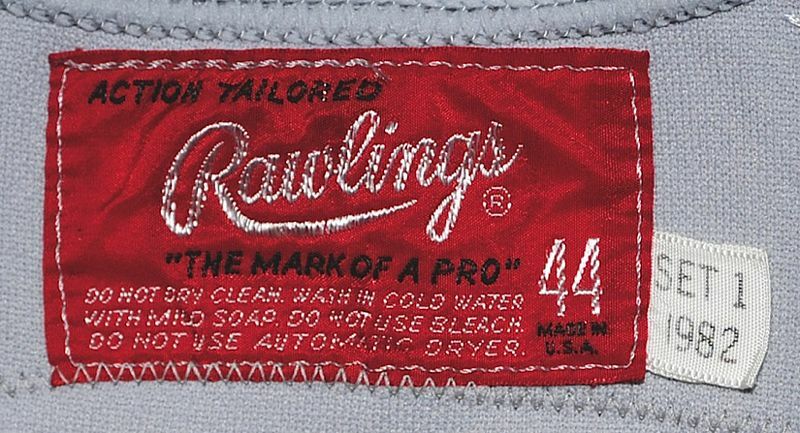 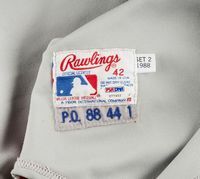 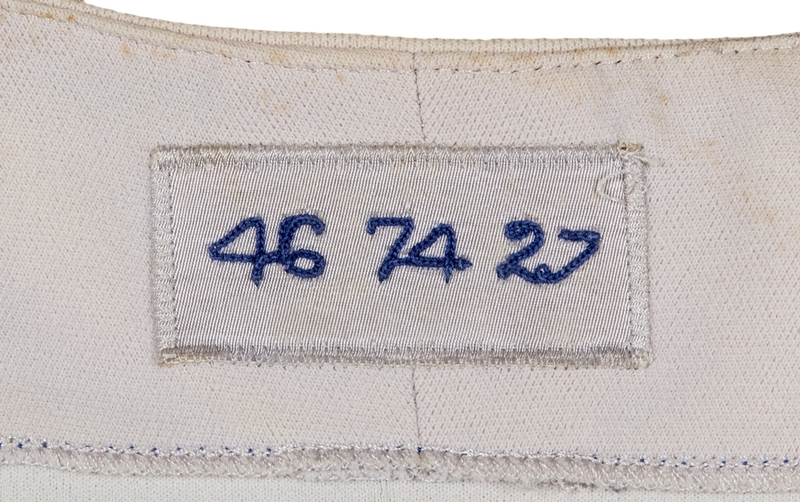 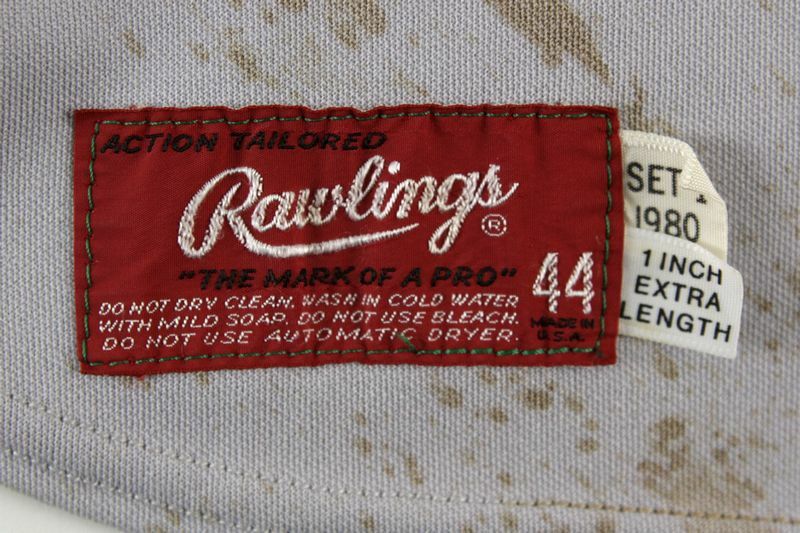 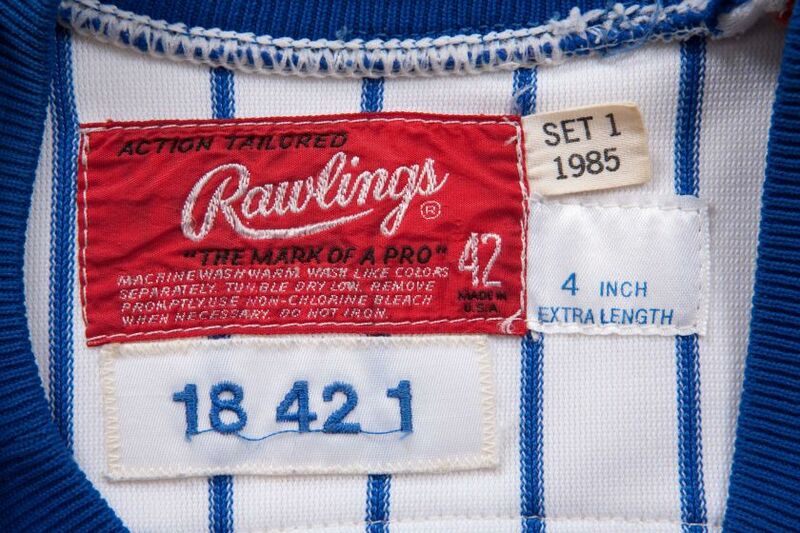 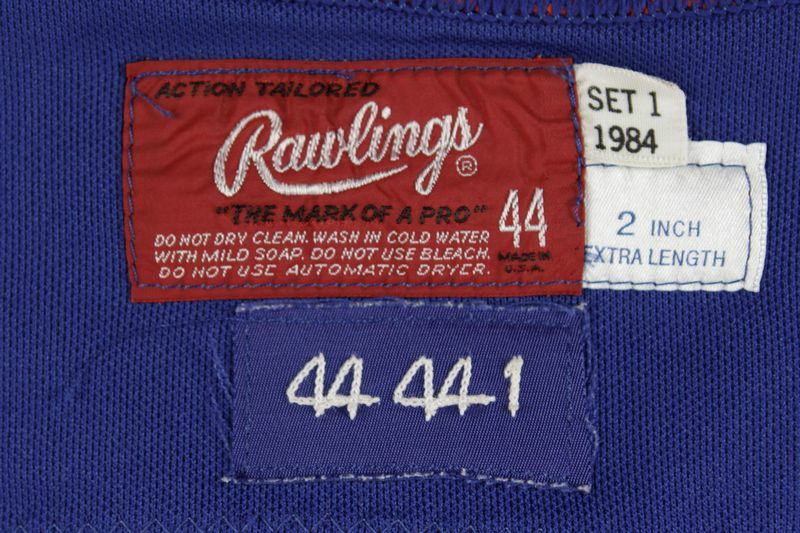 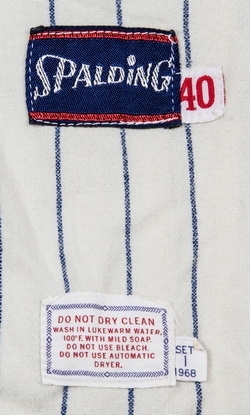 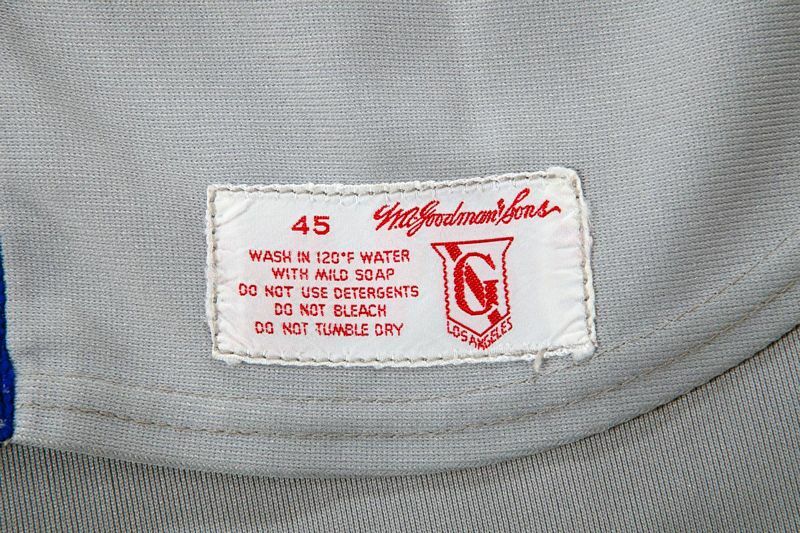 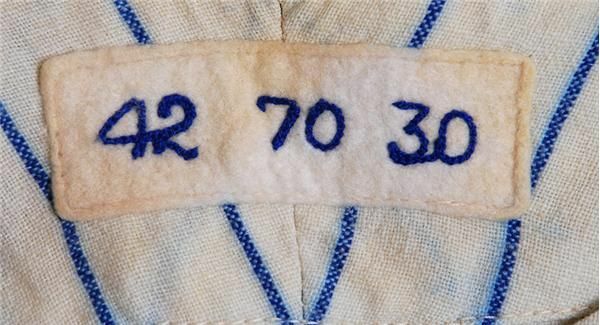 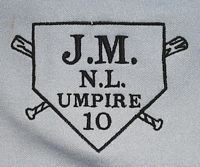 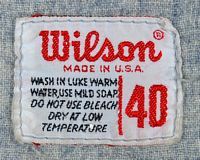 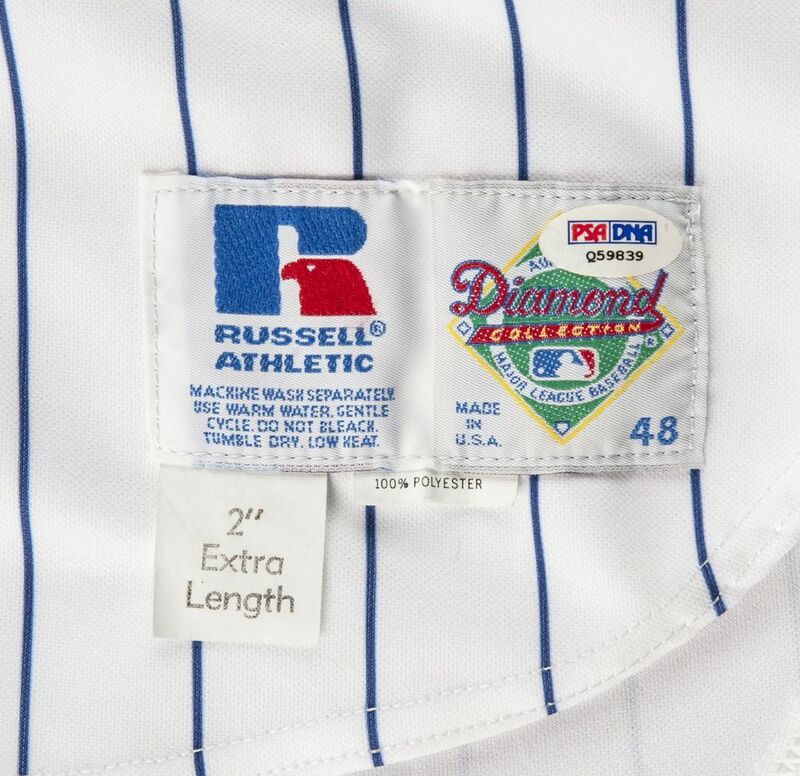 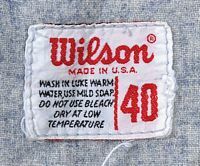 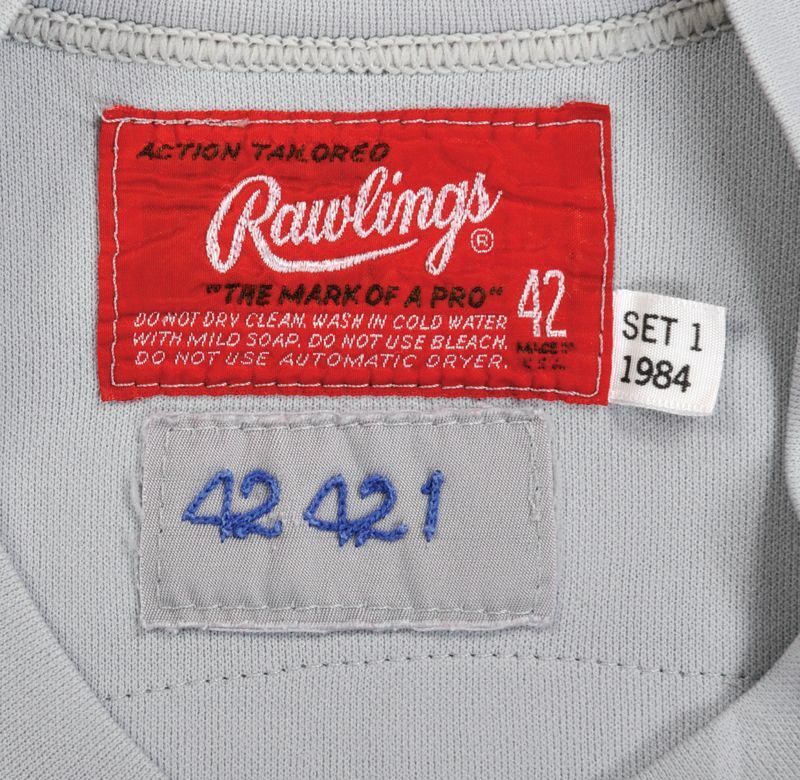 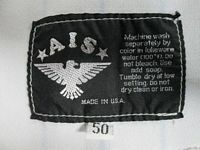 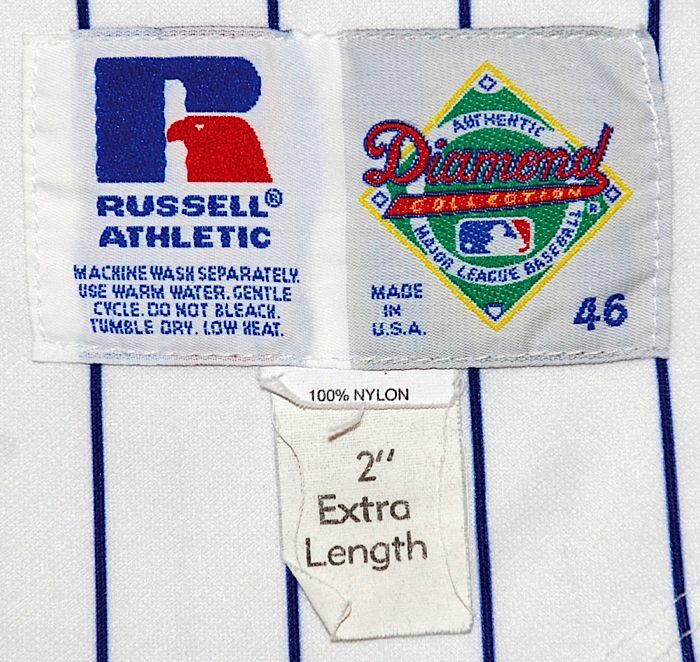 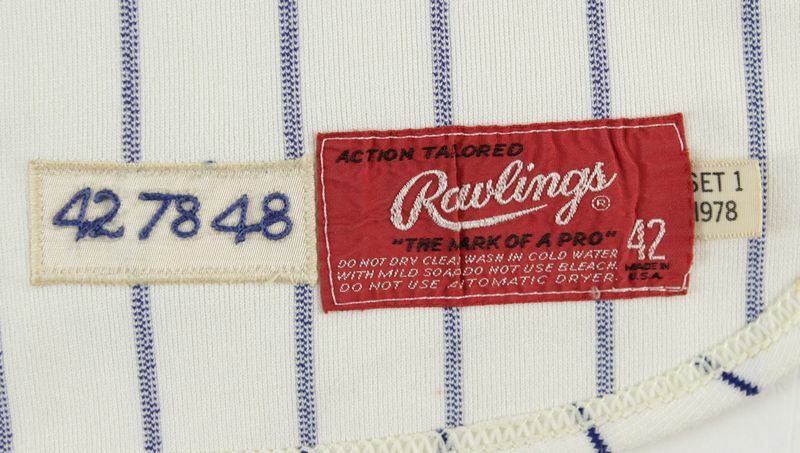 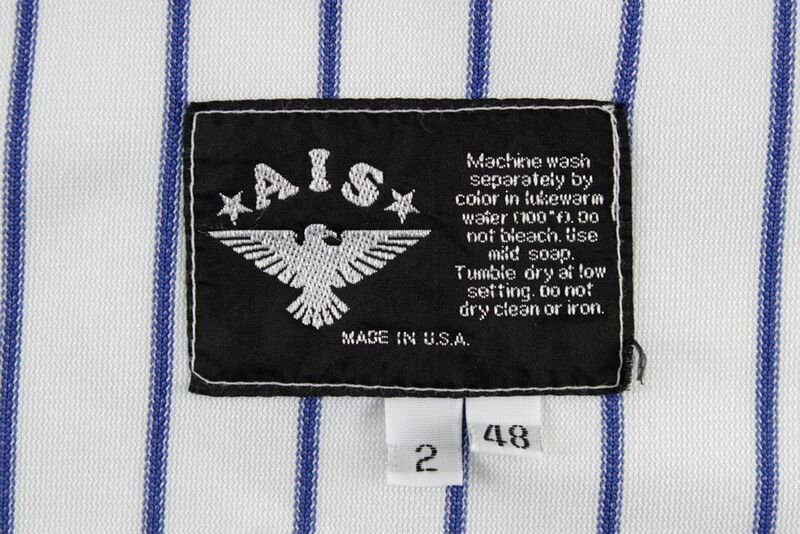 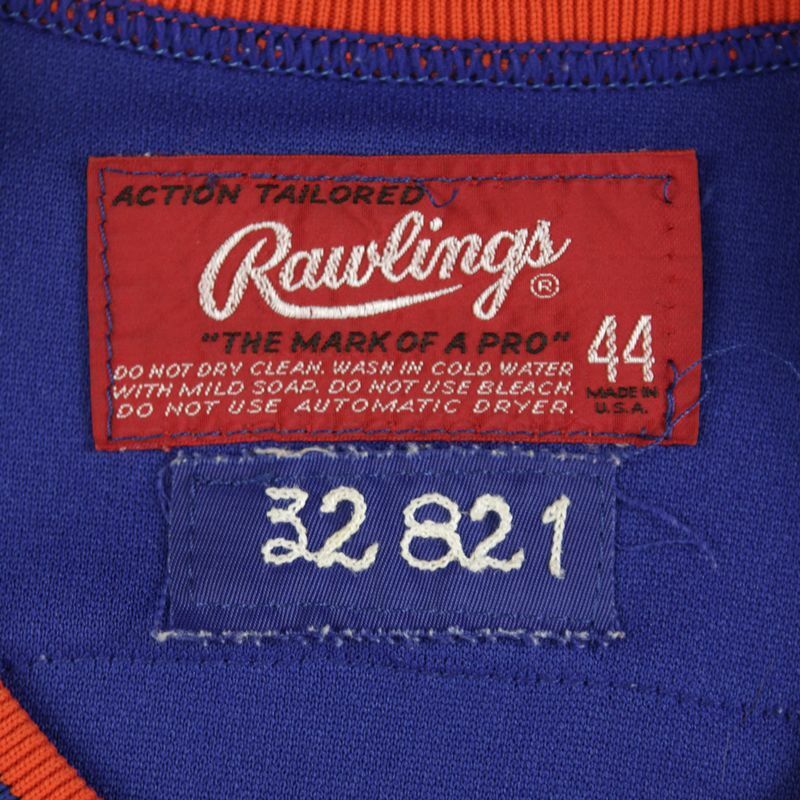 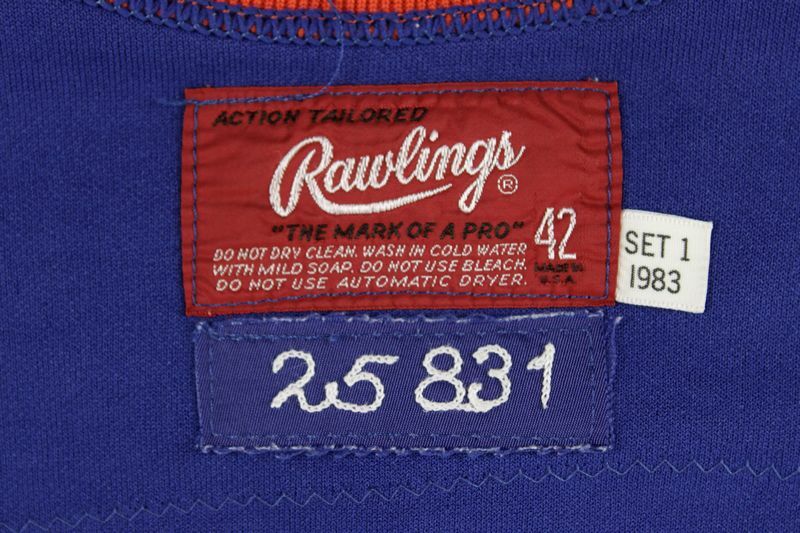 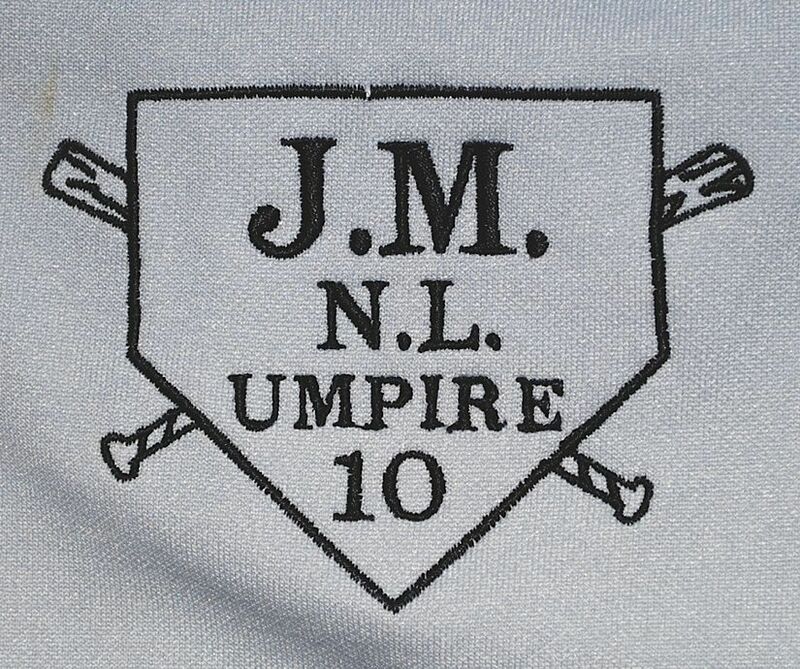 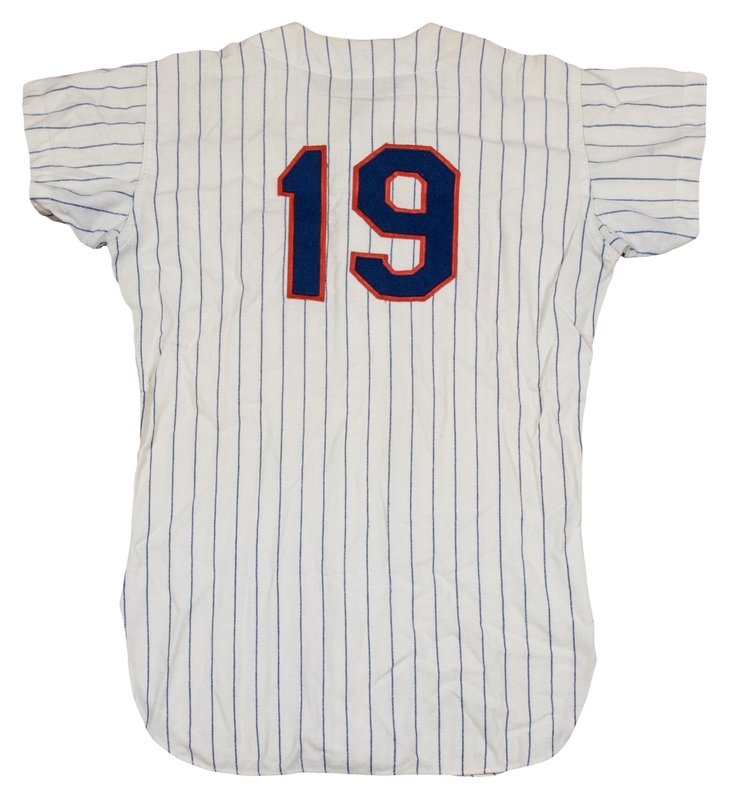 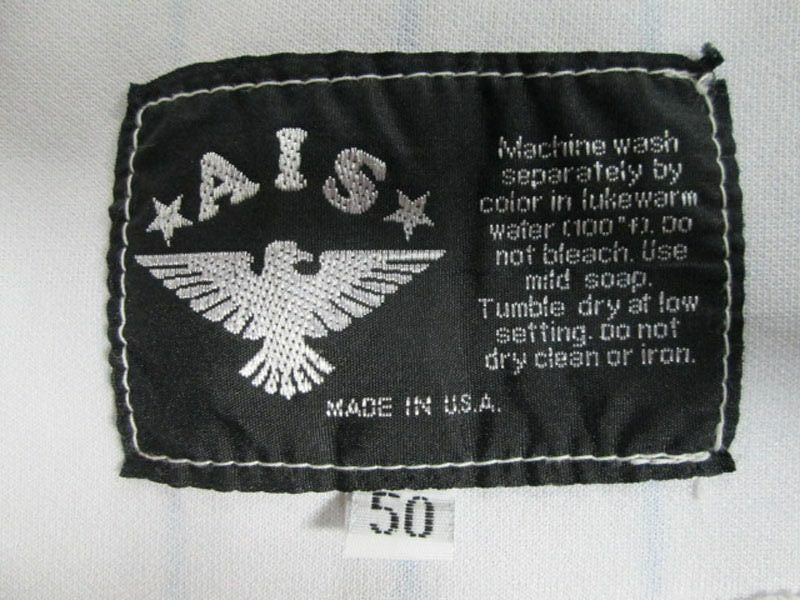 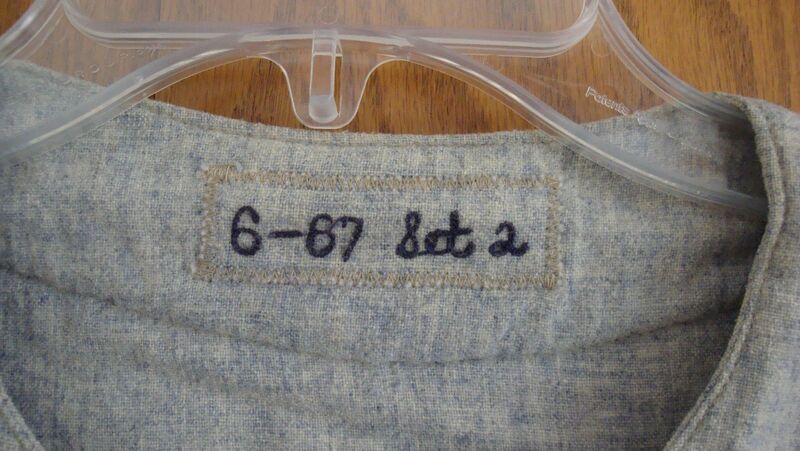 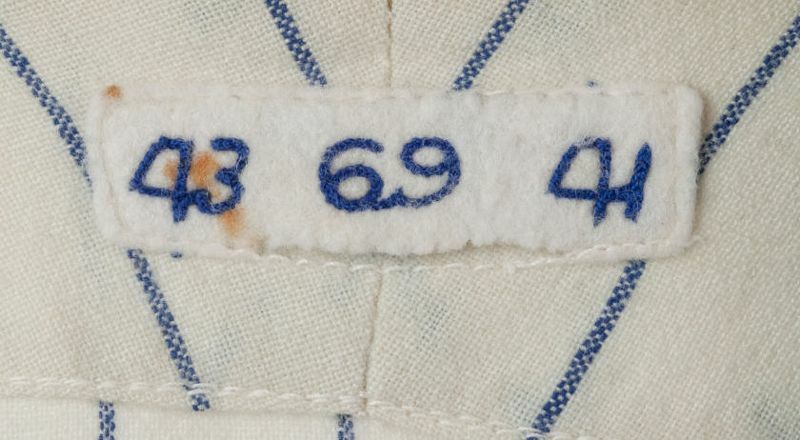 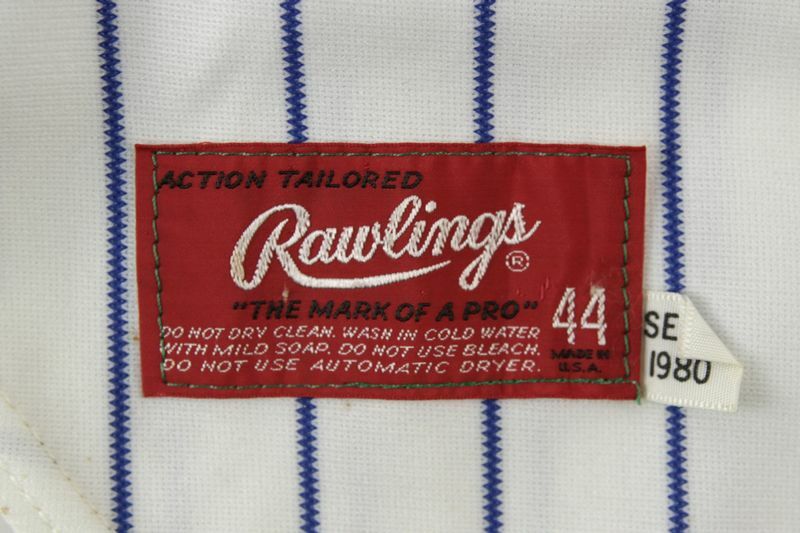 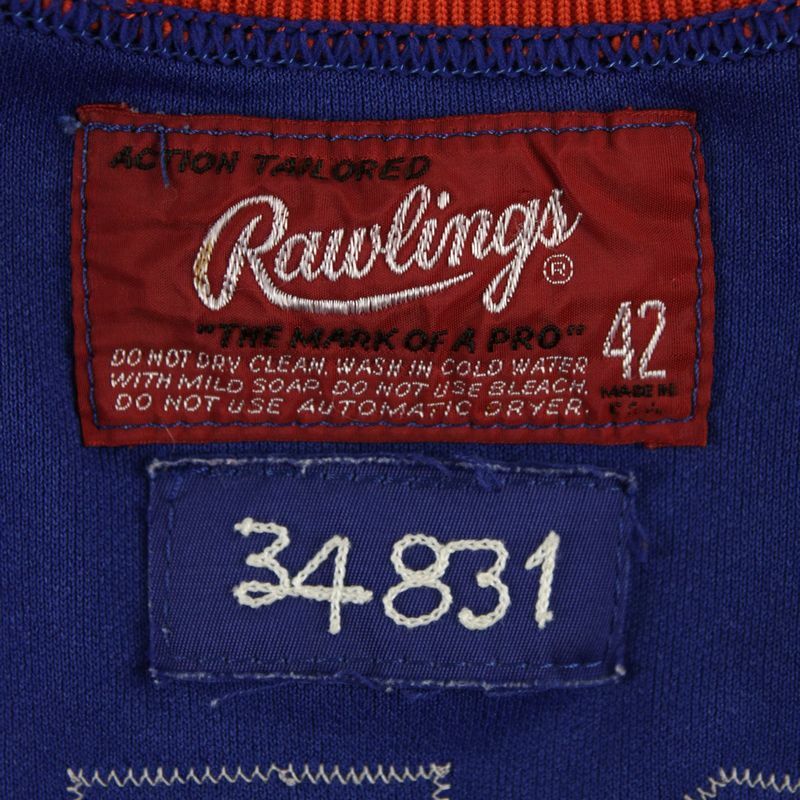 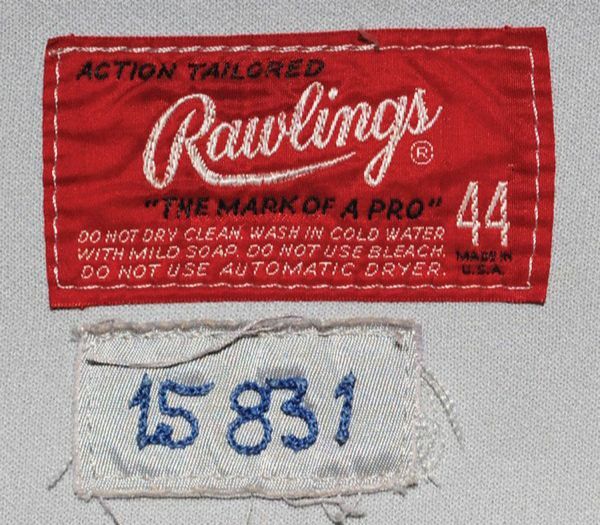 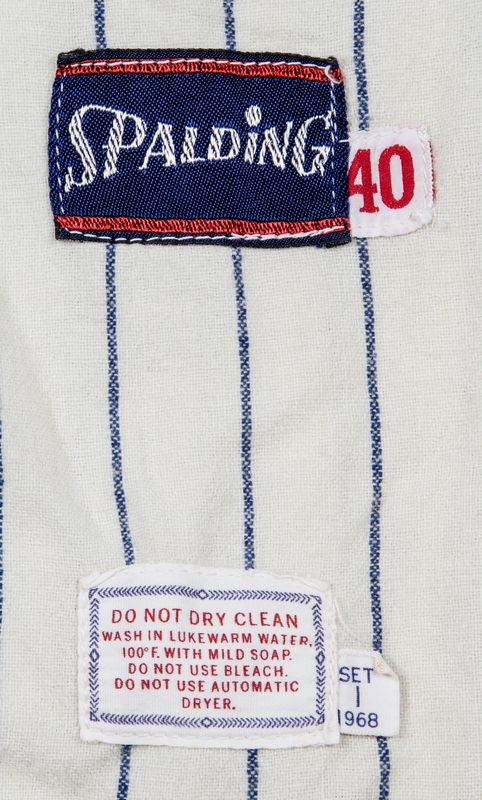 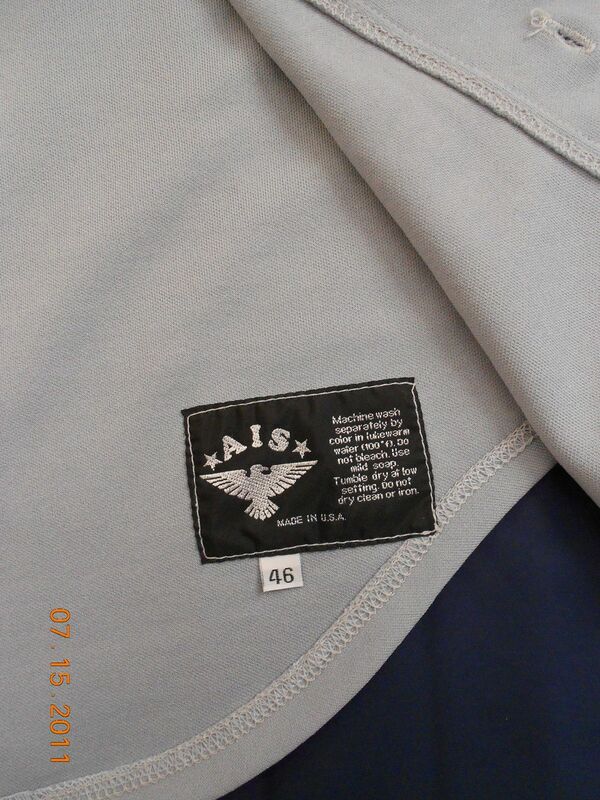 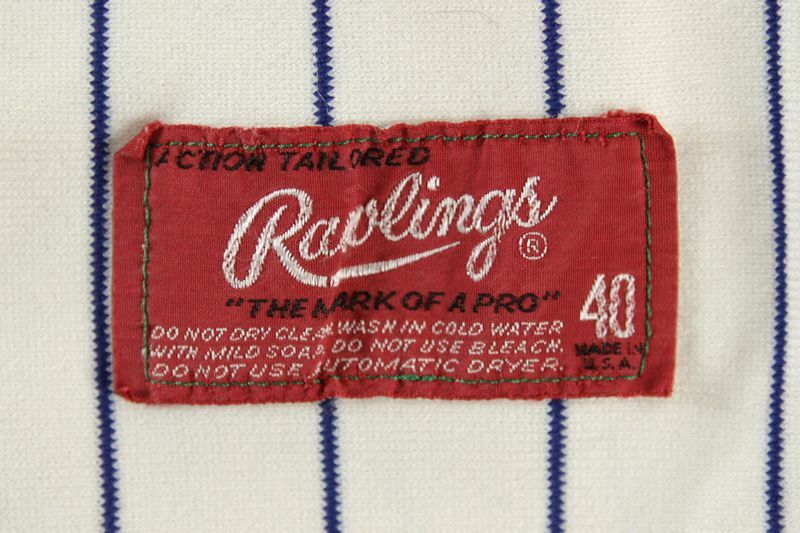 Numbering twill changed to a ribbed style. Road jersey script changes to block letters. 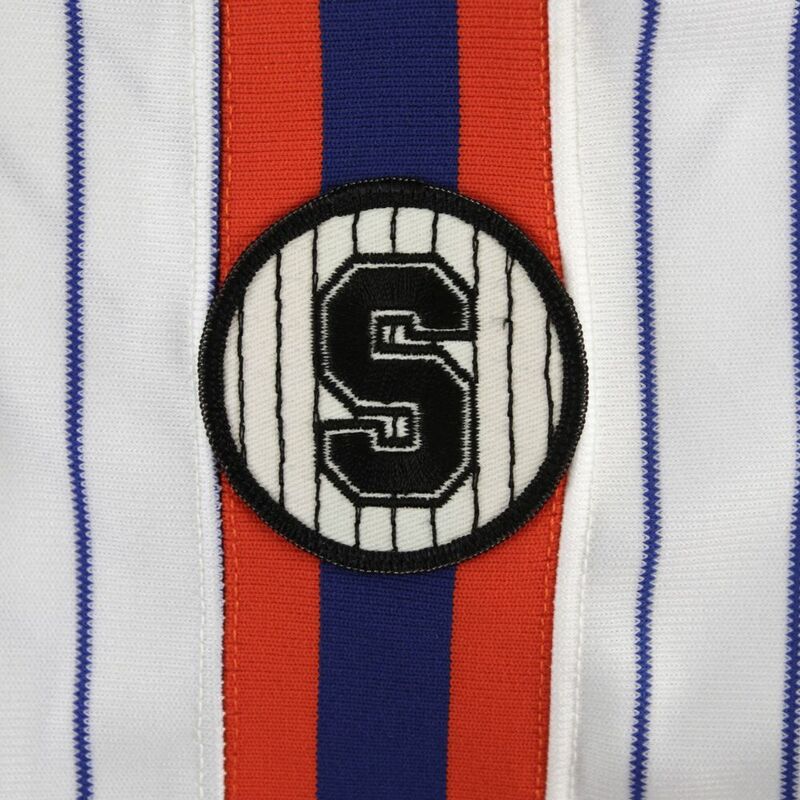 White outline added to road jersey lettering. 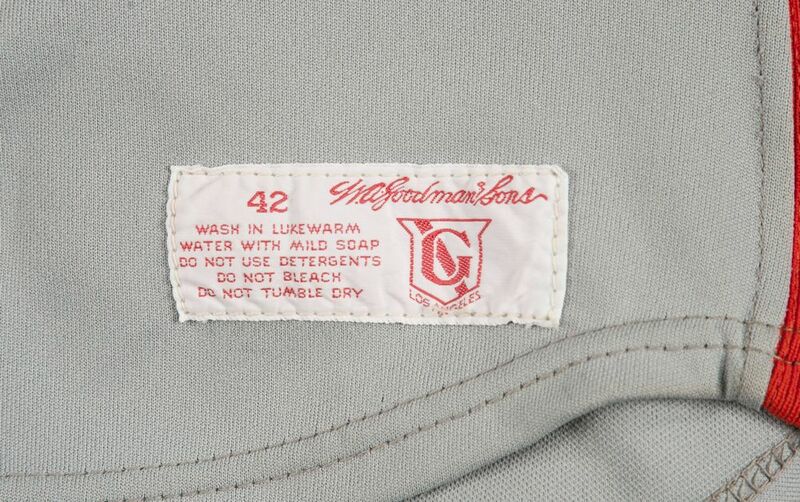 Pullovers give way to button downs. 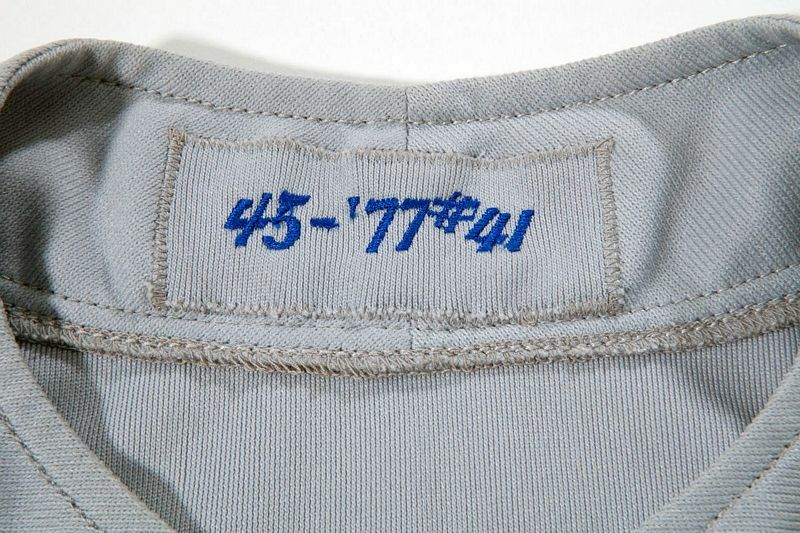 Blue collars dropped. 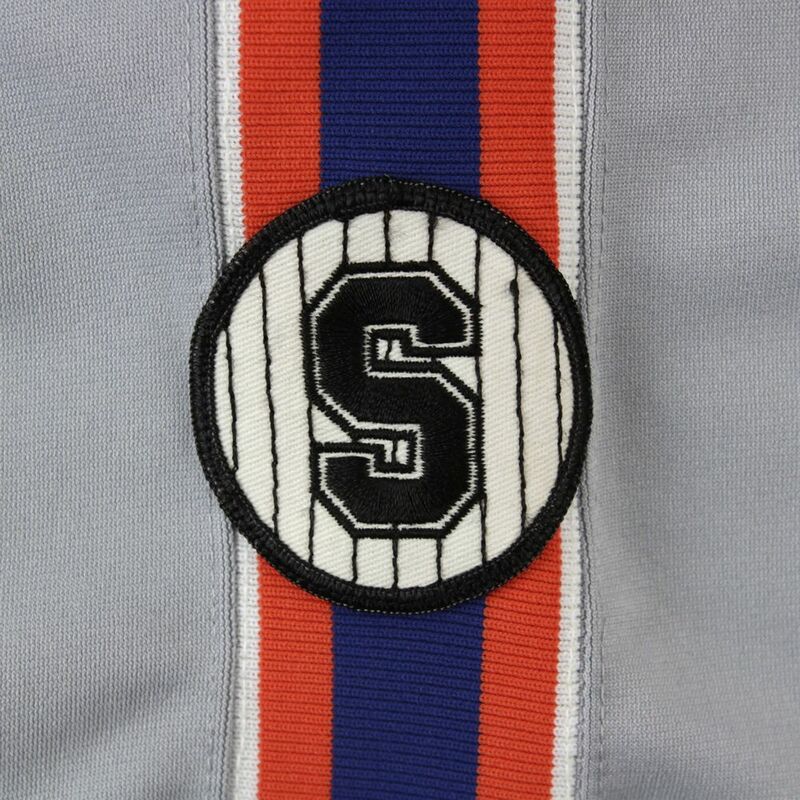 White outline is now added to home jersey lettering as well. 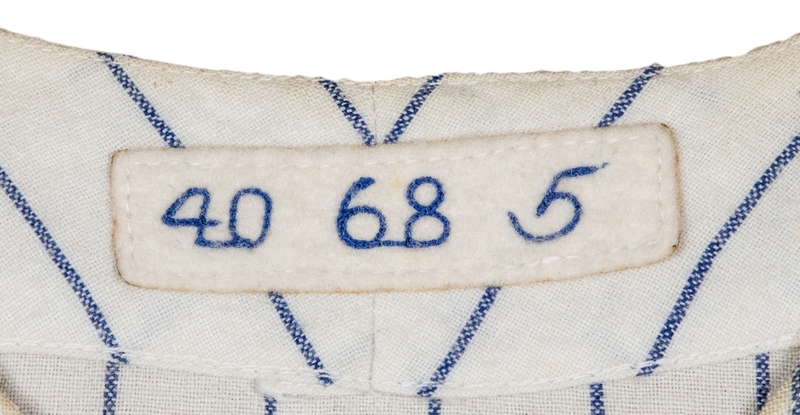 Road jersey block letters change back to script, and both home and road scripts are underlined. 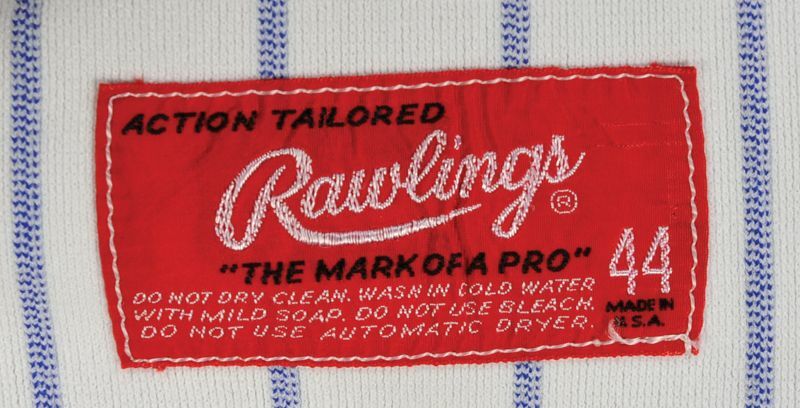 Racing stripes removed. 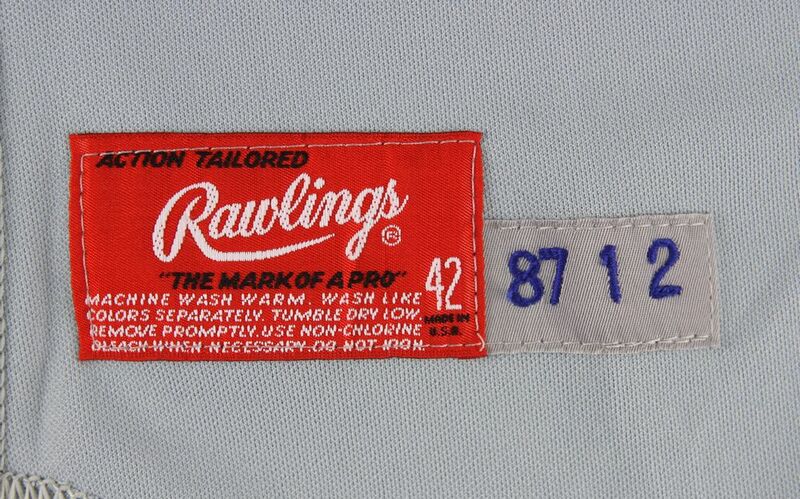 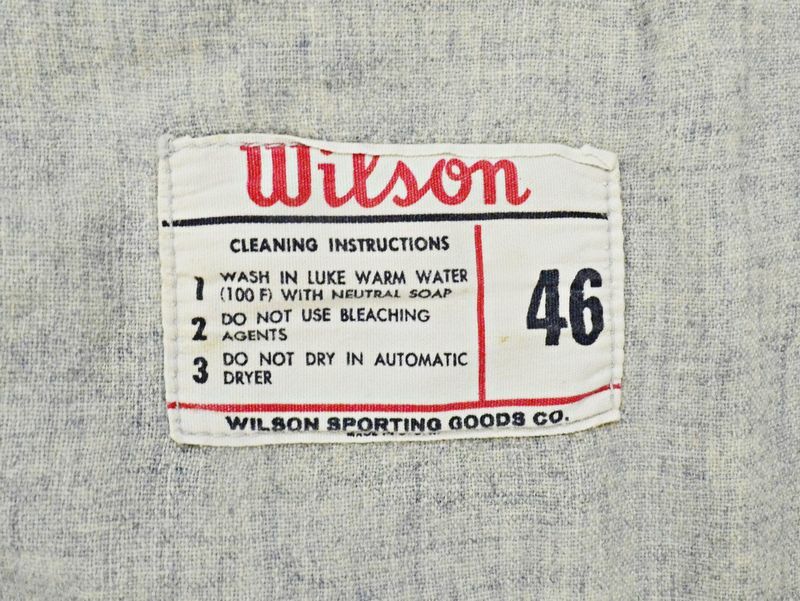 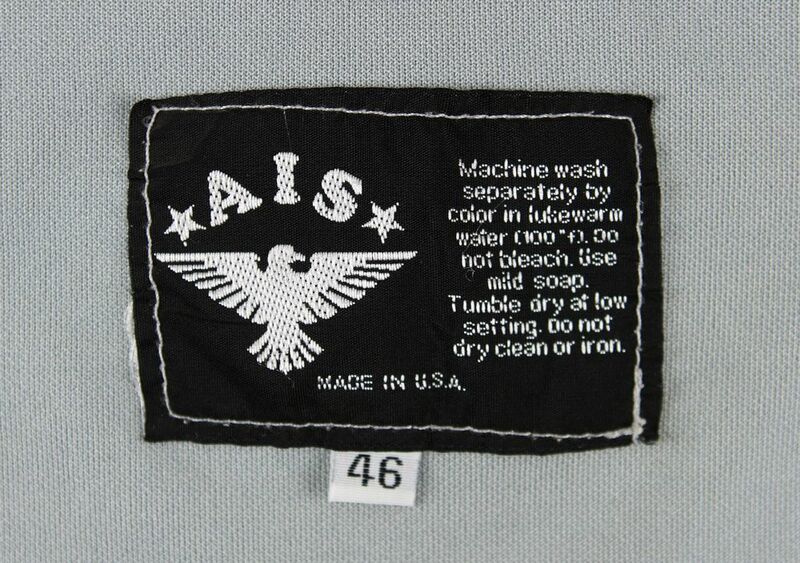 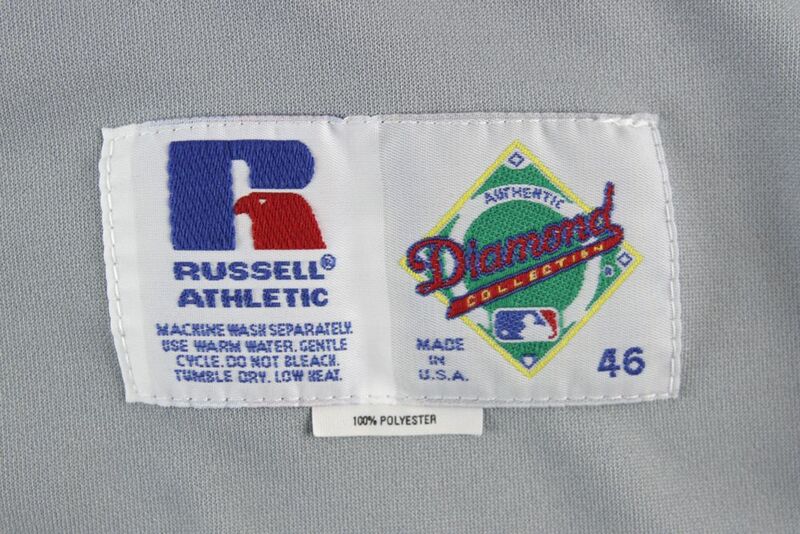 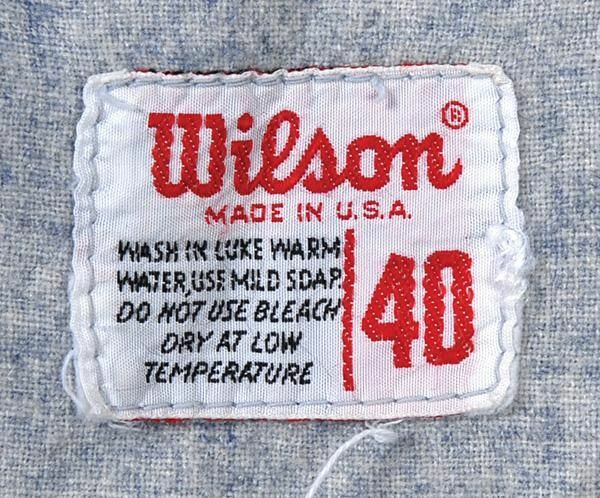 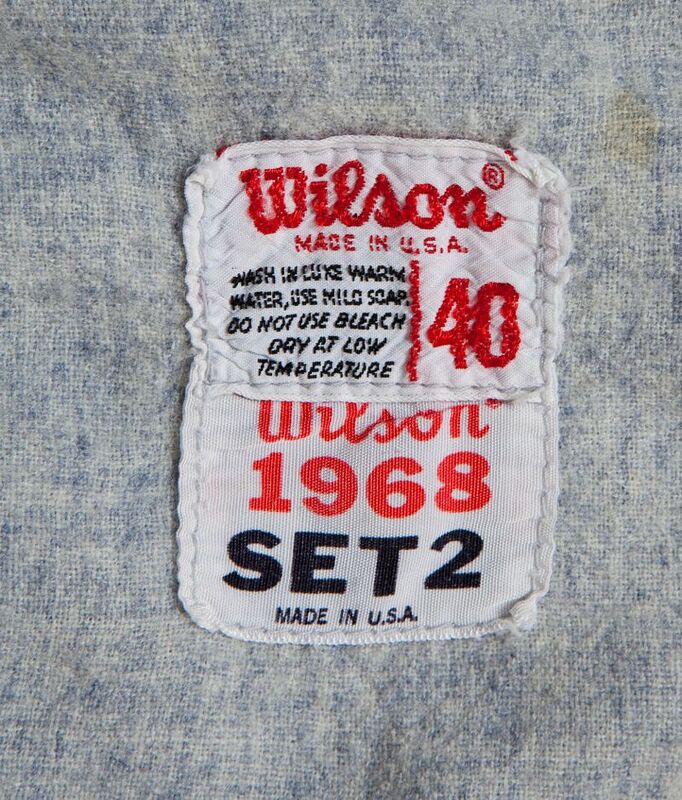 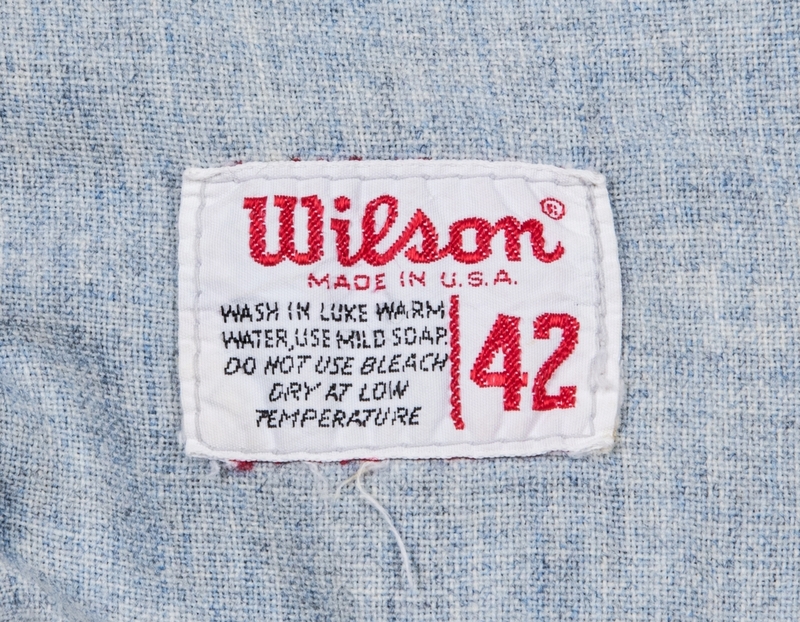 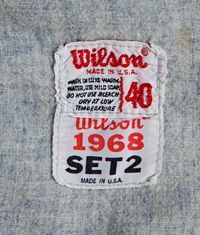 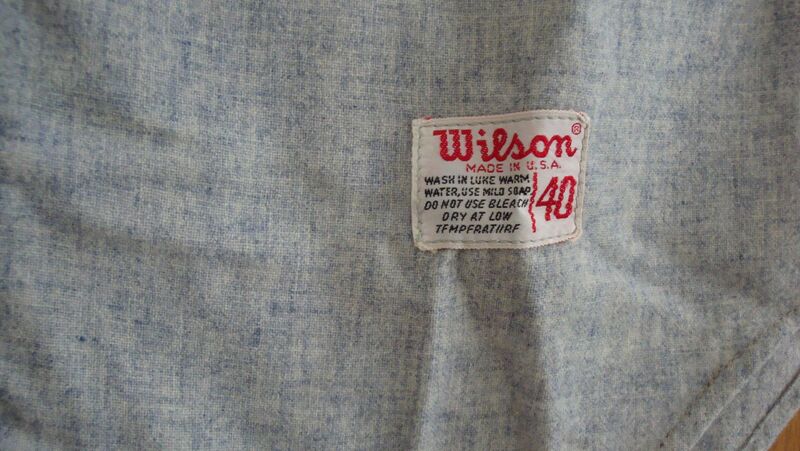 Blue color darkened slightly and ribbed twill lettering goes back to regular smooth style. 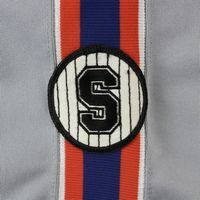 Sleeve trim added to road jersey. 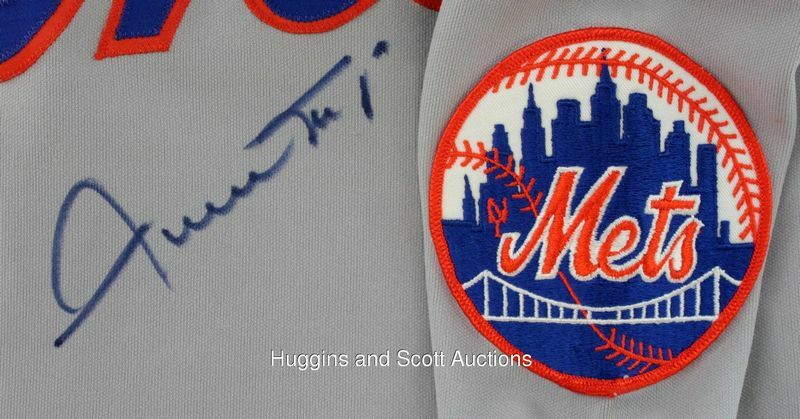 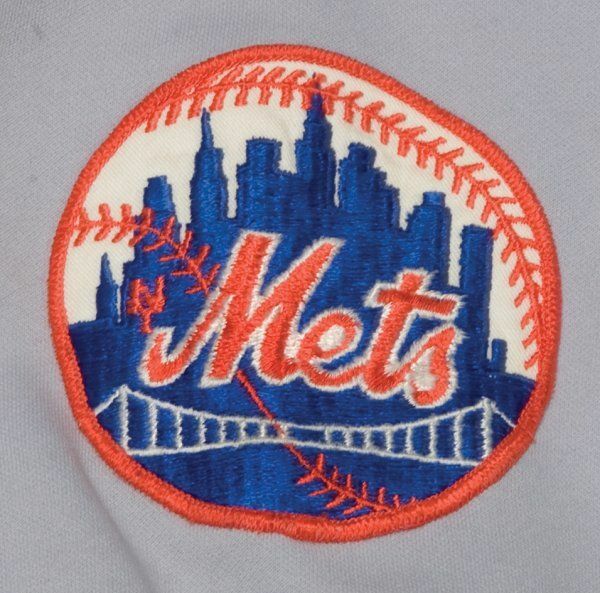 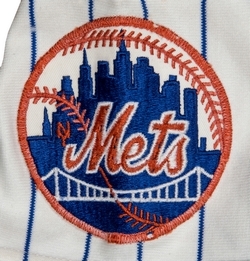 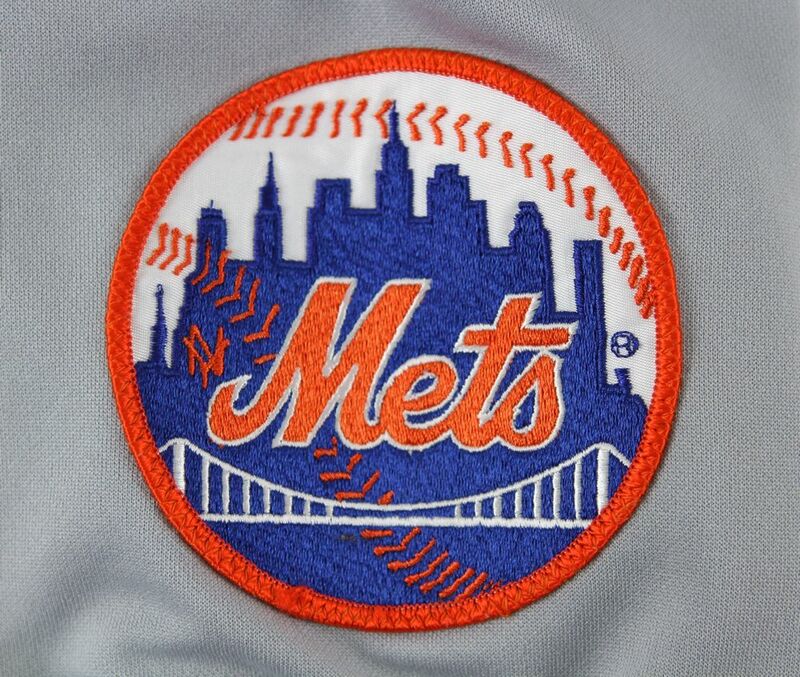 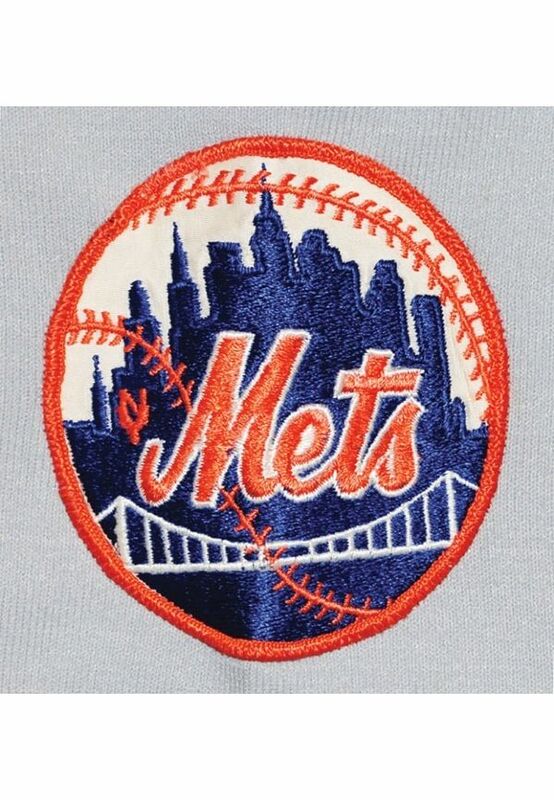 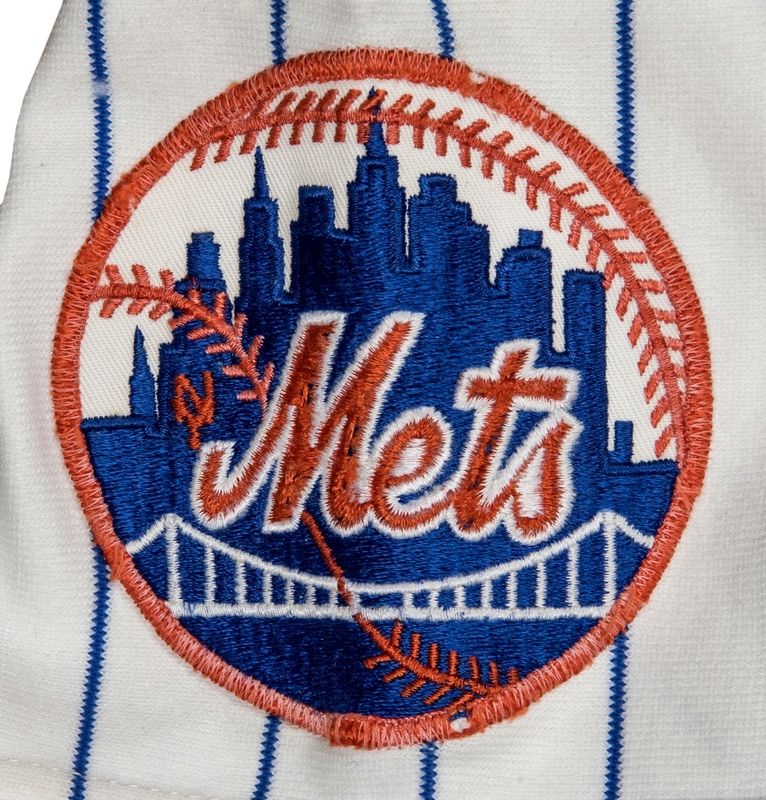 Mets skyline sleeve patch returns. 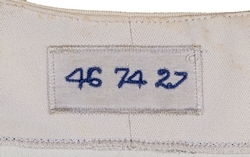 Sleeve trim removed from road jersey, and front number added. 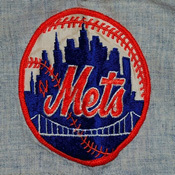 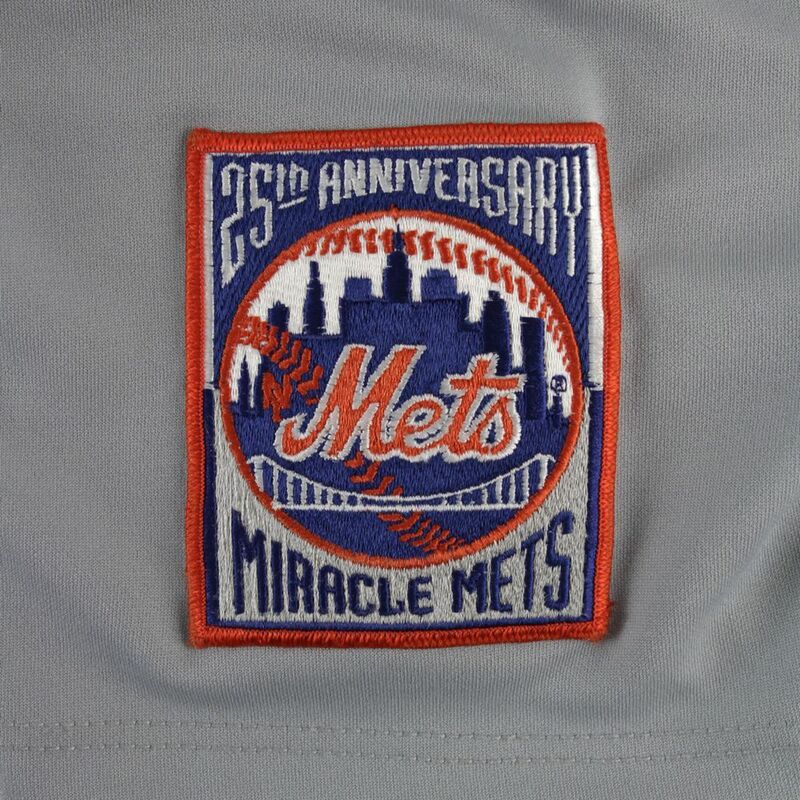 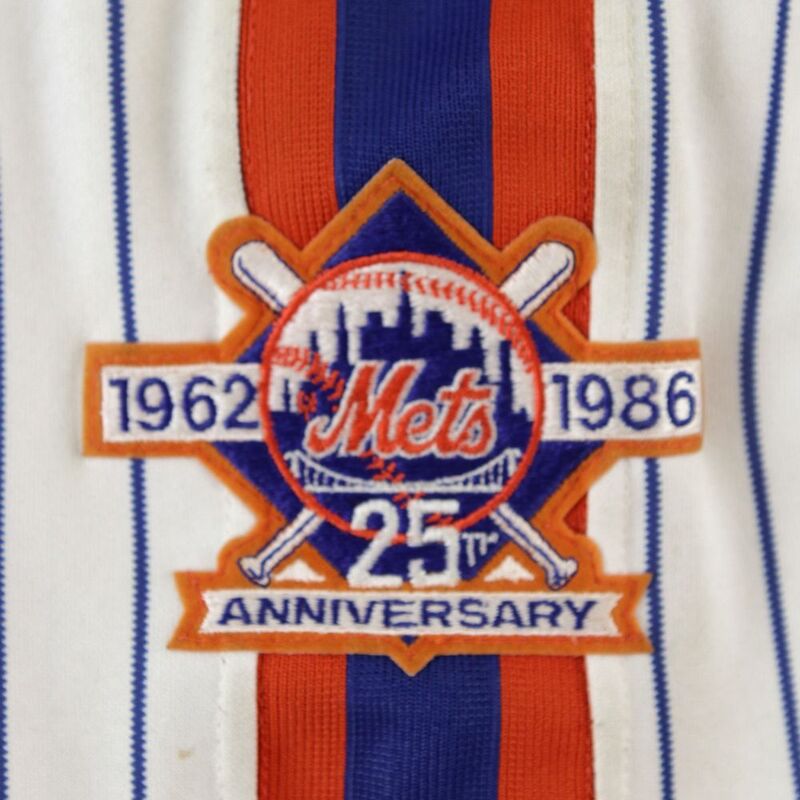 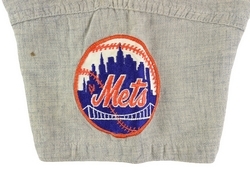 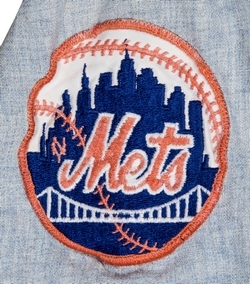 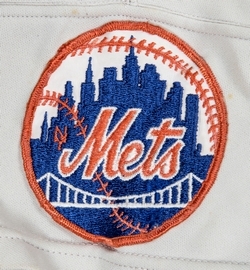 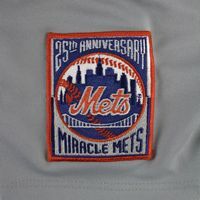 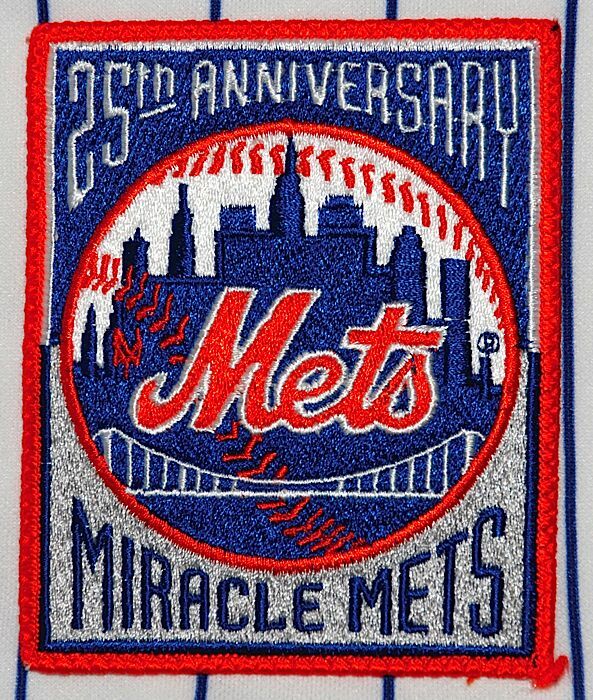 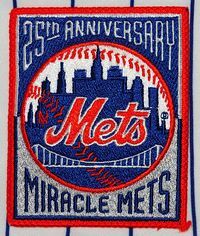 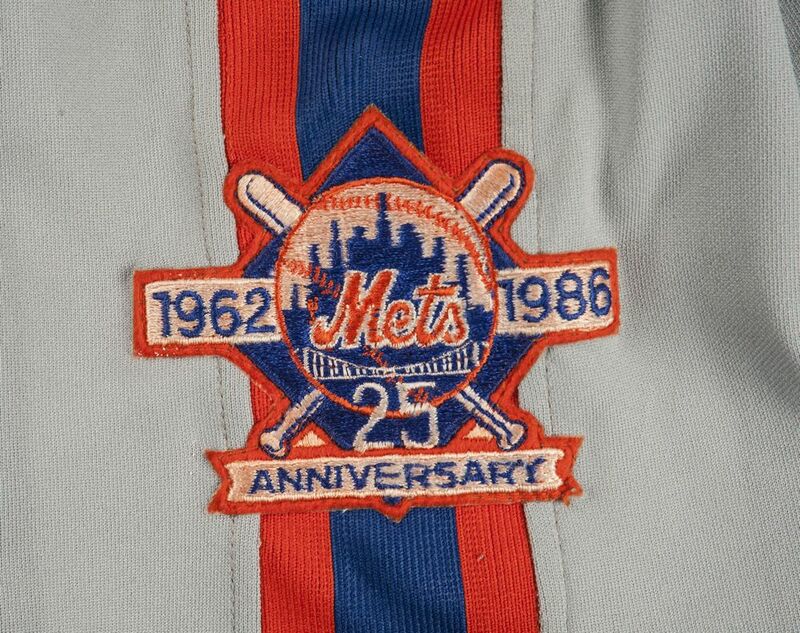 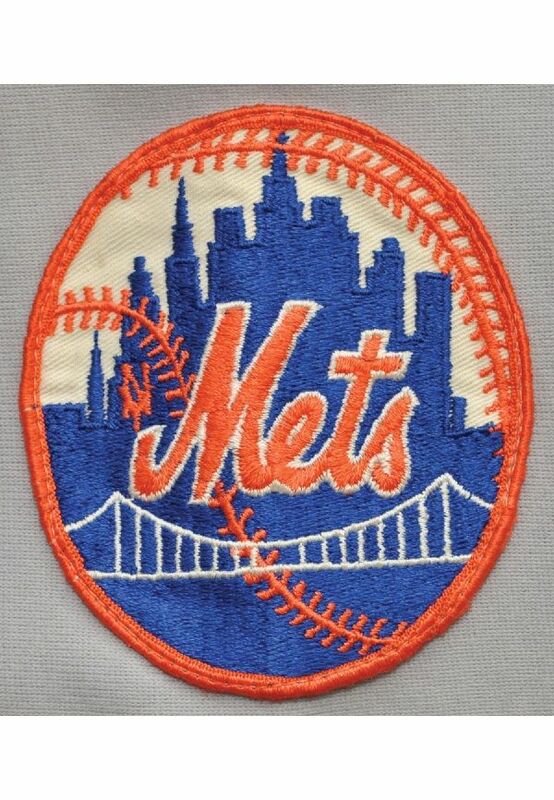 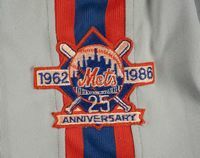 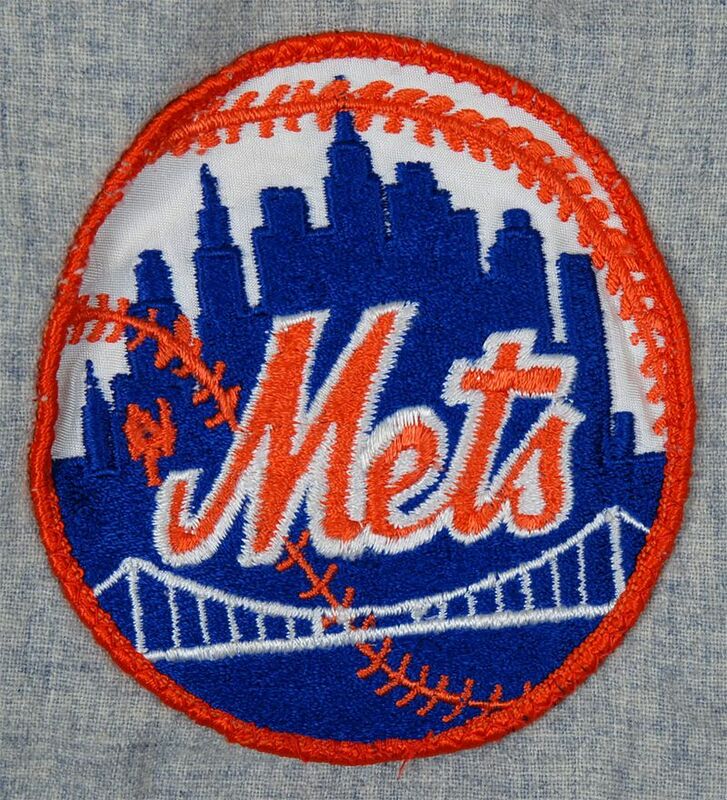 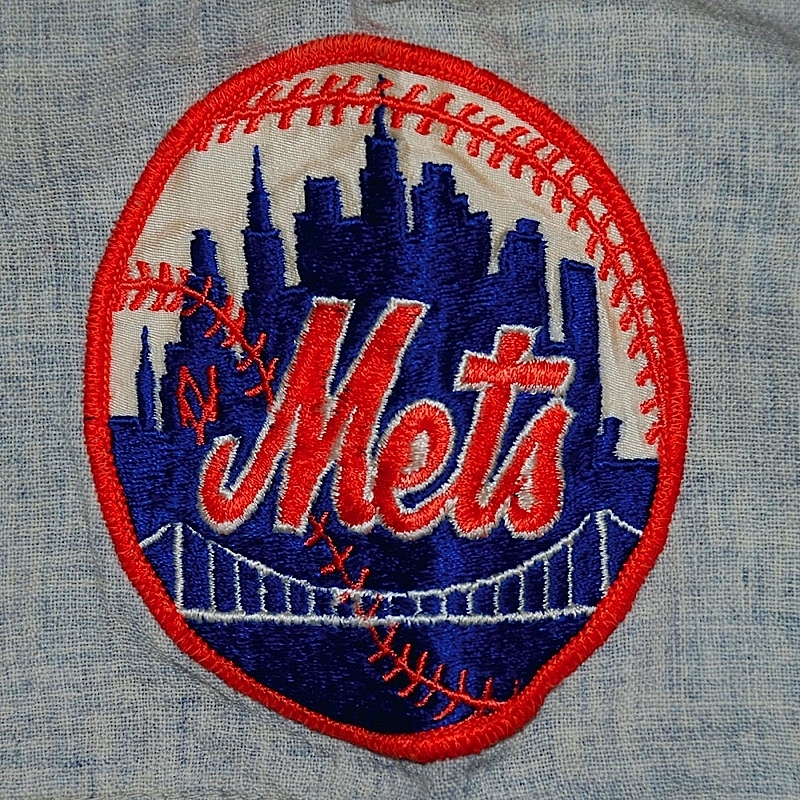 Sleeve patch modified for Miracle Mets anniversary. 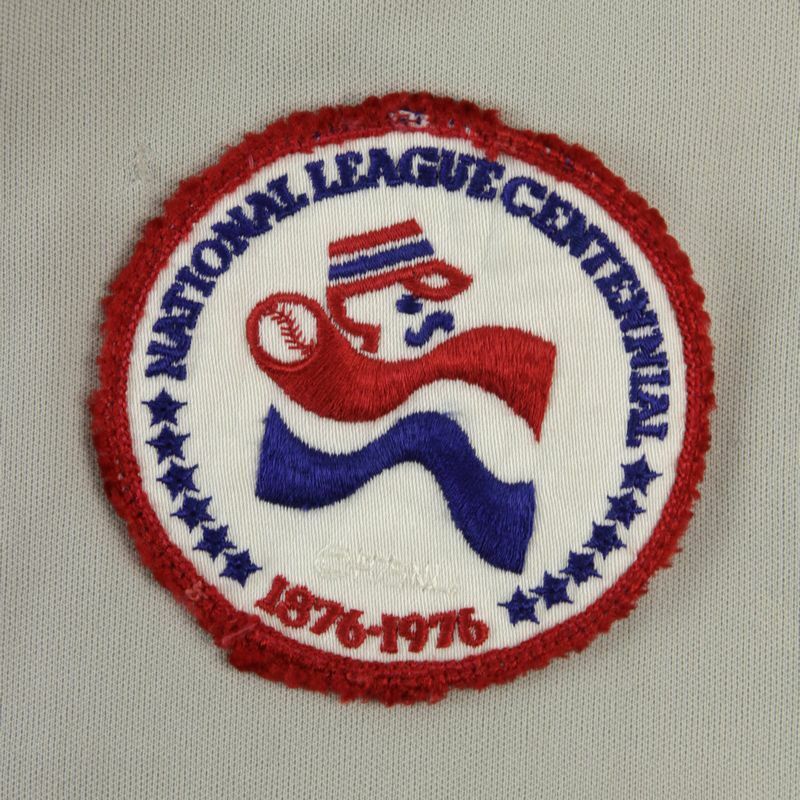 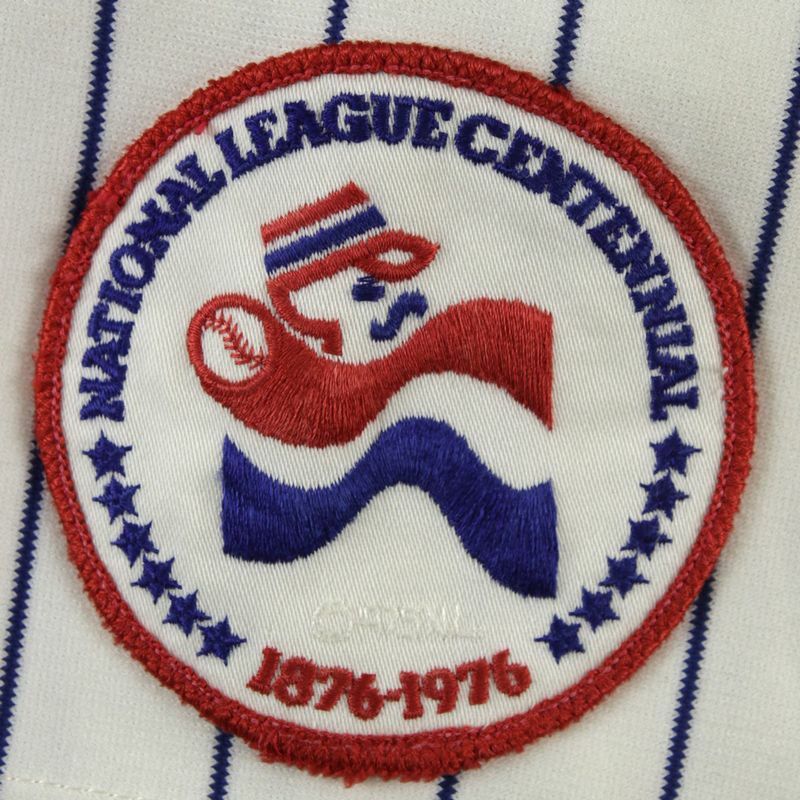 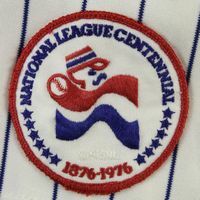 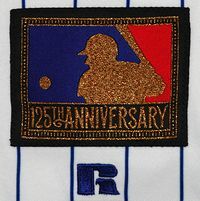 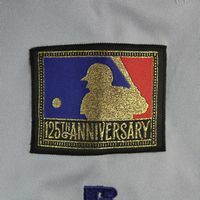 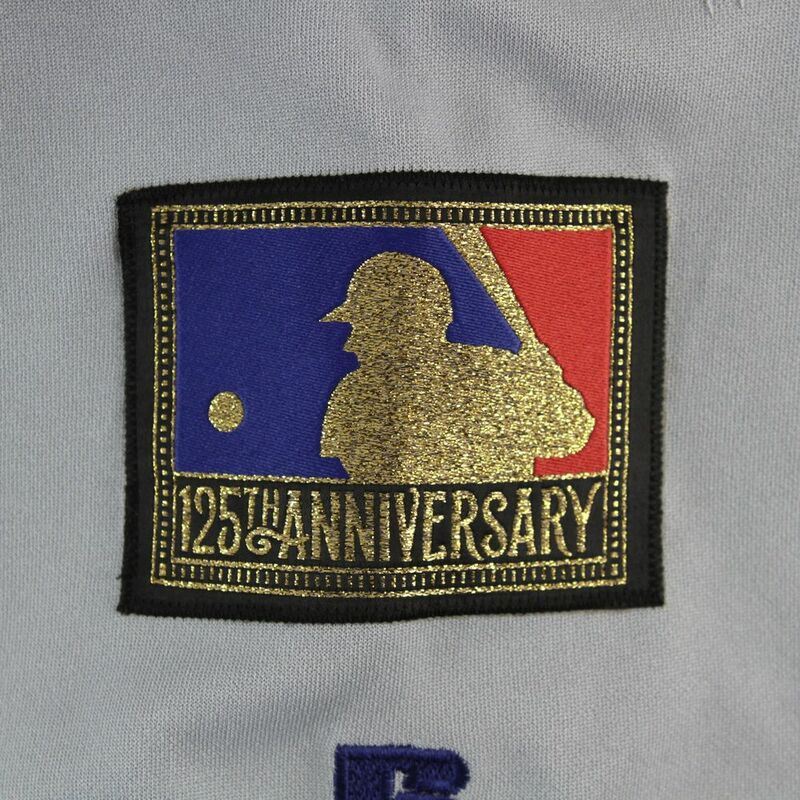 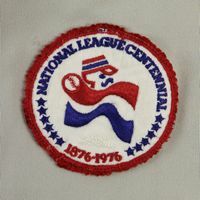 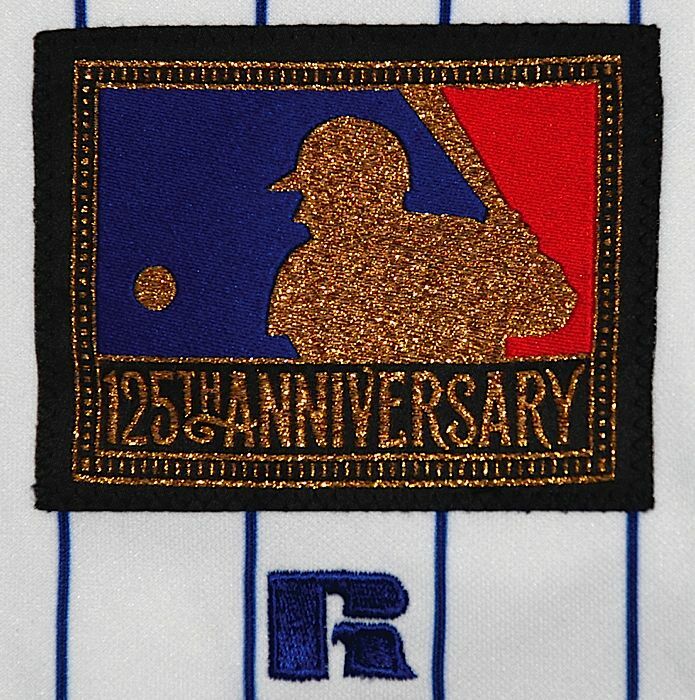 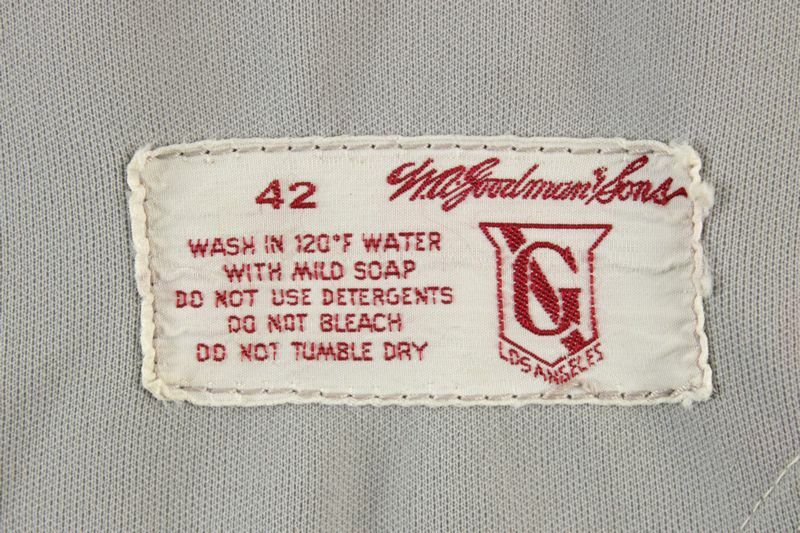 MLB 125th anniversary patch on other sleeve. 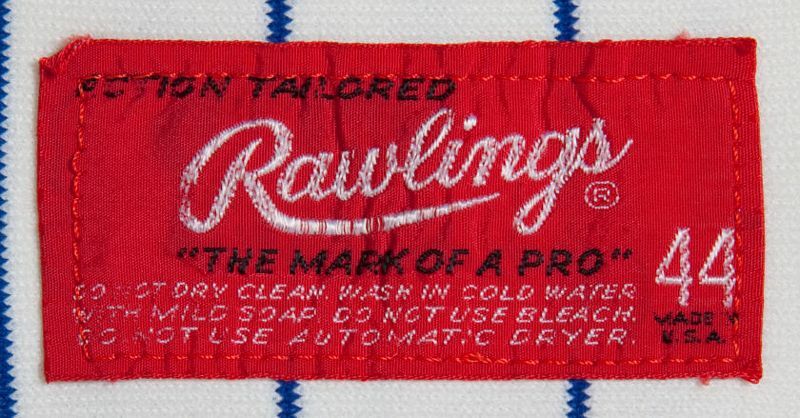 Underline dropped from script. 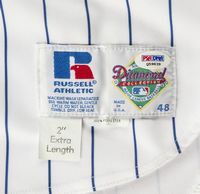 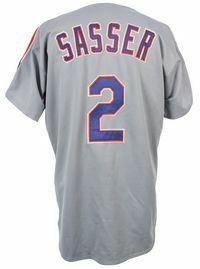 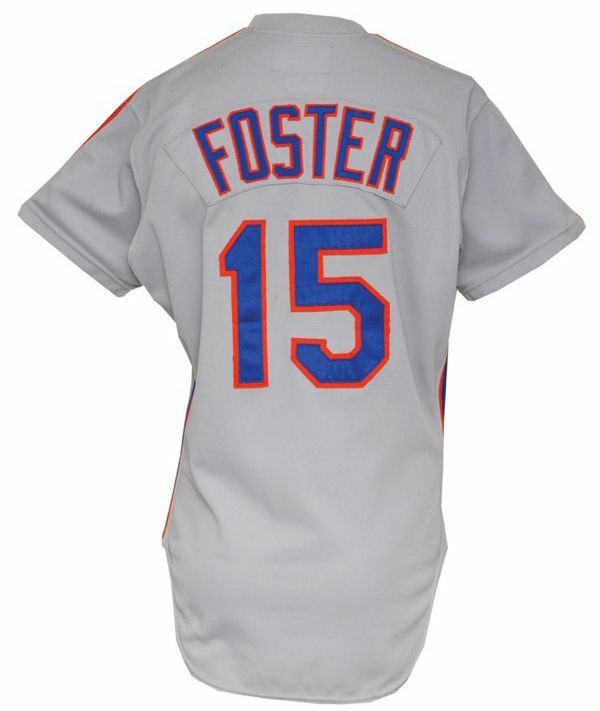 Road jersey returns to tuscan font and blue piping, and white outlines removed from road jersey lettering. 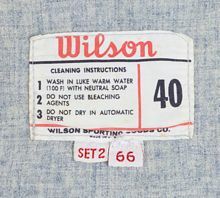 Blue color returns to its original shade. 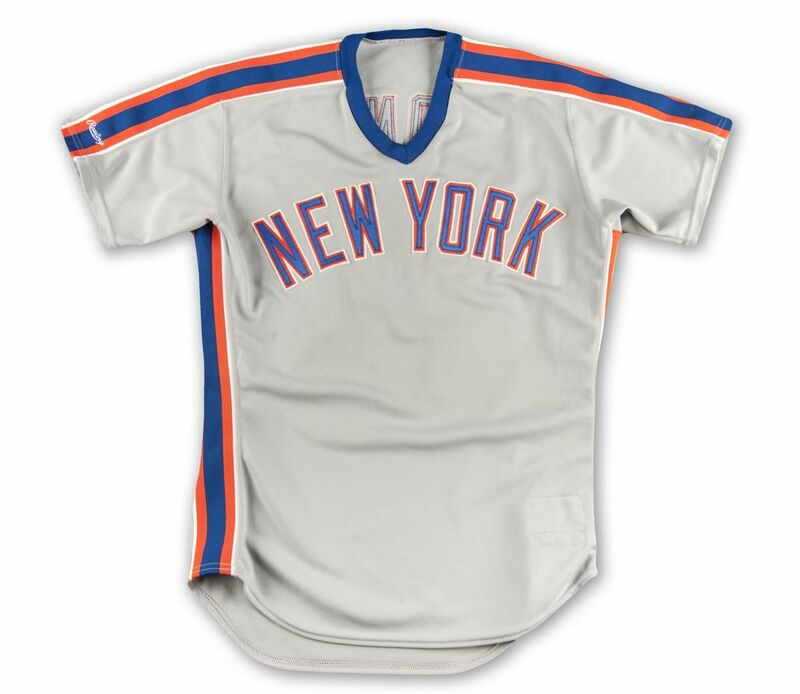 It's the 1965 look except for the additional piping on road jersey sleeves.